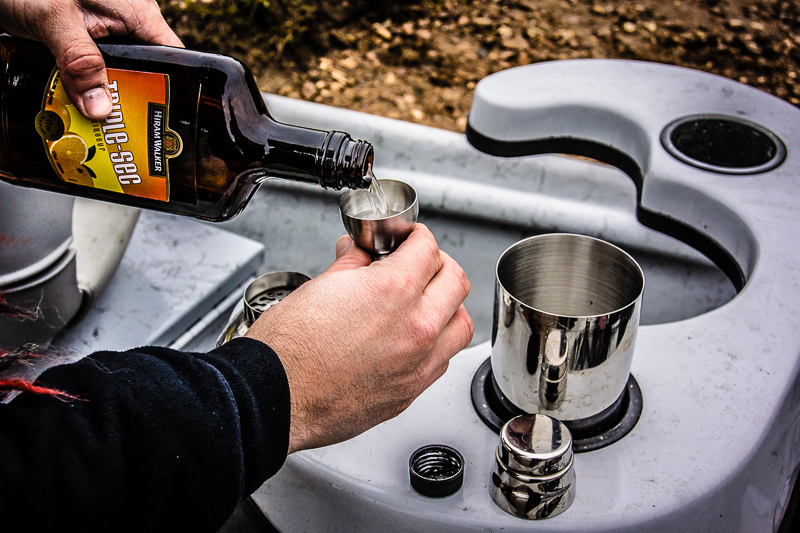 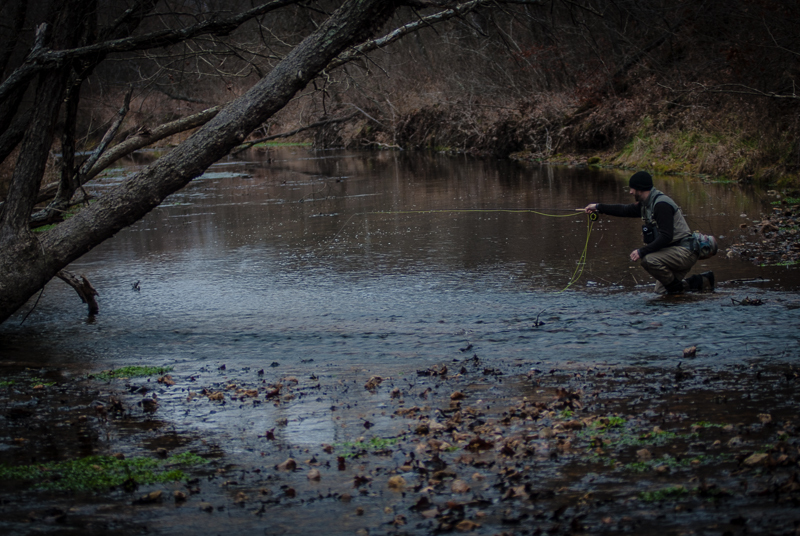 A day trip to the North Fork of the White River is always a blur. 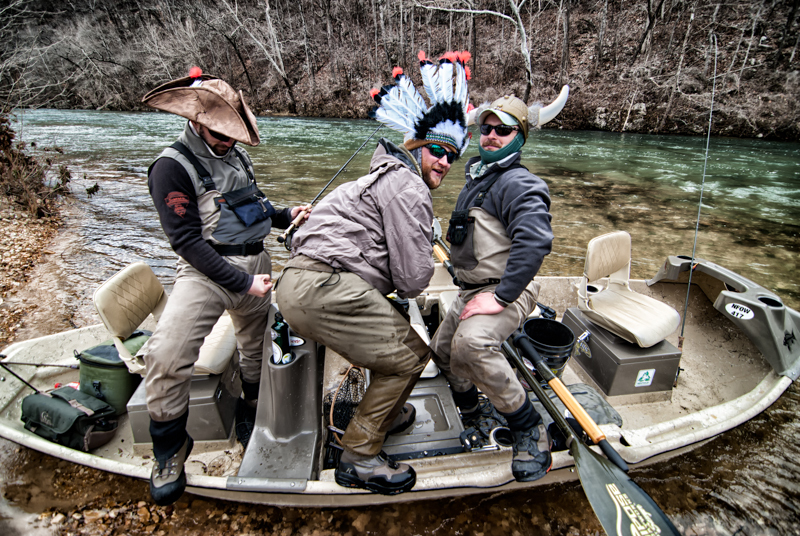 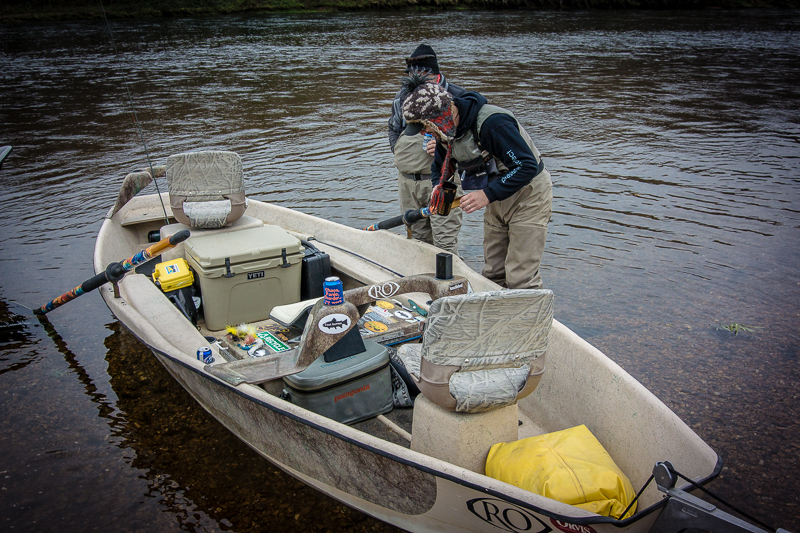 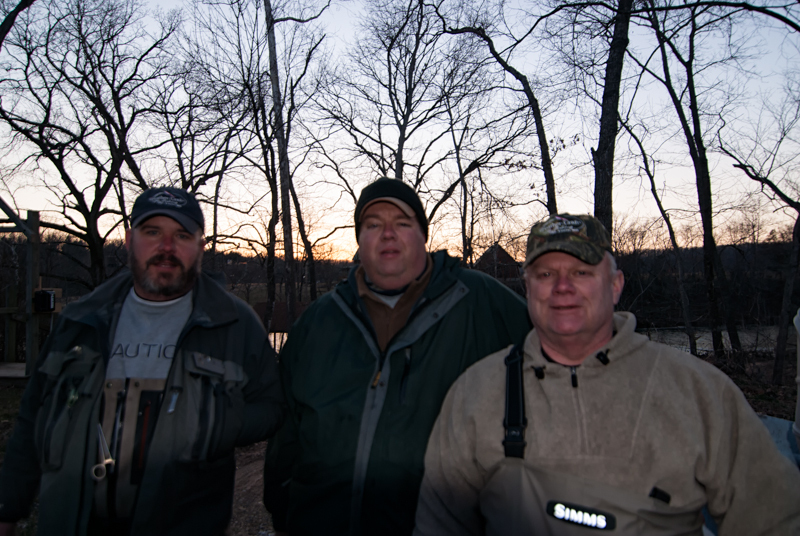 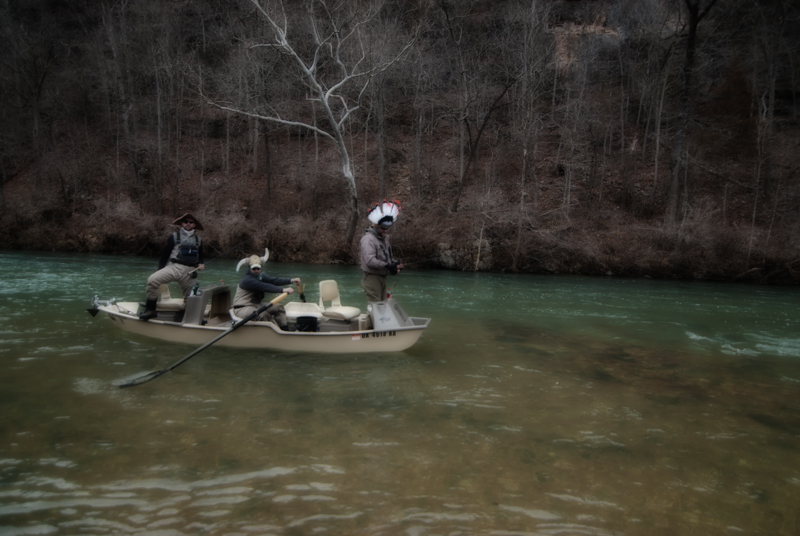 We rolled out of my driveway at 2am to pick Dan Ritter up on the way for a quick day float with the Chasing the Dream Crew from Oklahoma and Brian Wise of Fly Fishing The Ozarks. 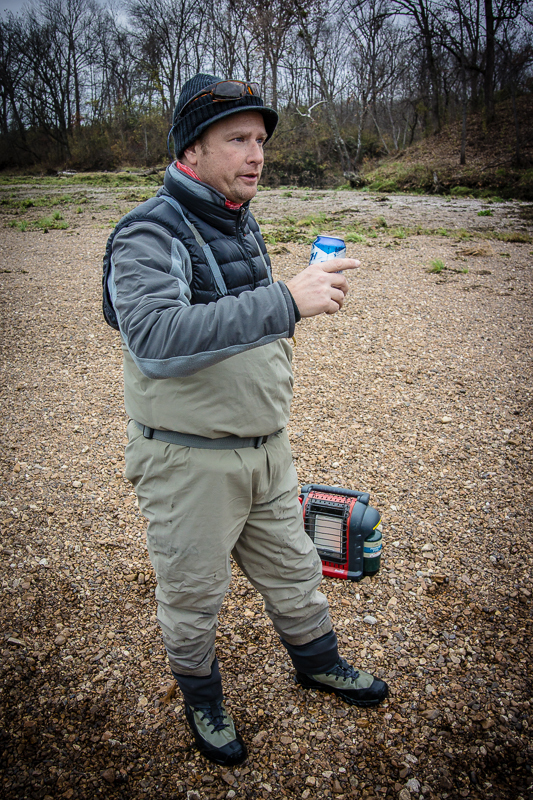 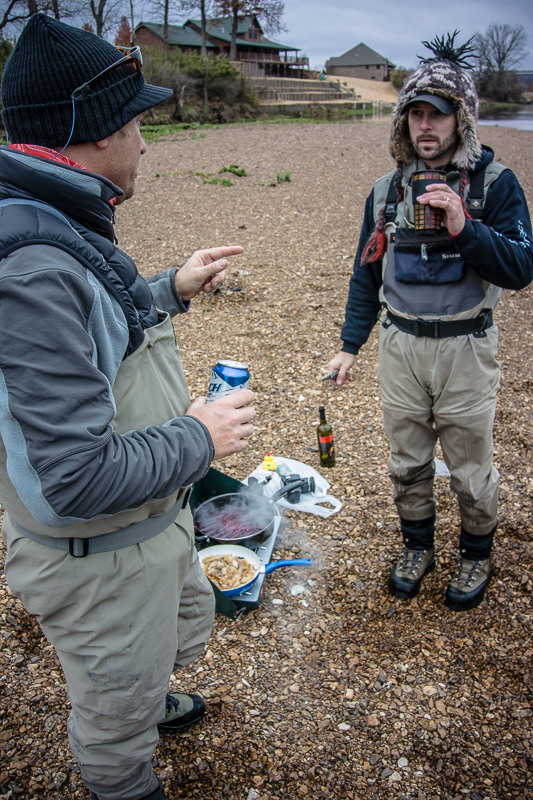 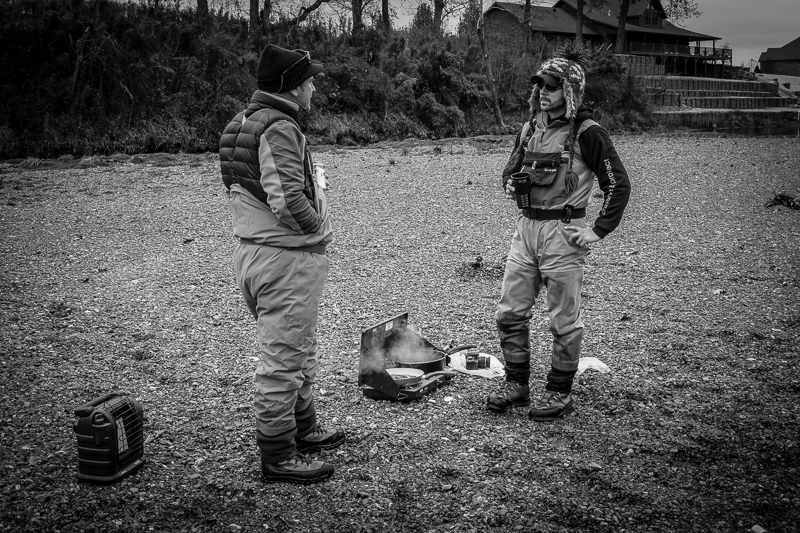 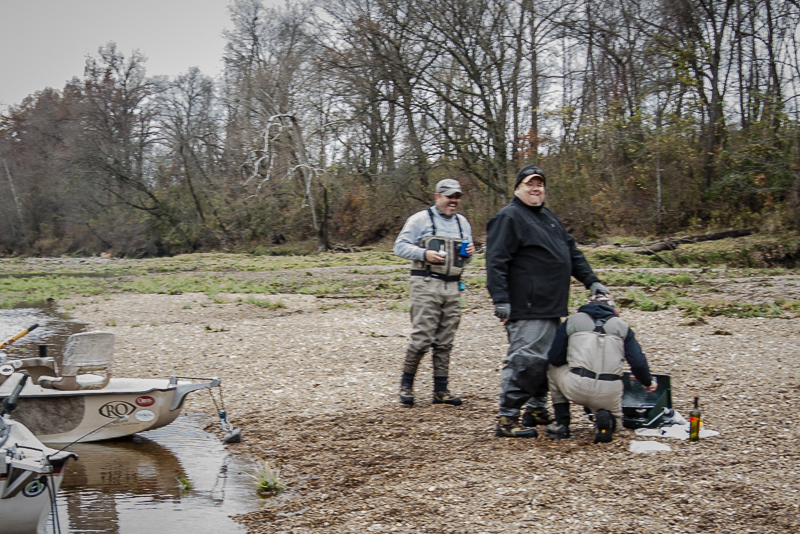 It was also the first fly fishing trip that my dad has taken with me in my drift boat; he even went out and bought waders for the occasion. 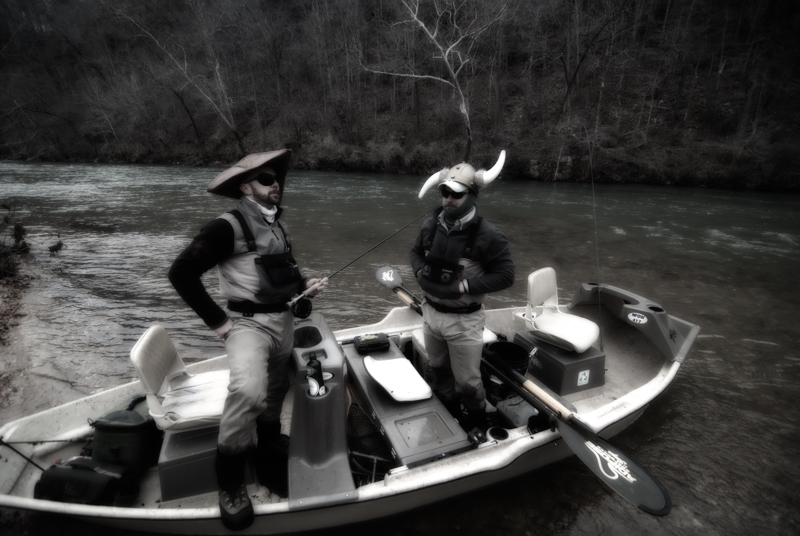 The entire day was a blur, the flows were perfect for throwing big streamers and my Dad, Ritter, and I set out in my boat to float from ROLF to Sunburst and then Patrick Bridge to Sunburst Canoe Rental’s Lower Landing, and Brian Wise, Chris Richardson, and Chance Maxville set out in Chance’s skiff to do the same. 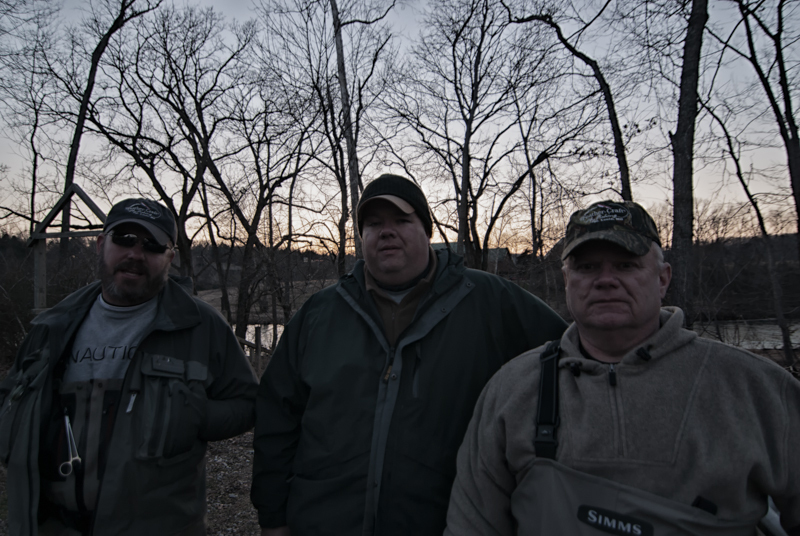 There was a lot of hooting and hollering and it is always a good time on the river with those guys. 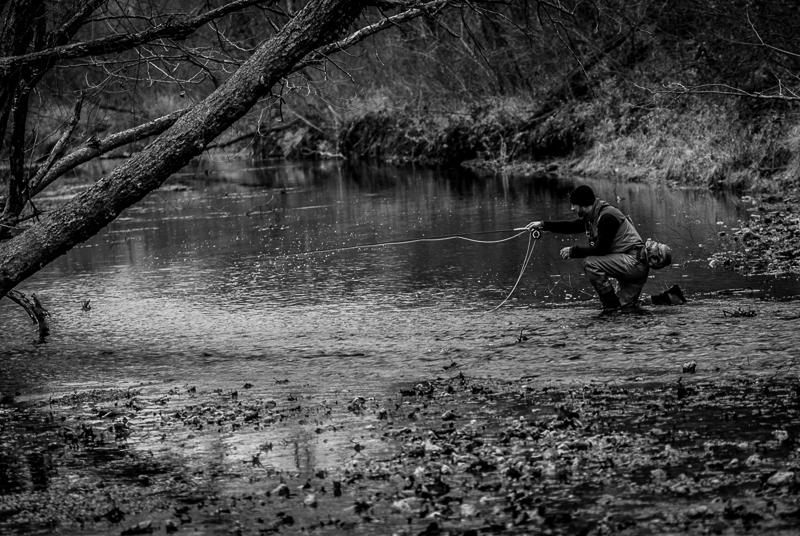 Too many stories to recount so long after the trip some of the highlights included someone in Chance’s boat pulling a big log of a tree limb crashing down onto the boat, a viking landing at Sunbrust, and subsequent Harlem Shake video, and my dad absolutely cleaning up on drop-shotting trout with his ultra light rod set-up. 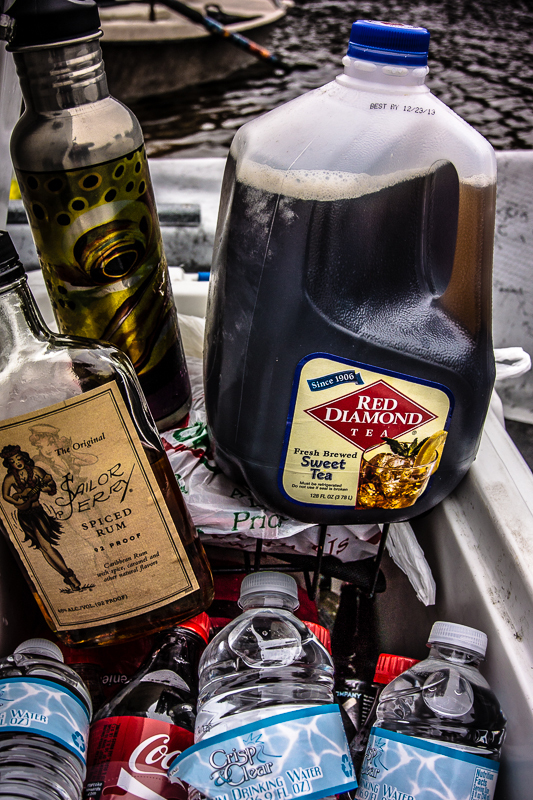 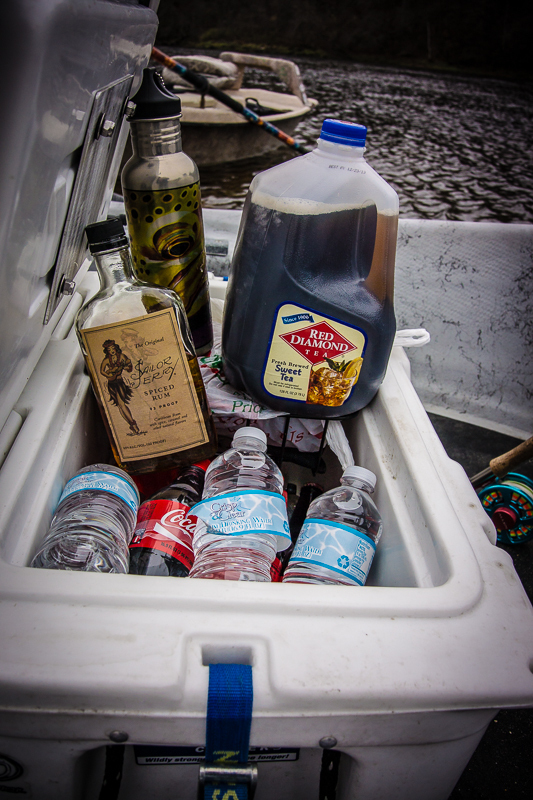 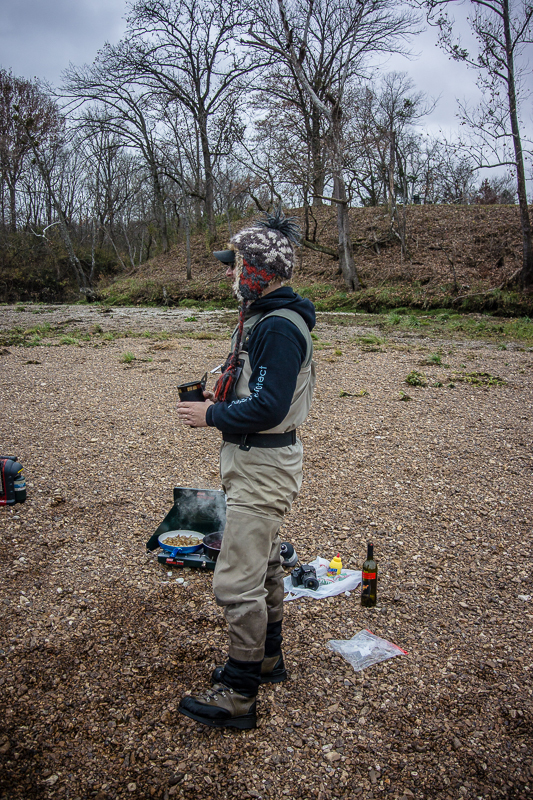 All in all it was a great day on the river. 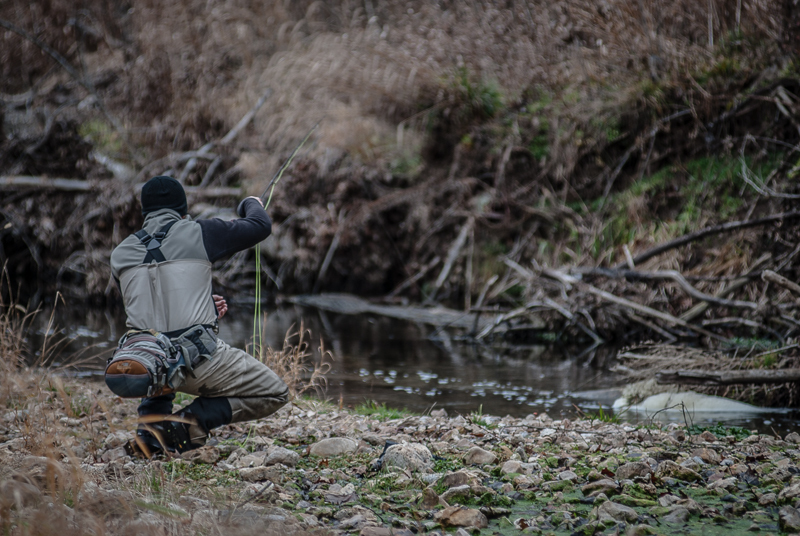 We didn’t roll back into the driveway until 11pm that night, so it was definitely a full day…..but the next time the river is at 1000cfs….you know where I will be. 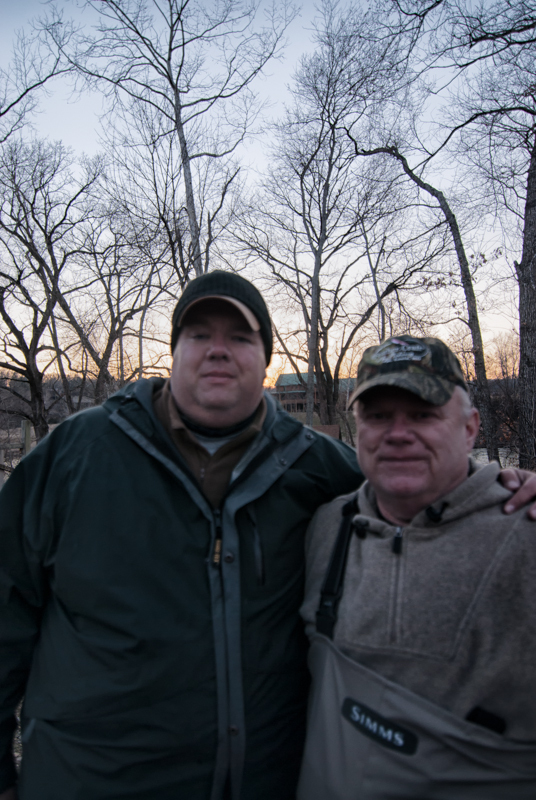 It was a great way to reconnect with my dad on a fishing trip, after way too many years. 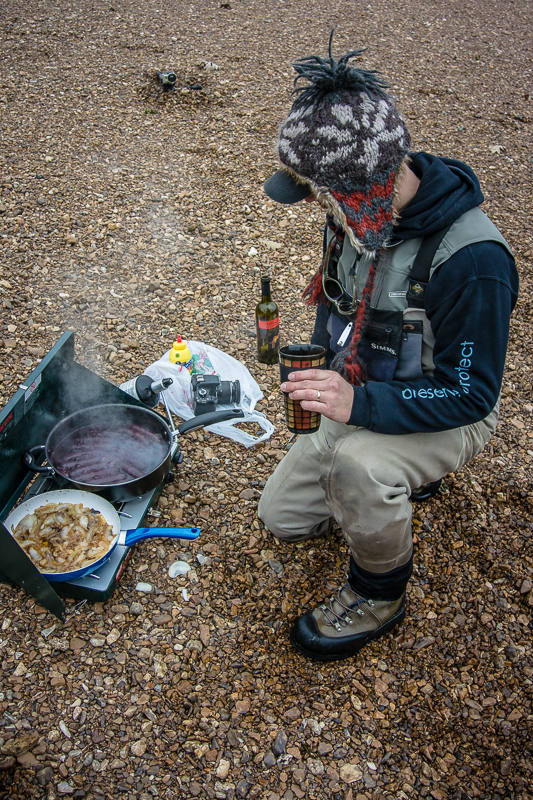 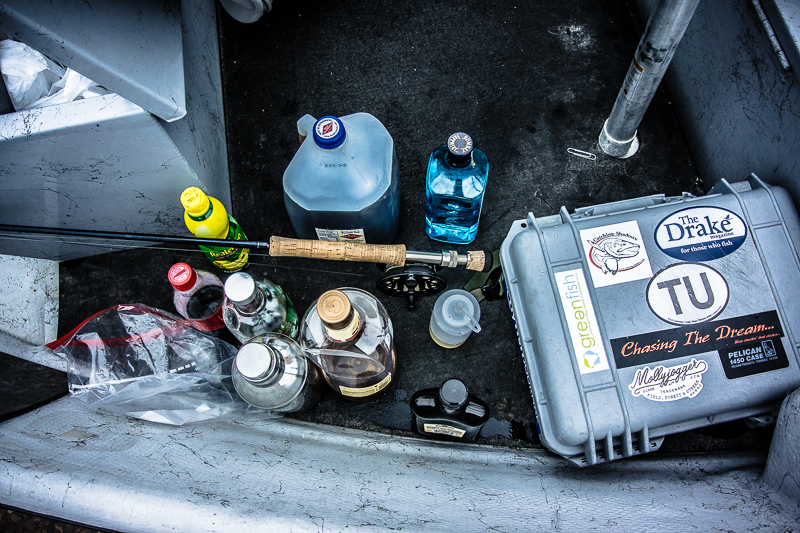 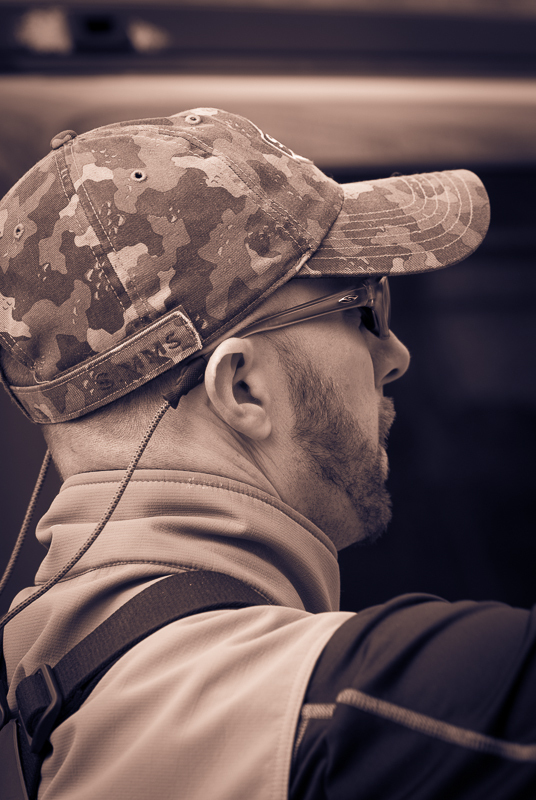 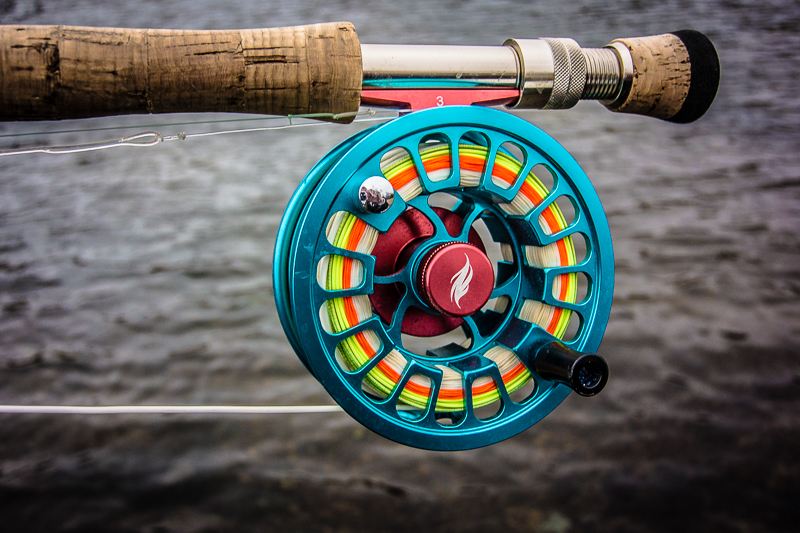 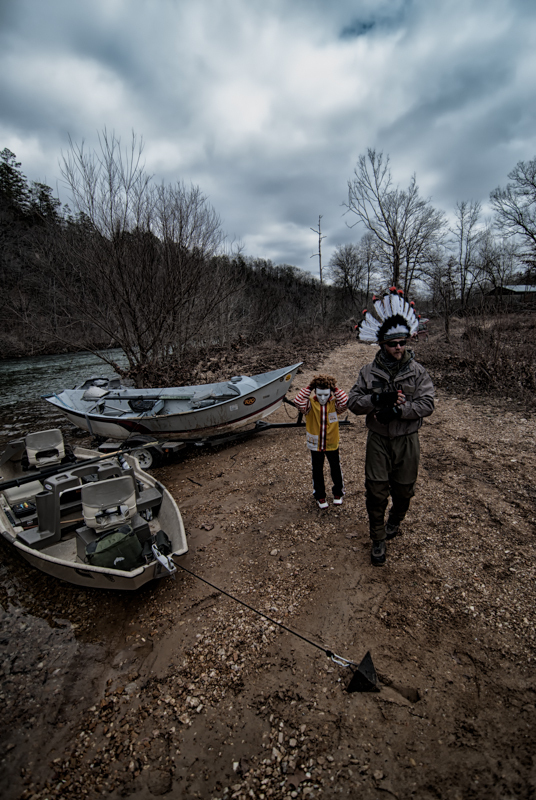 Here is a link to the Chasin’ The Dream write up from this trip — Click here for their take on this trip. 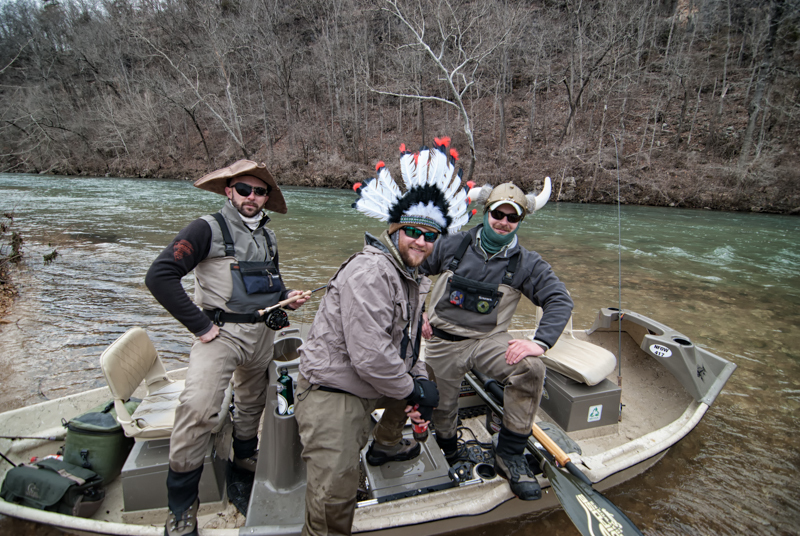 Here is a link to the YouTube video of the Harlem Shake video we filmed at Sunburst Canoe Rental — Click here for the video. 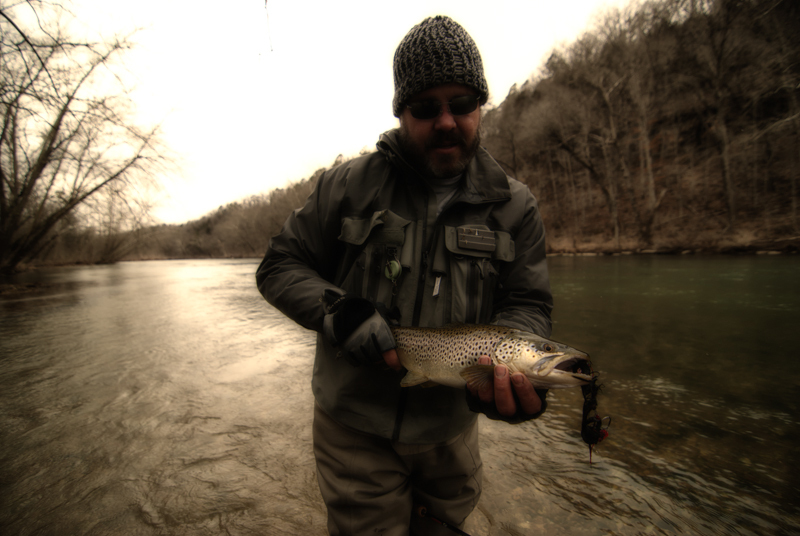 Here are the photos from this trip. 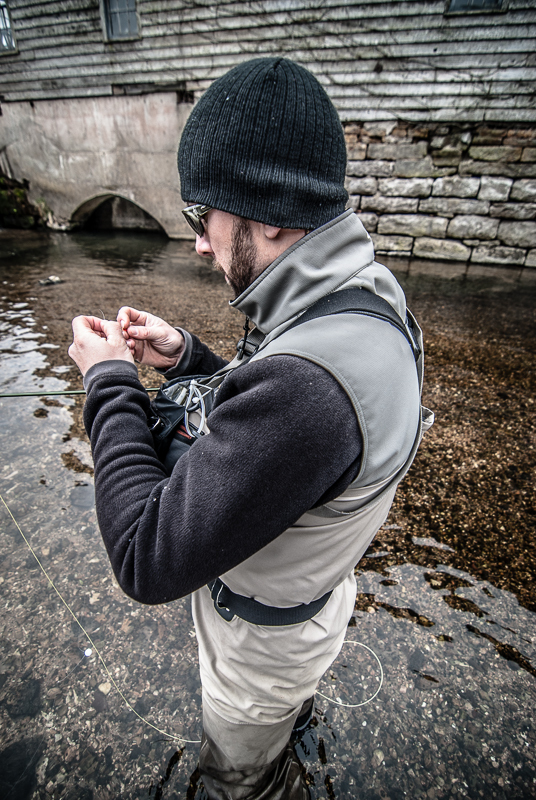 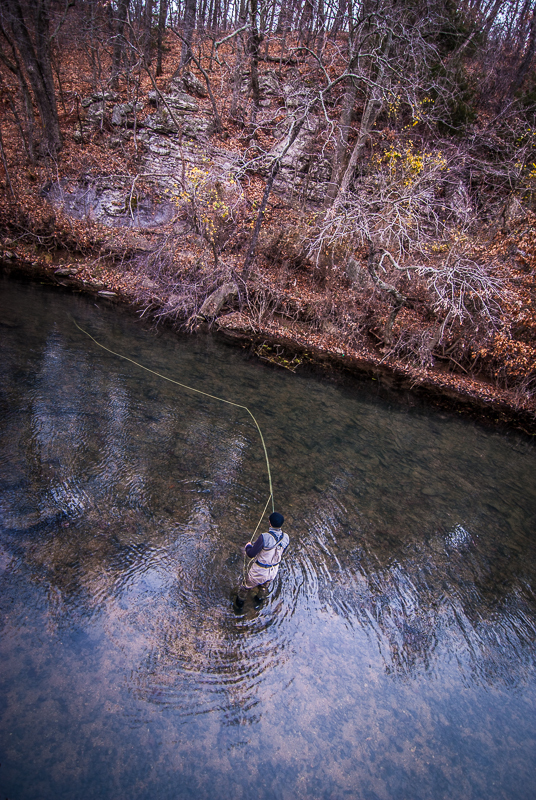 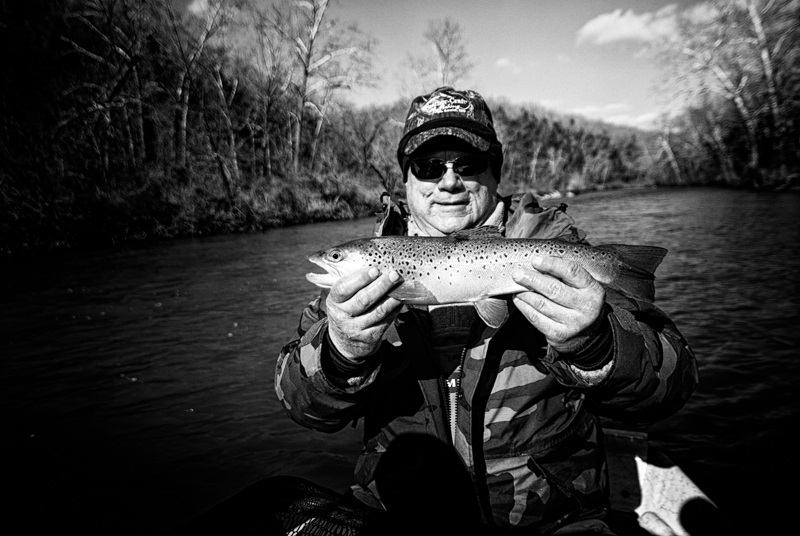 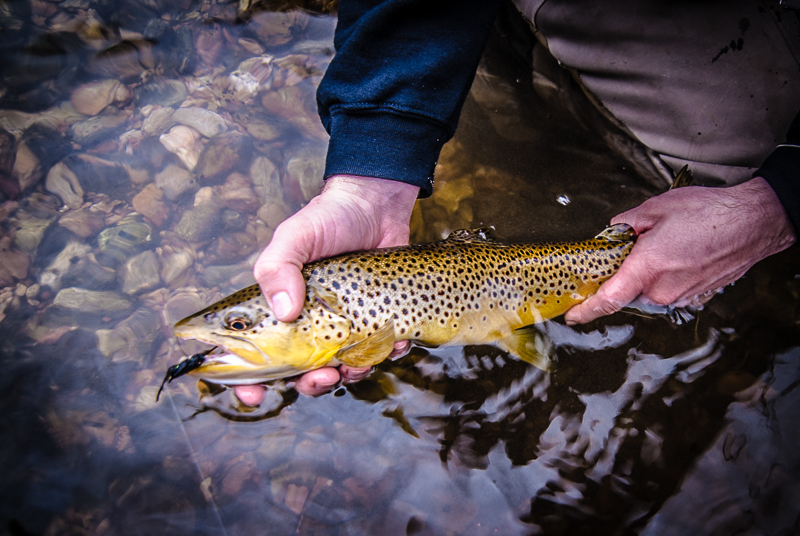 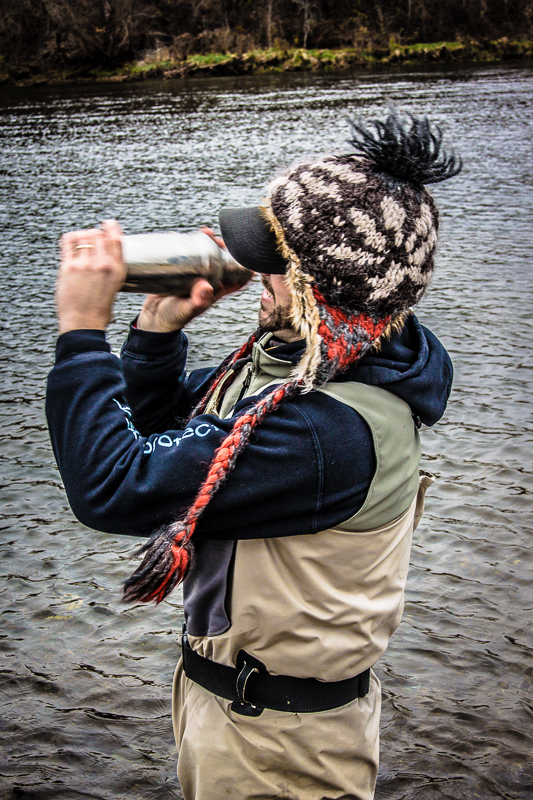 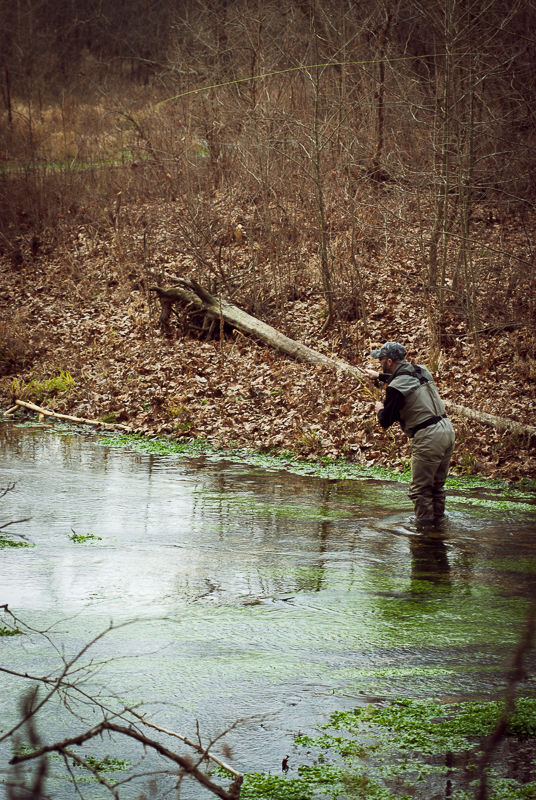 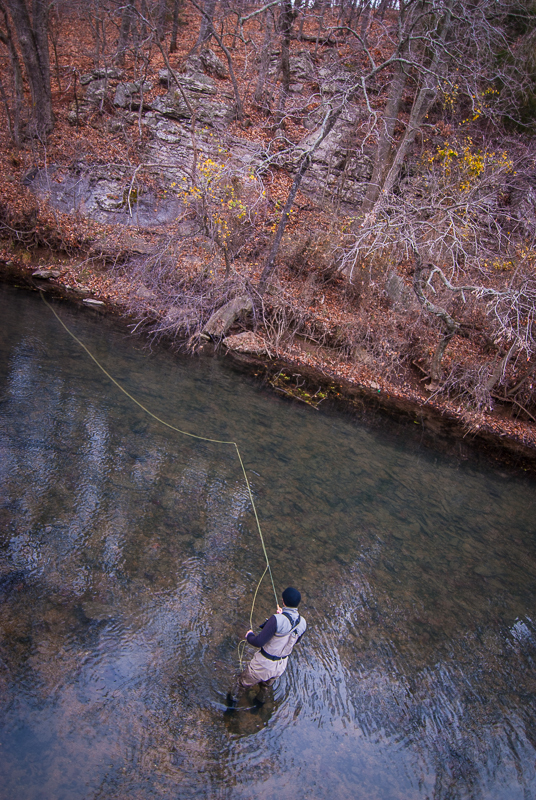 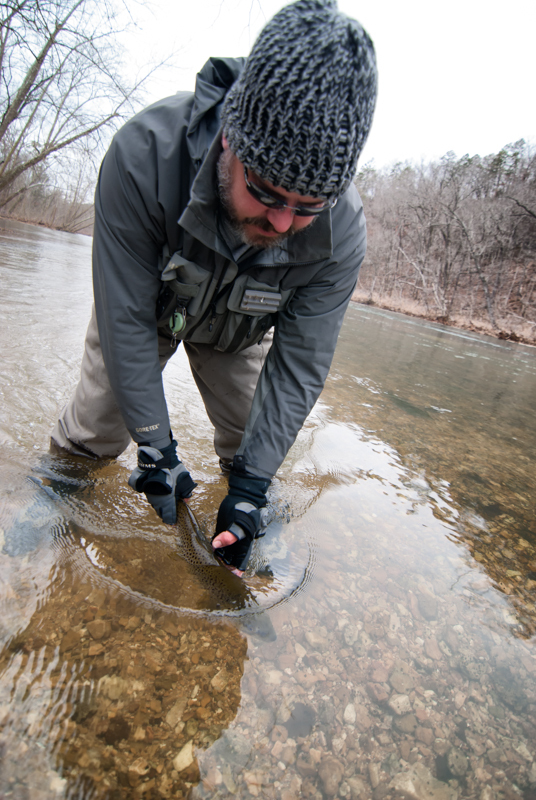 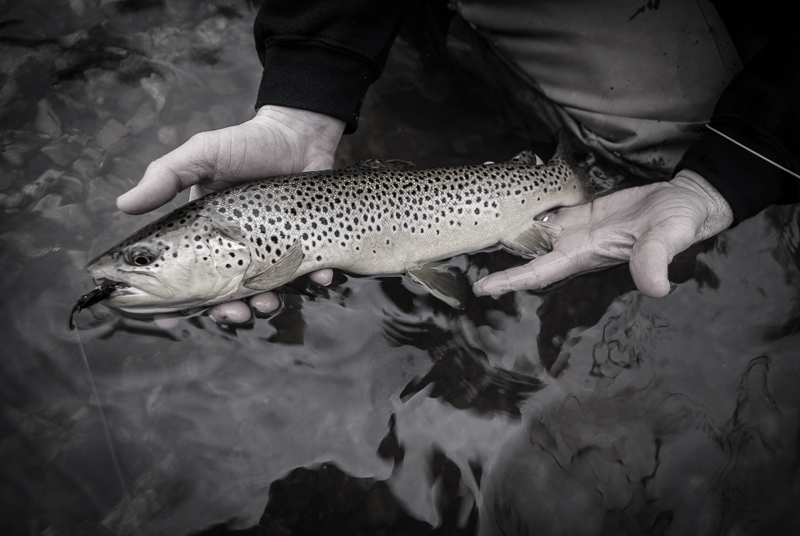 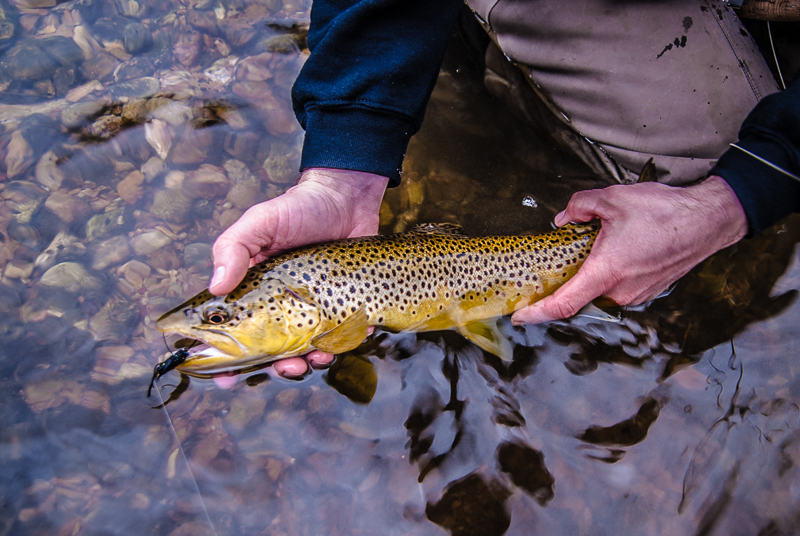 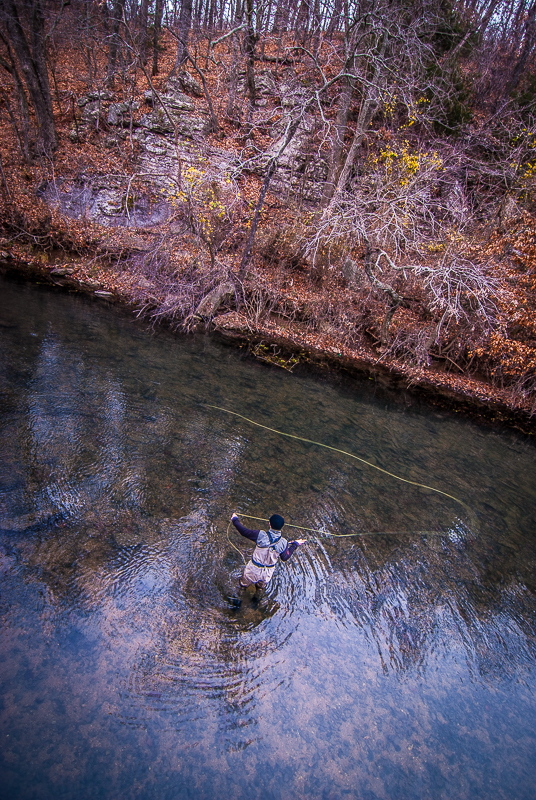 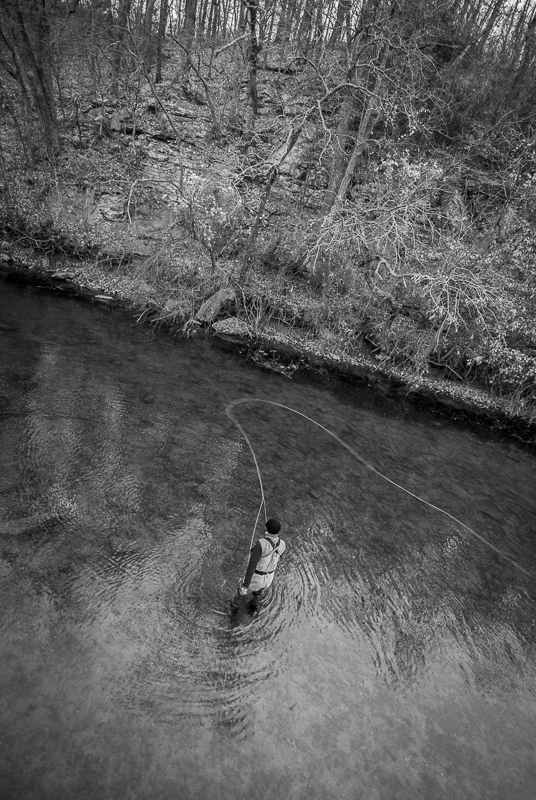 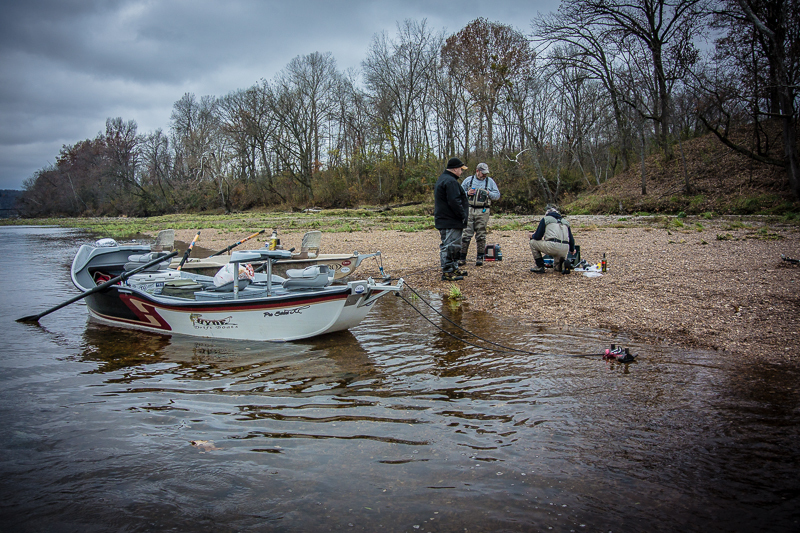 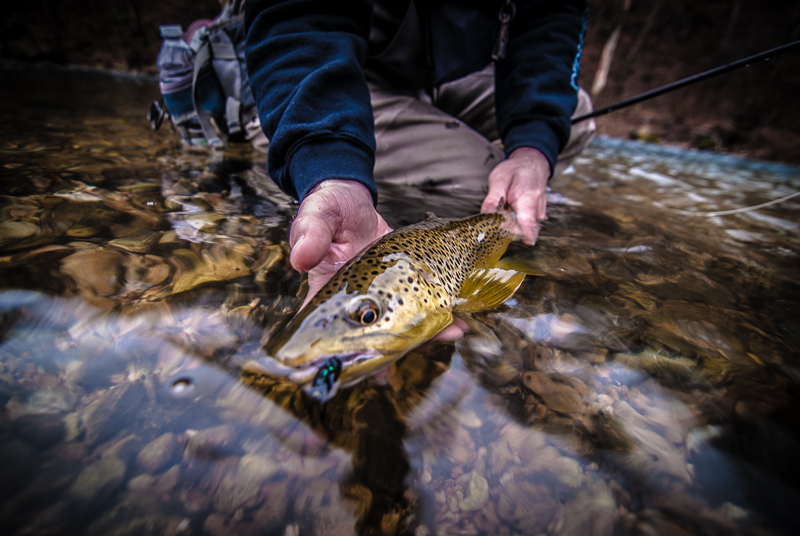 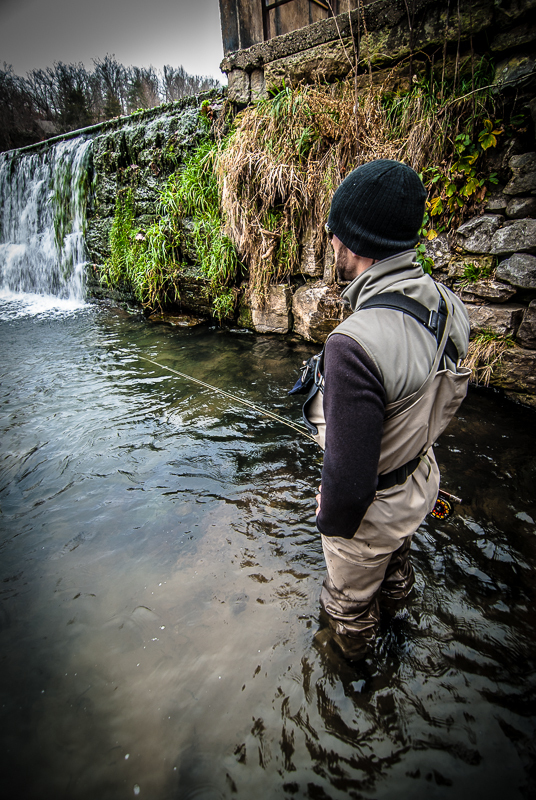 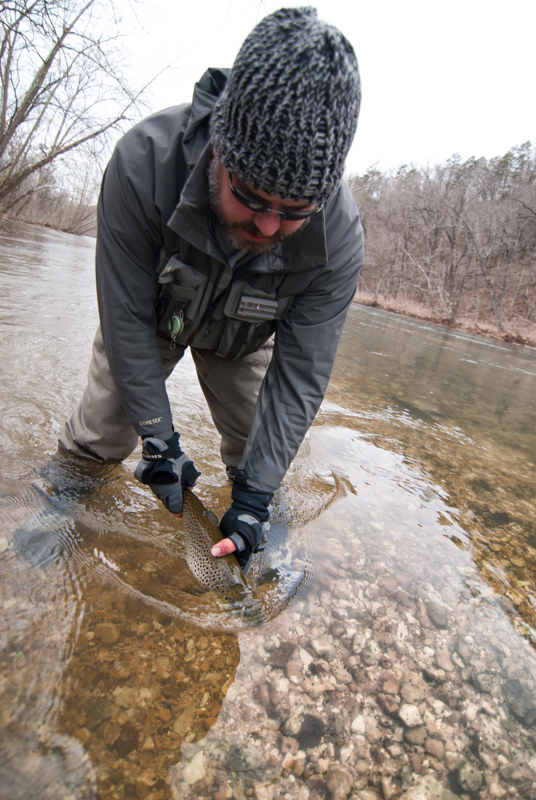 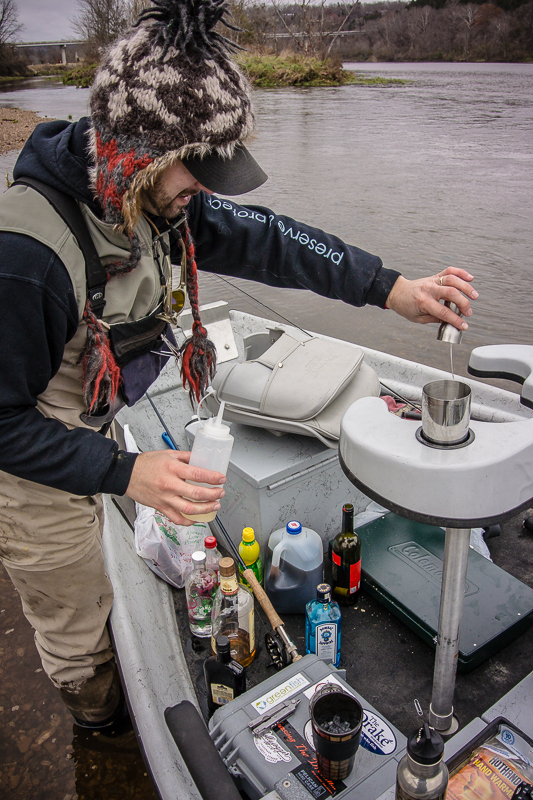 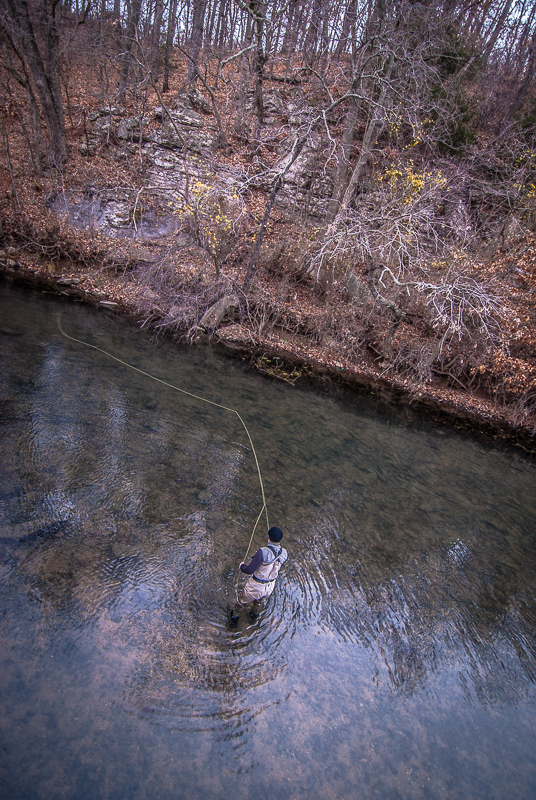 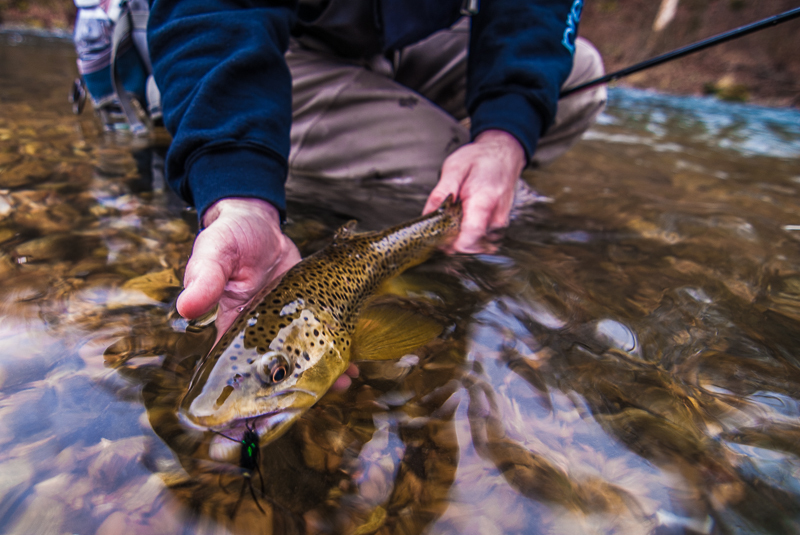 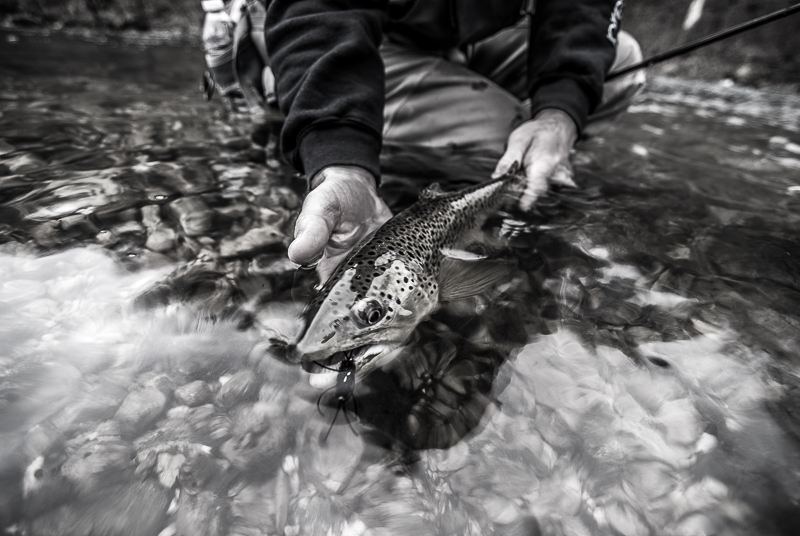 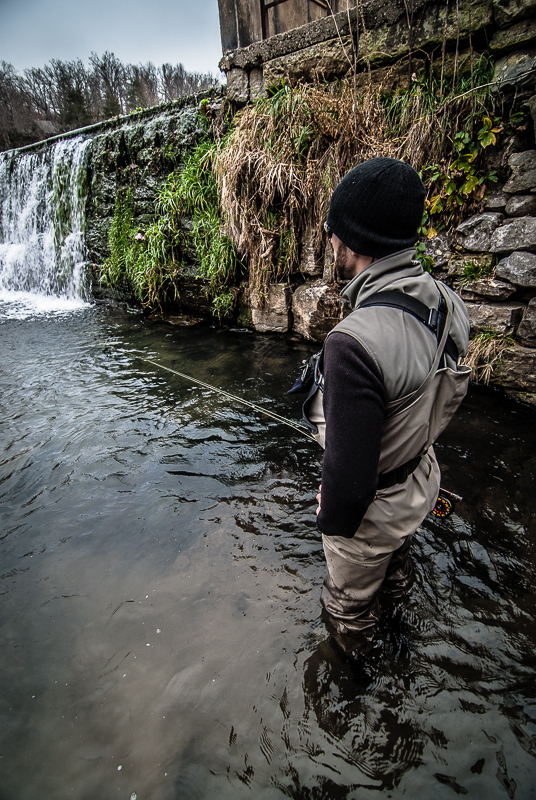 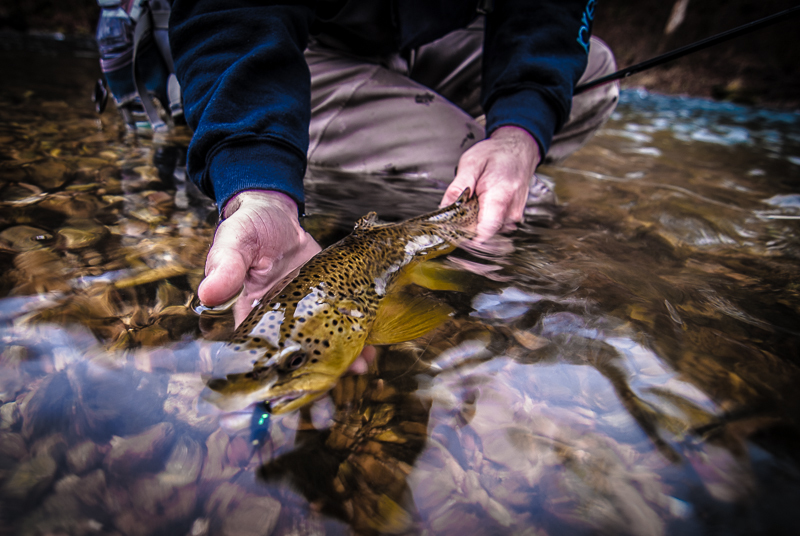 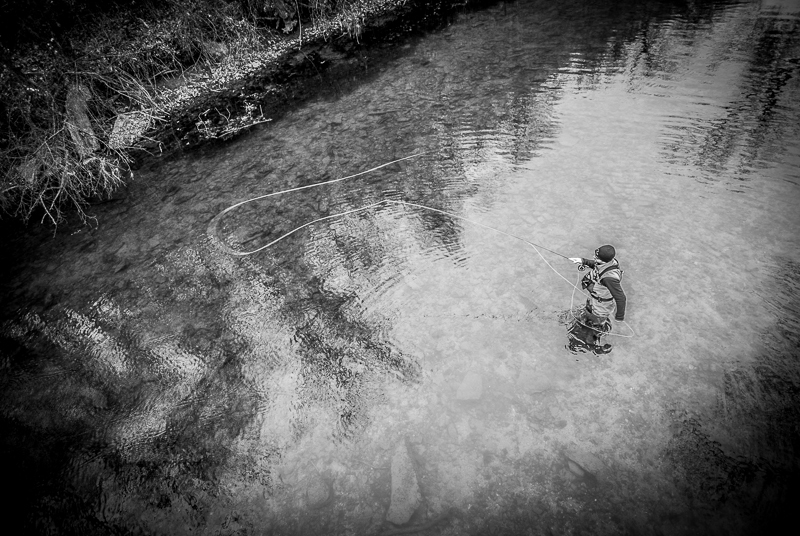 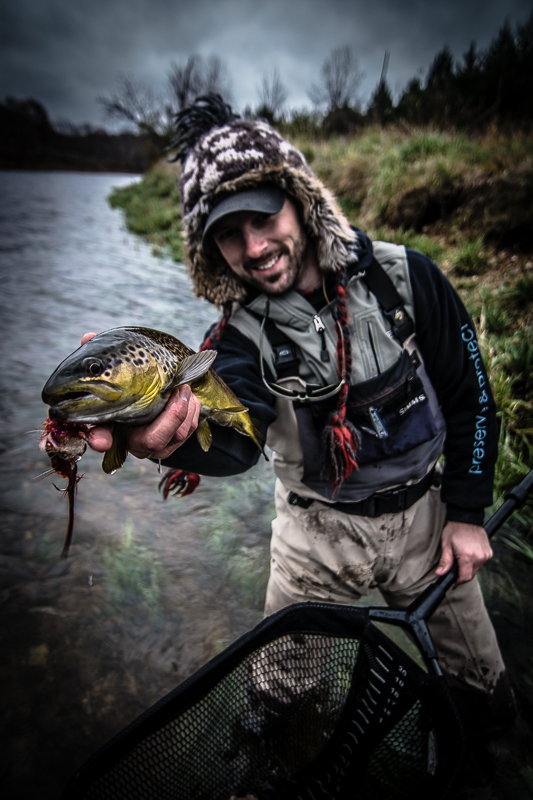 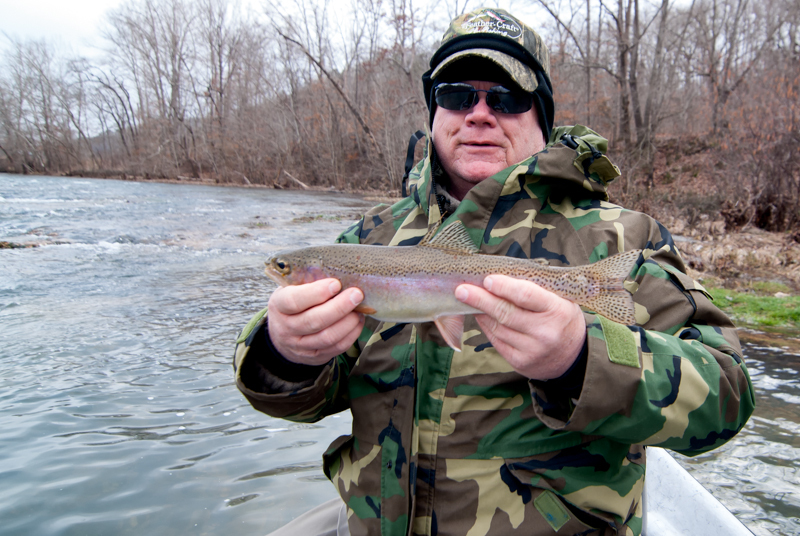 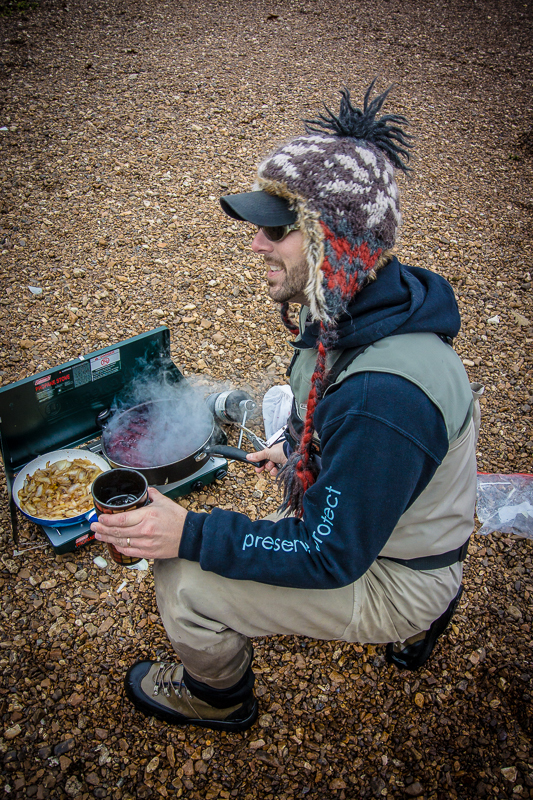 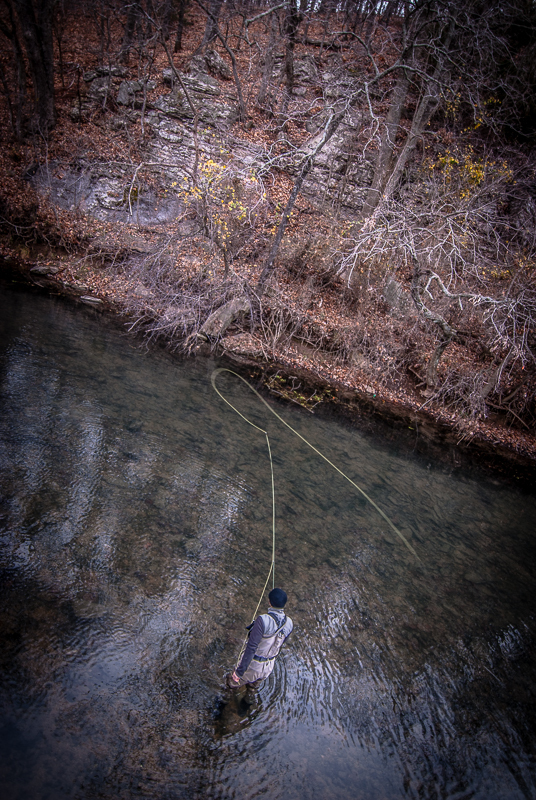 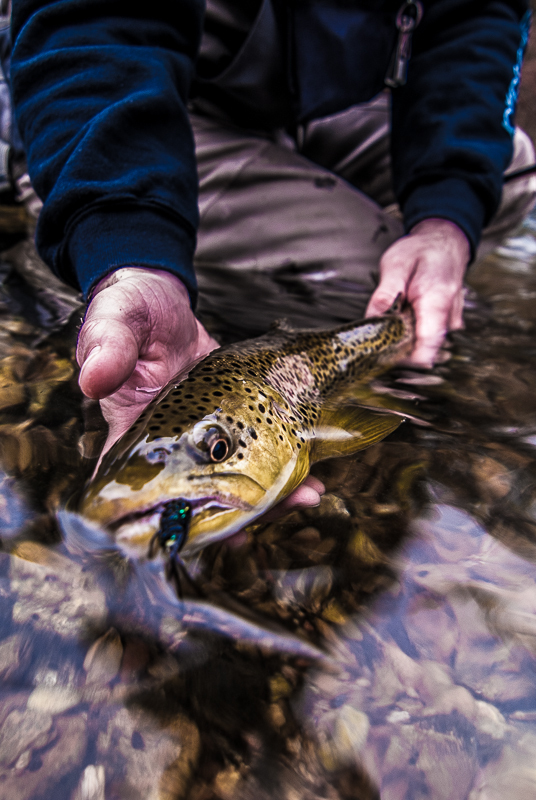 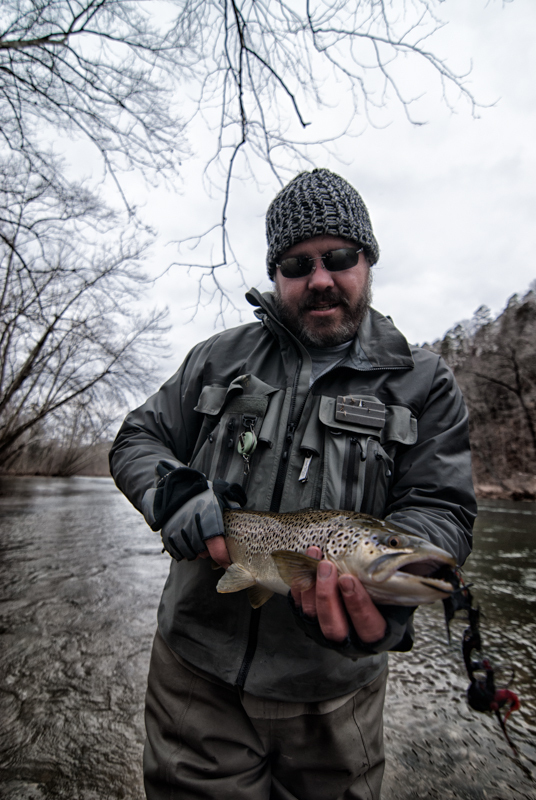 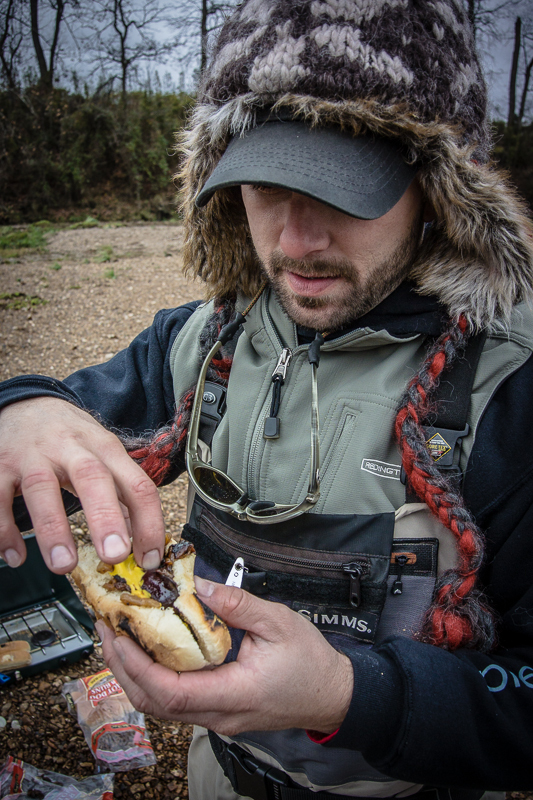 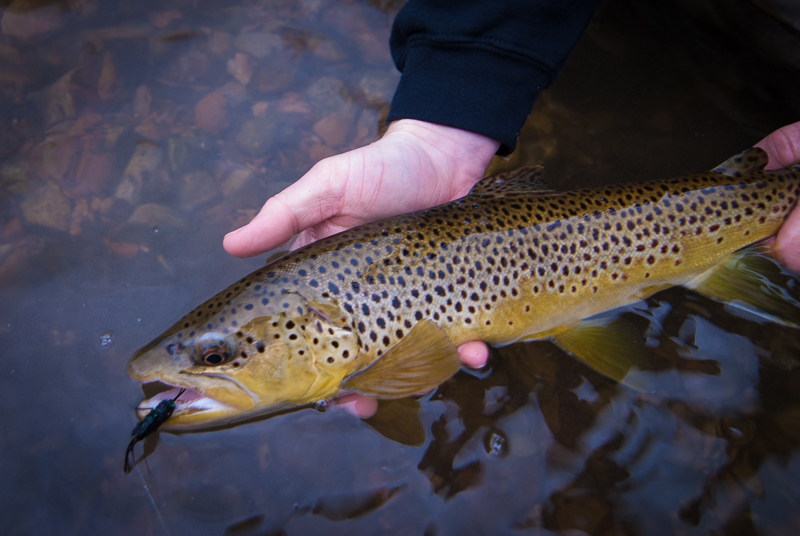 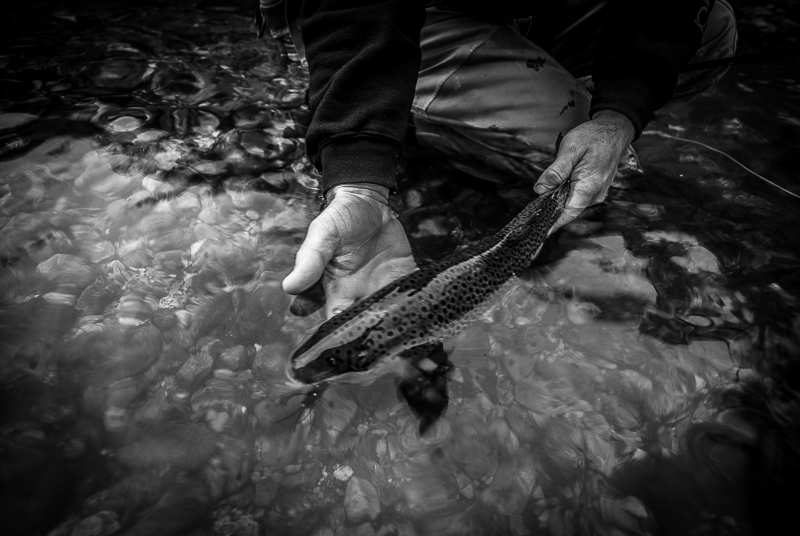 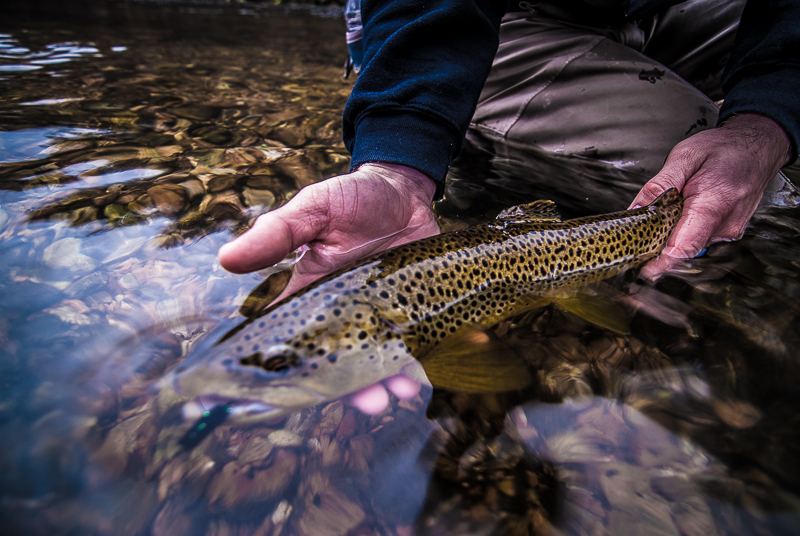 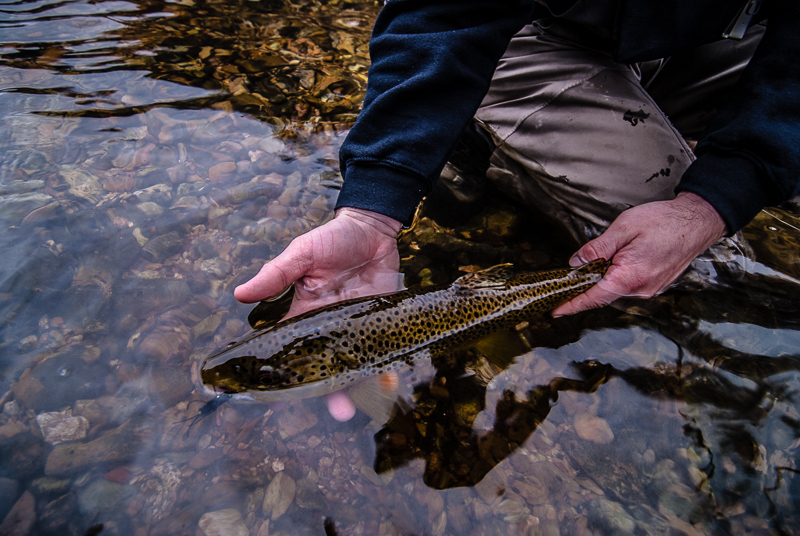 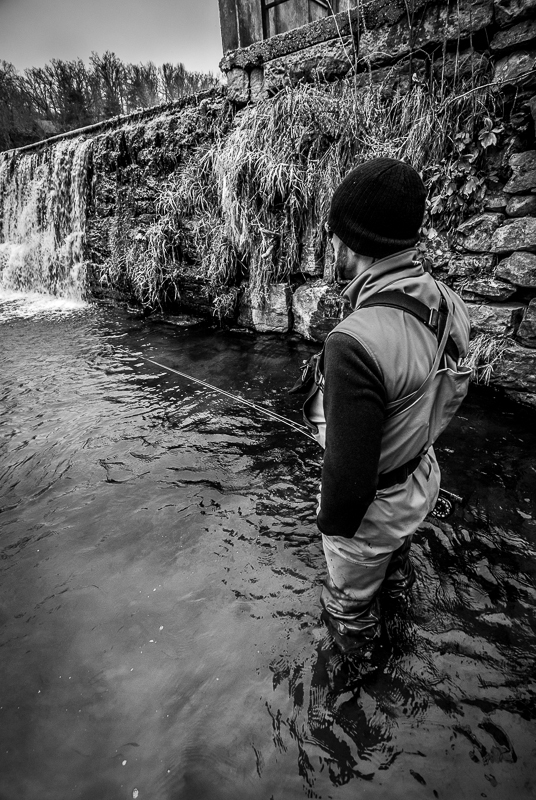 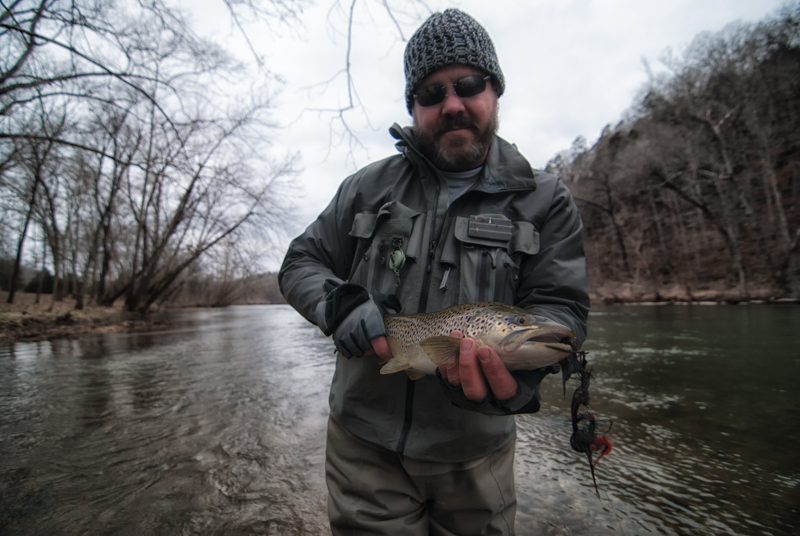 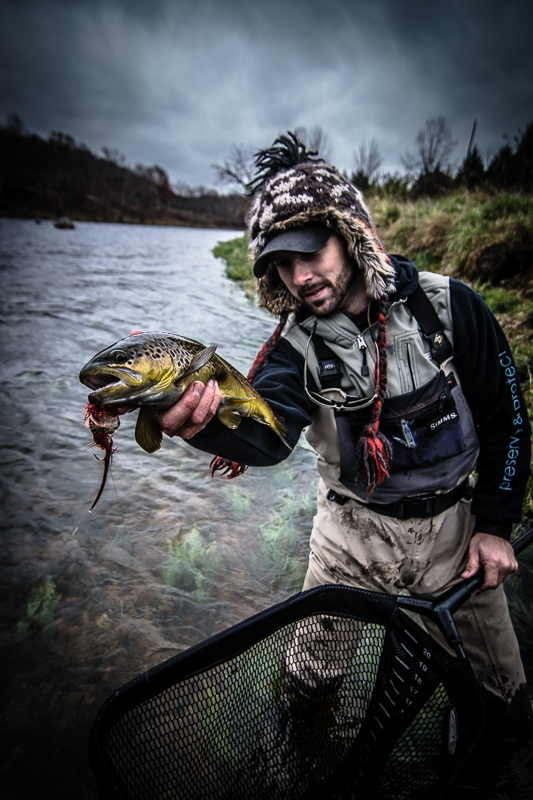 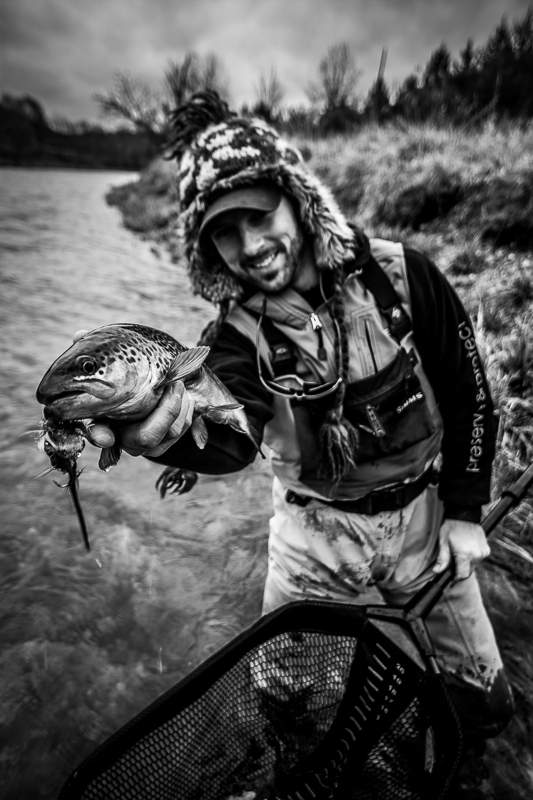 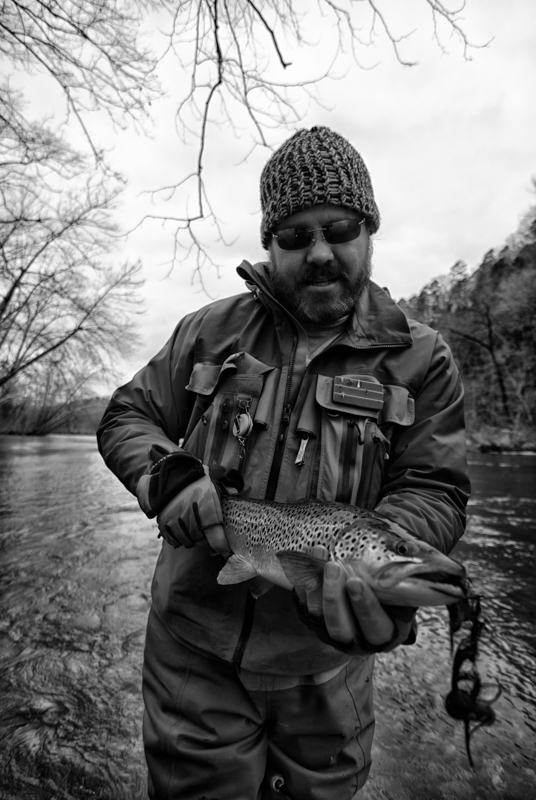 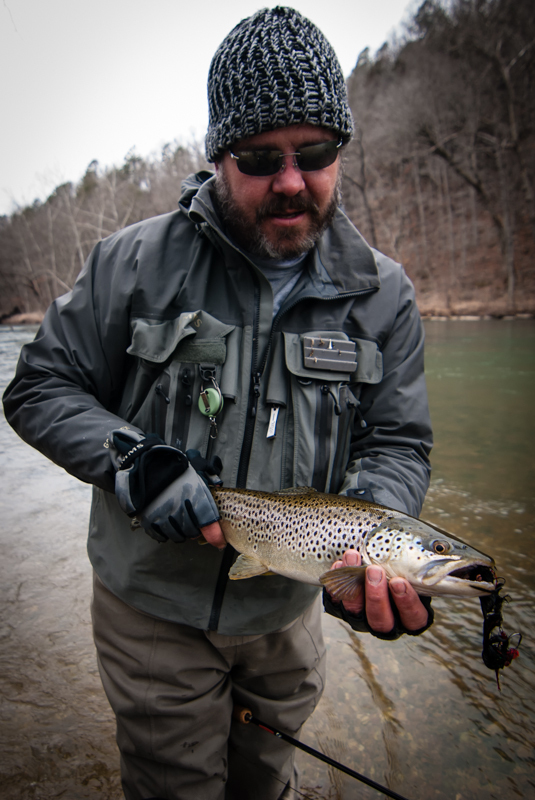 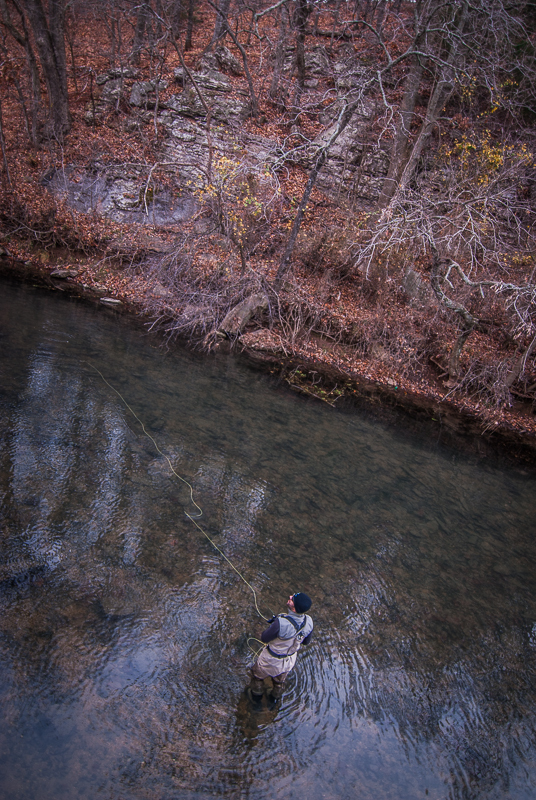 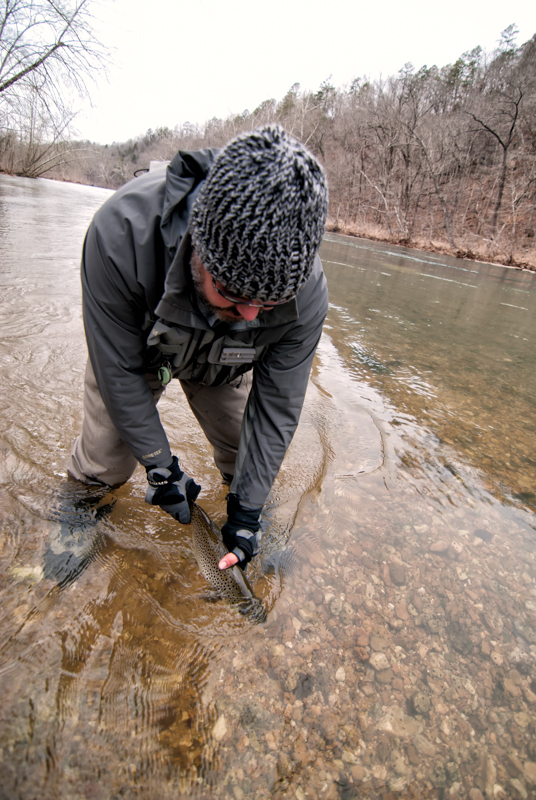 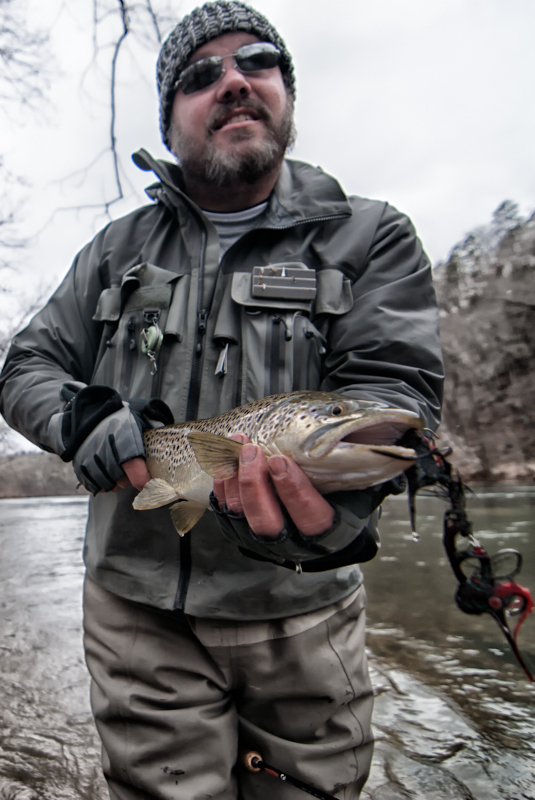 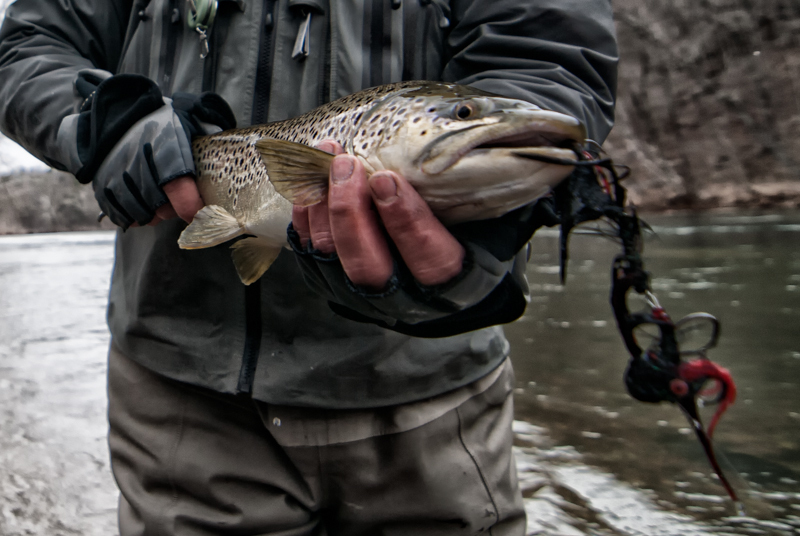 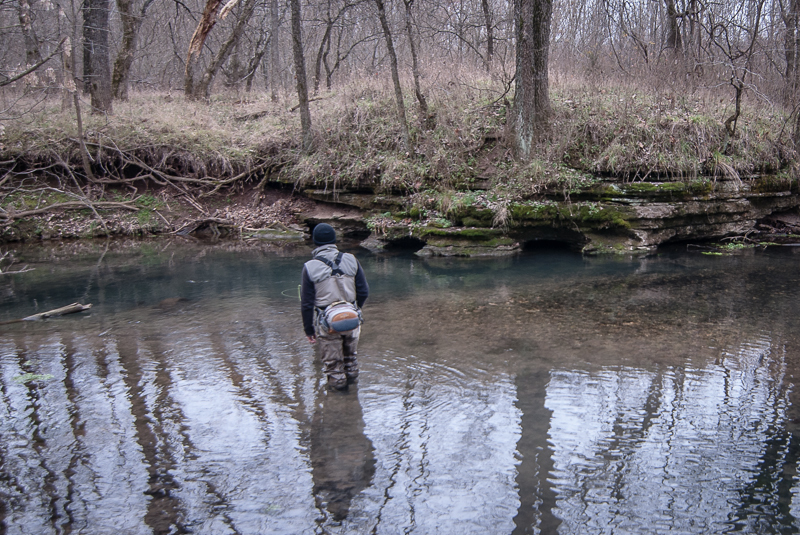 The Missouri Trout Odyssey is a trip that Brian Wise and I dreamed up more than 4 years ago. 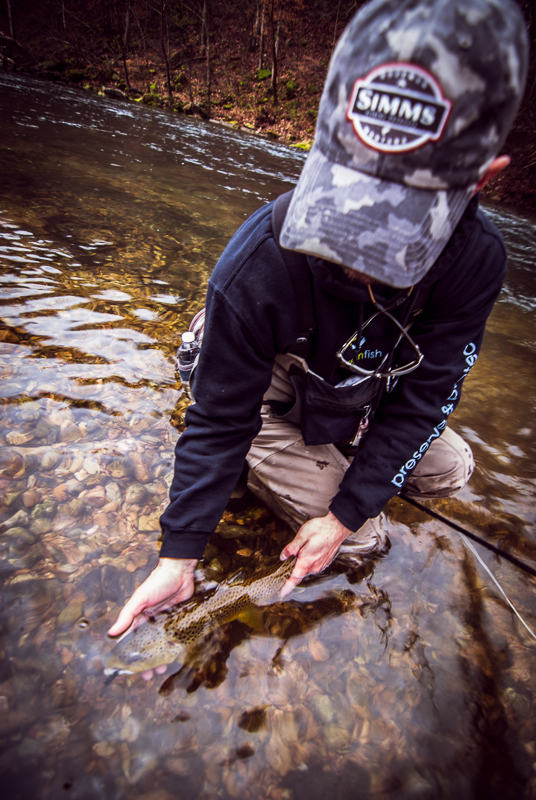 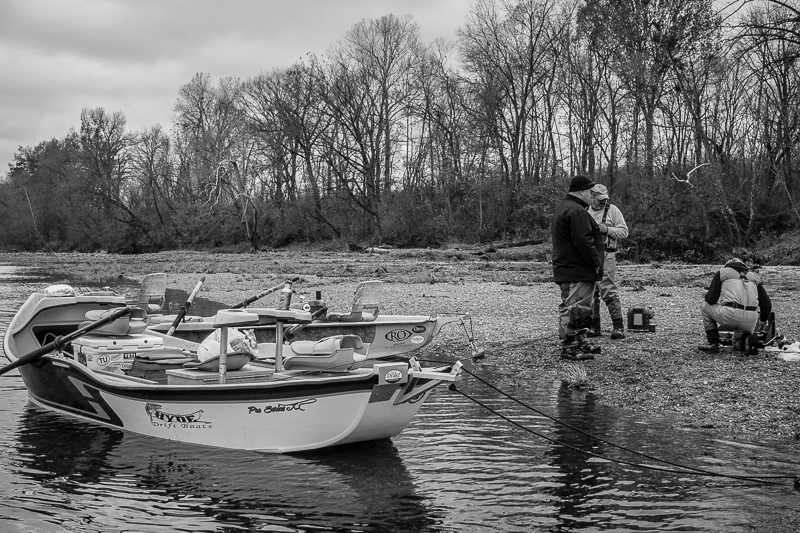 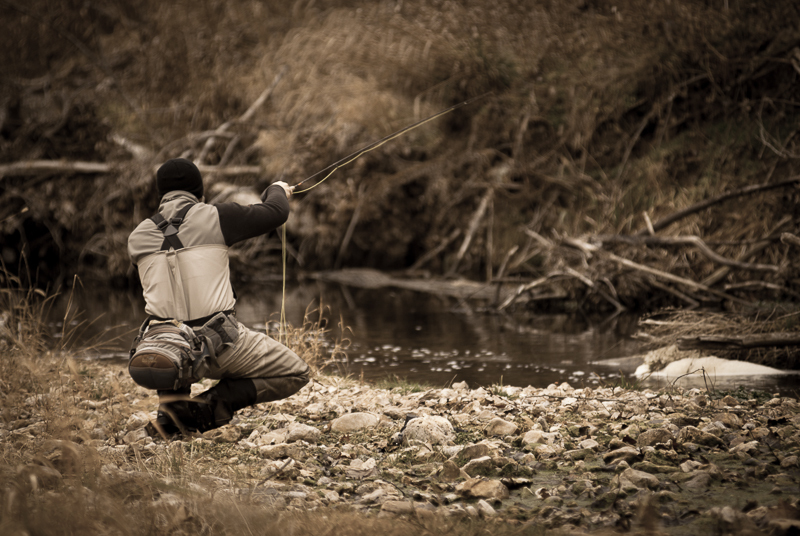 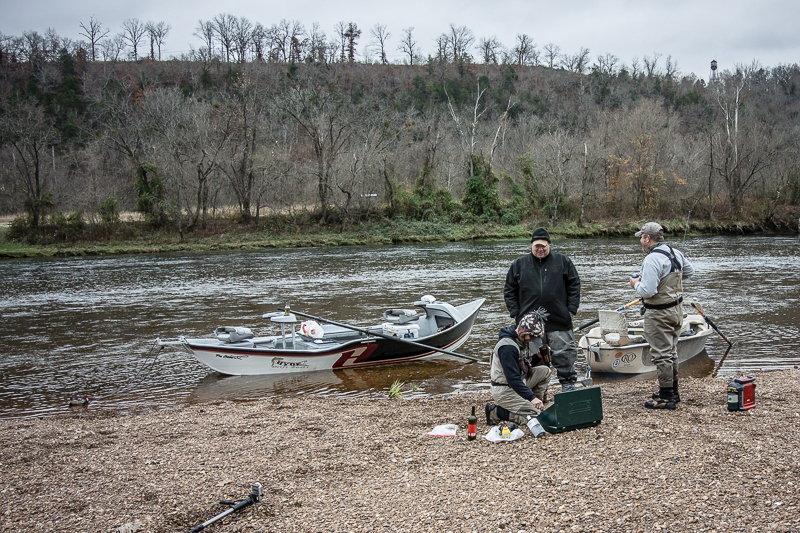 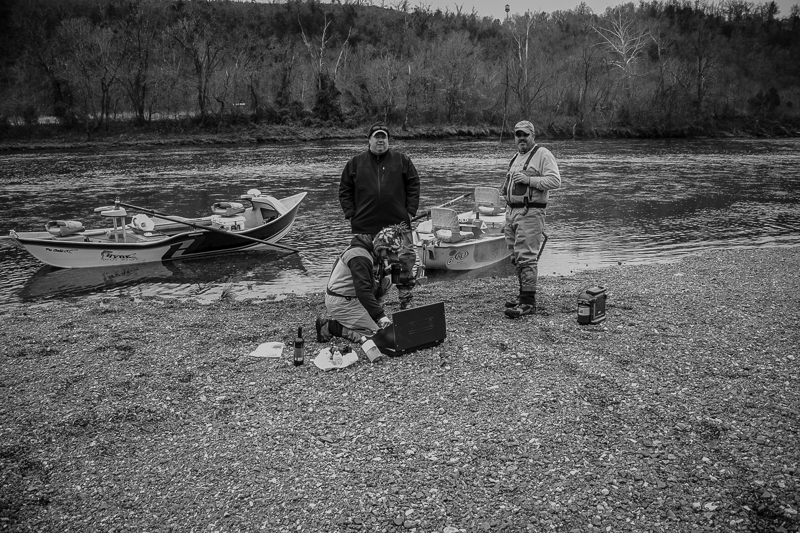 It originally started with each of us trying to bluff the other one into a “megatrip in the ozarks”, then it morphed in to how many streams can we fish and how fast can we fish them. 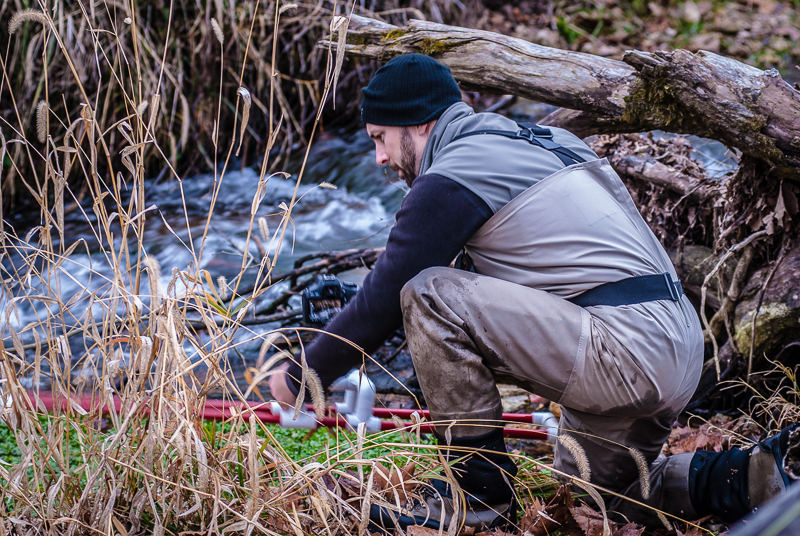 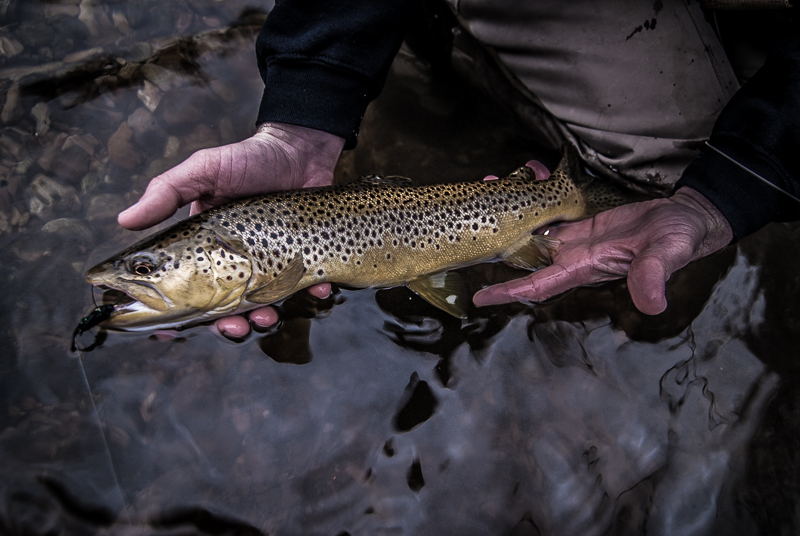 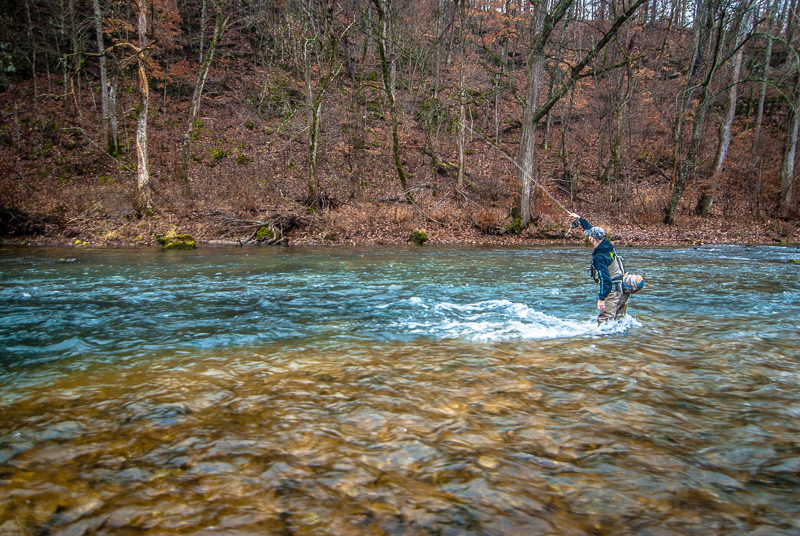 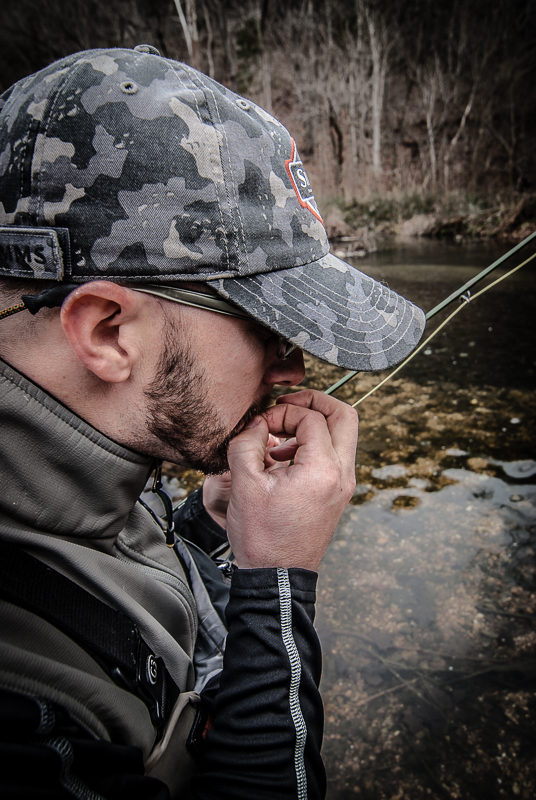 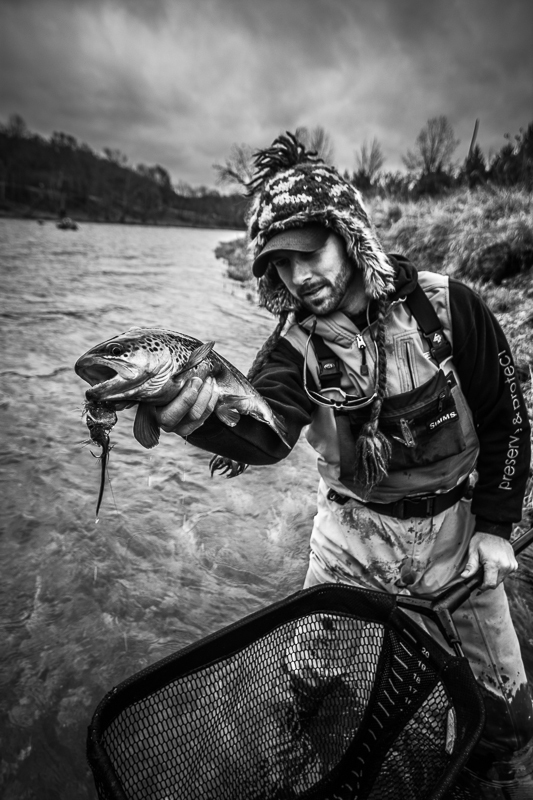 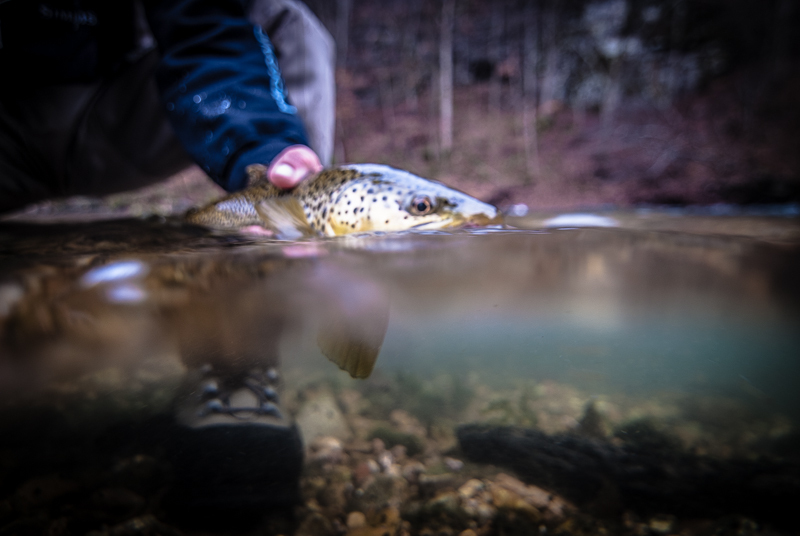 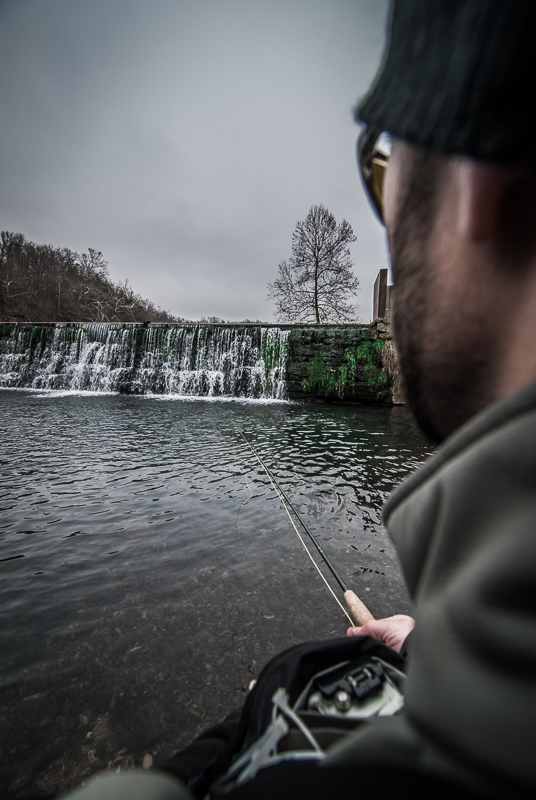 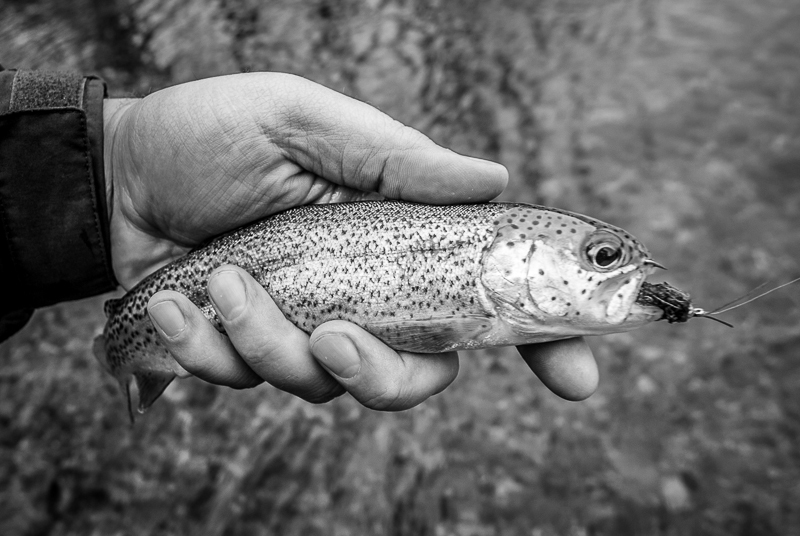 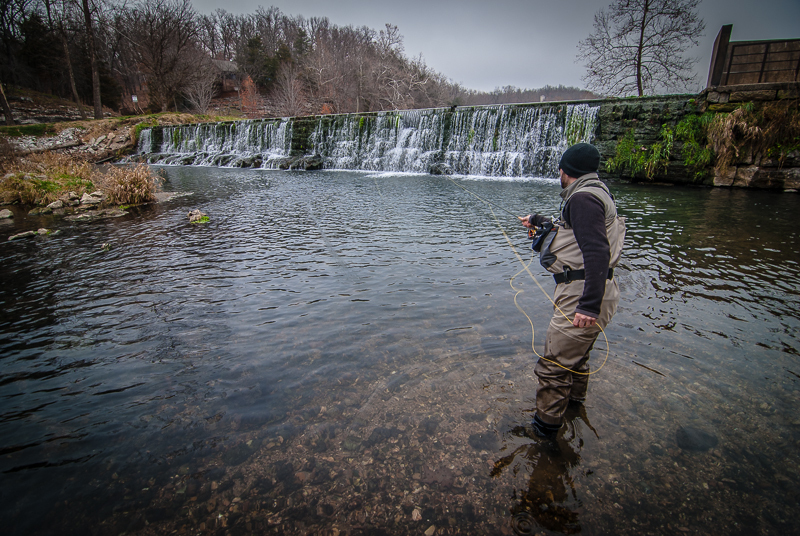 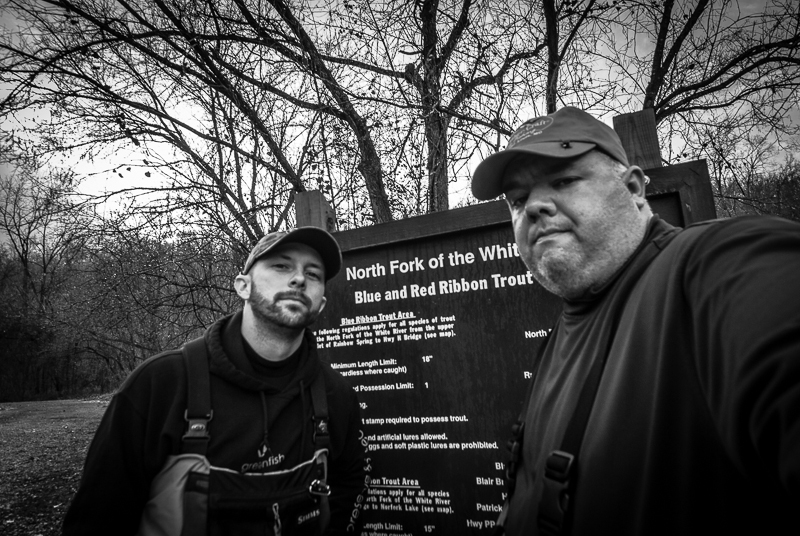 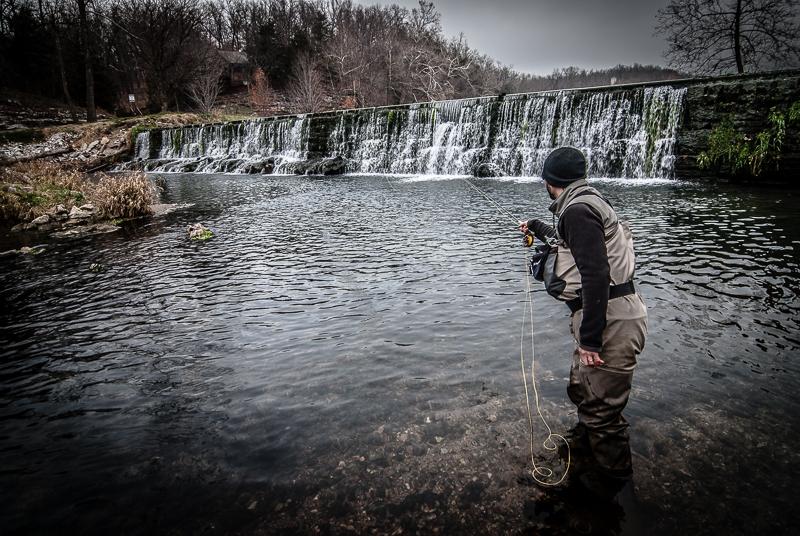 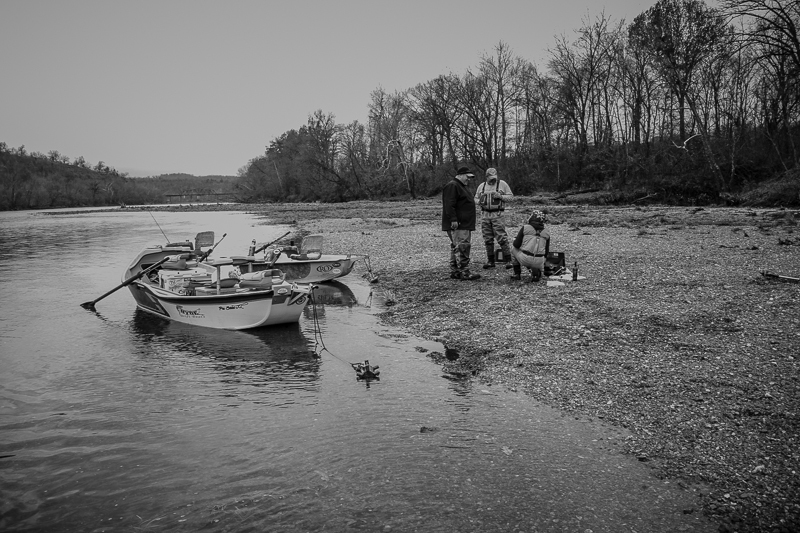 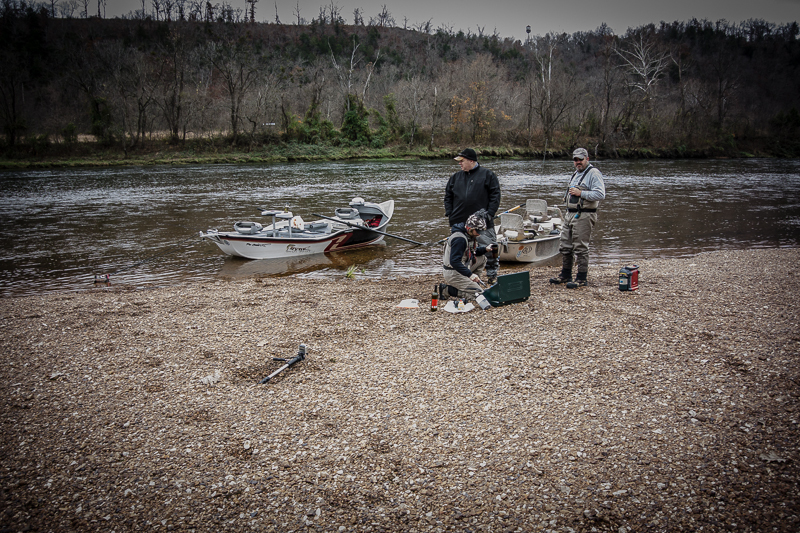 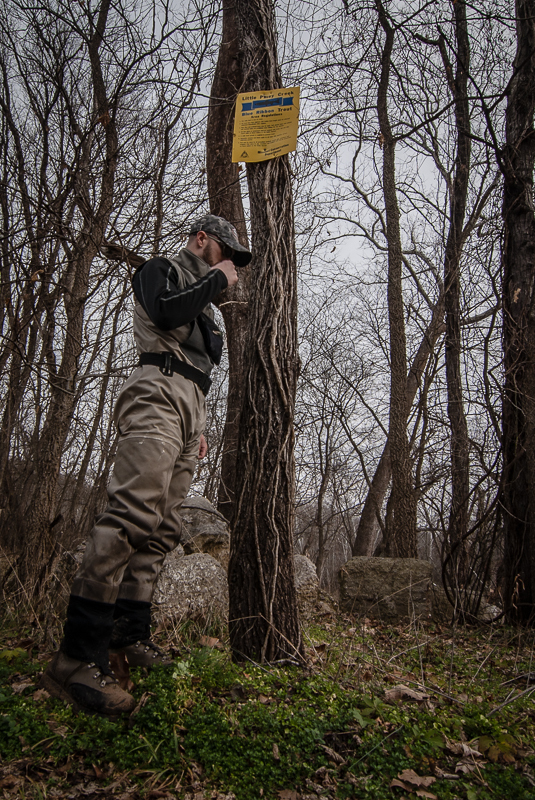 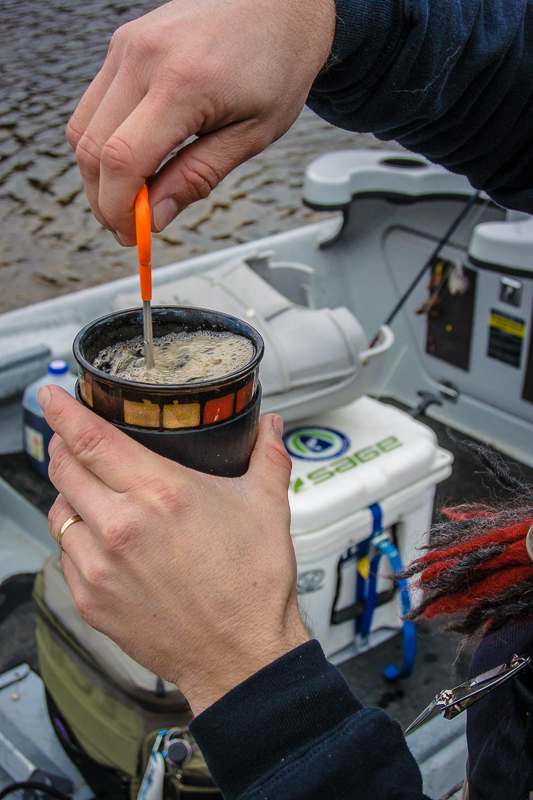 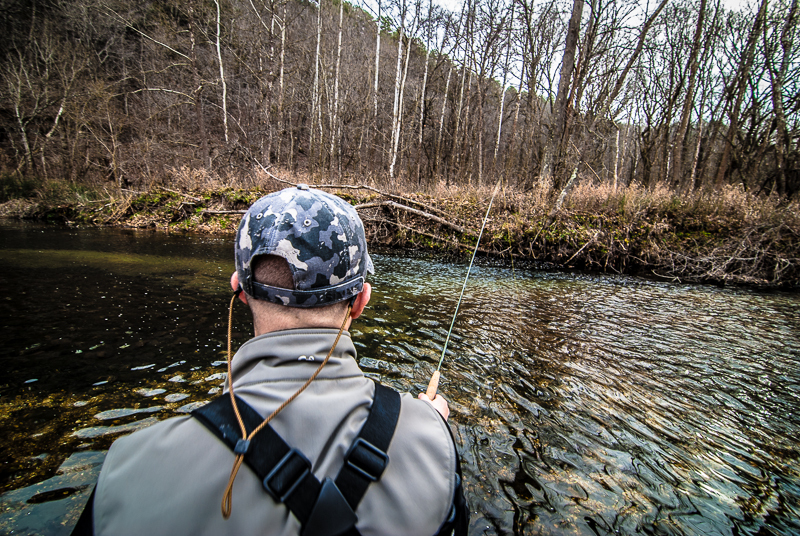 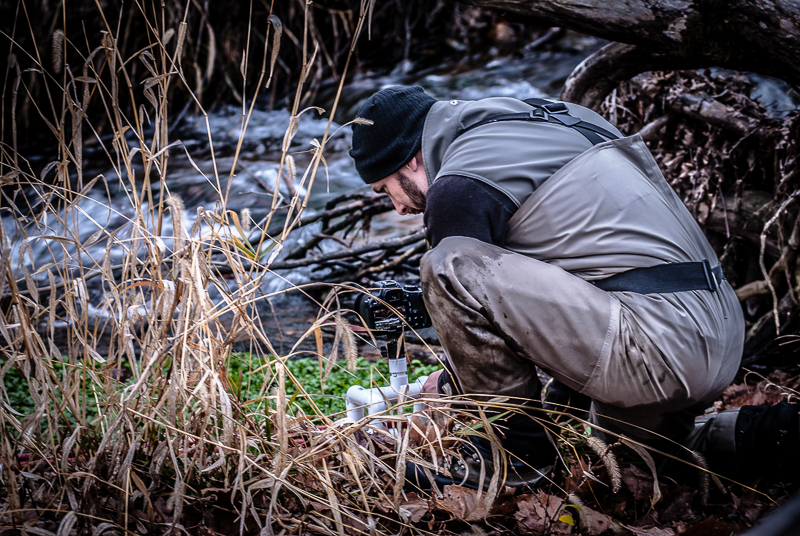 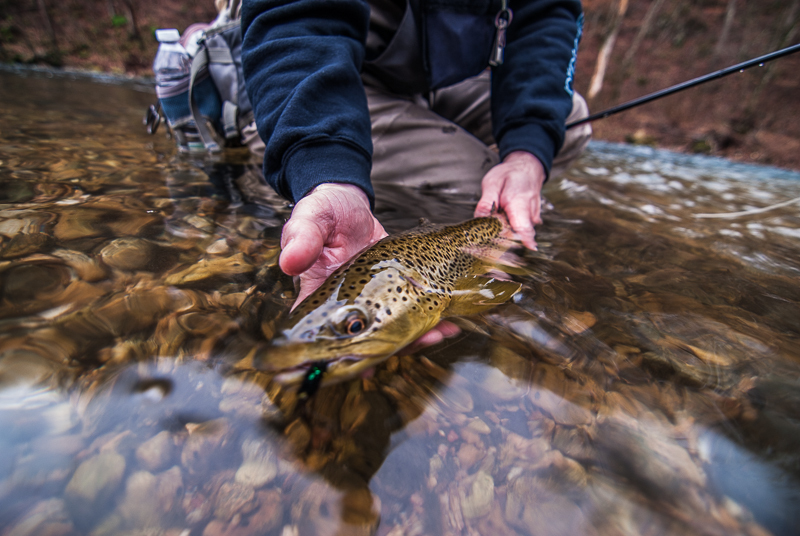 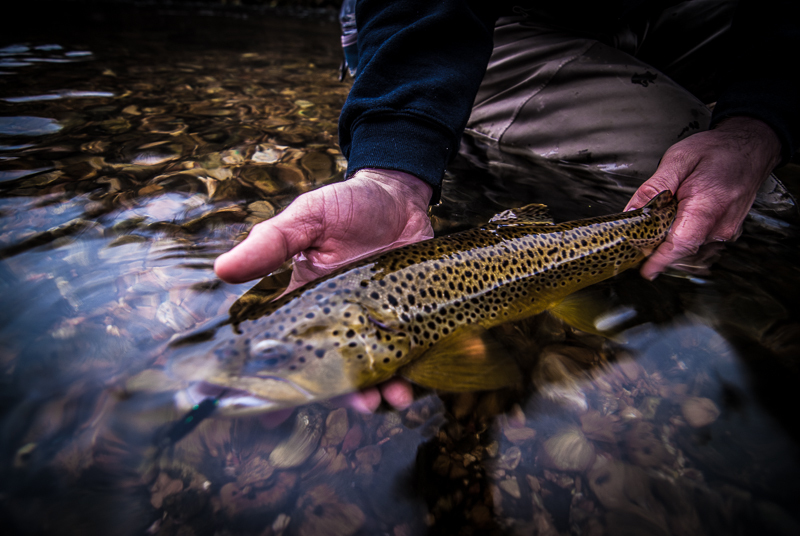 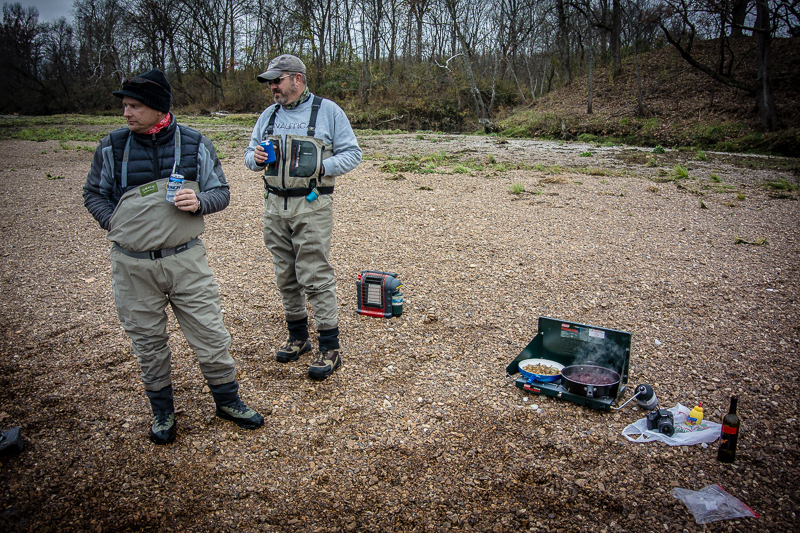 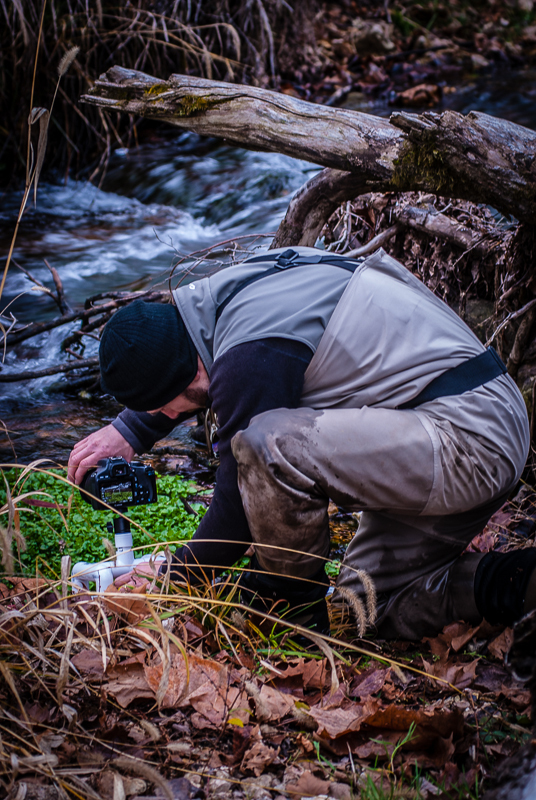 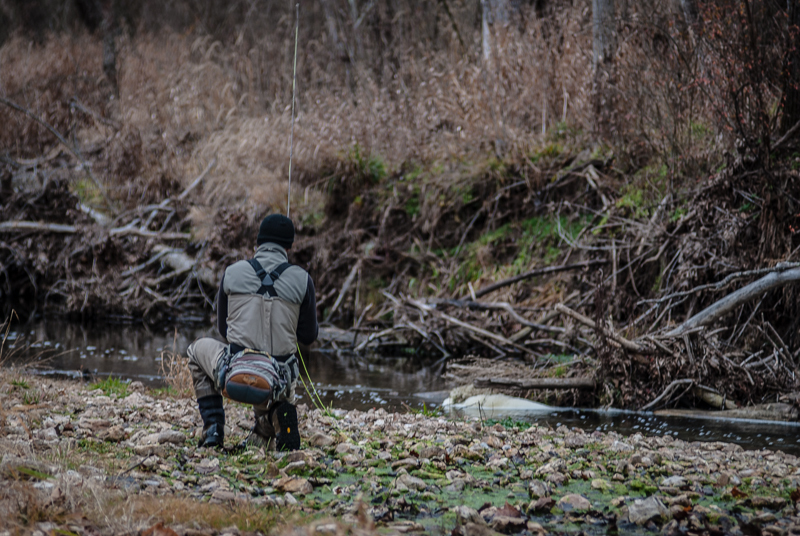 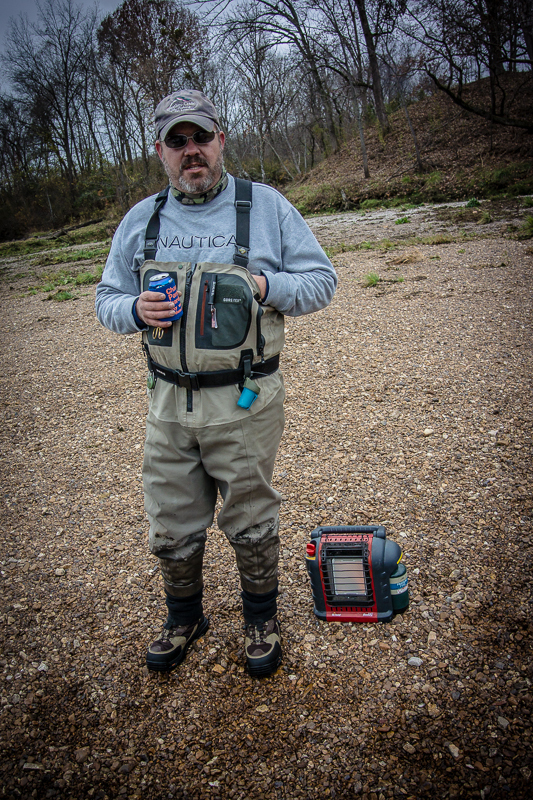 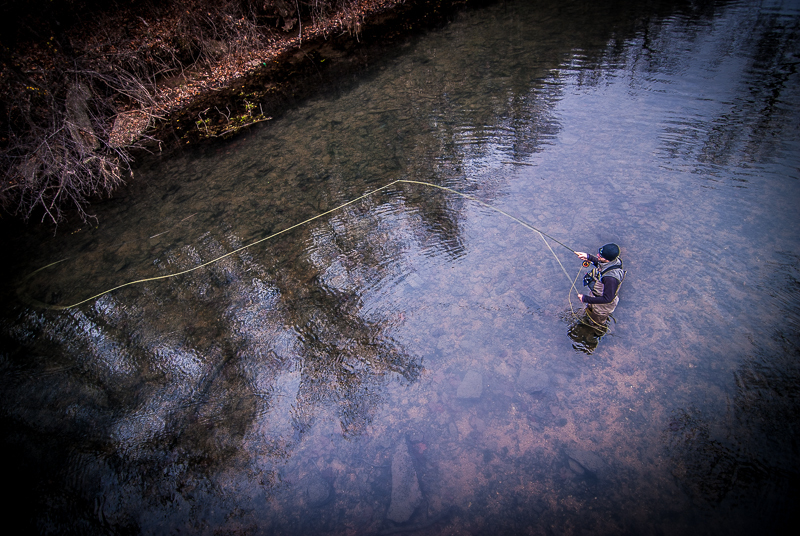 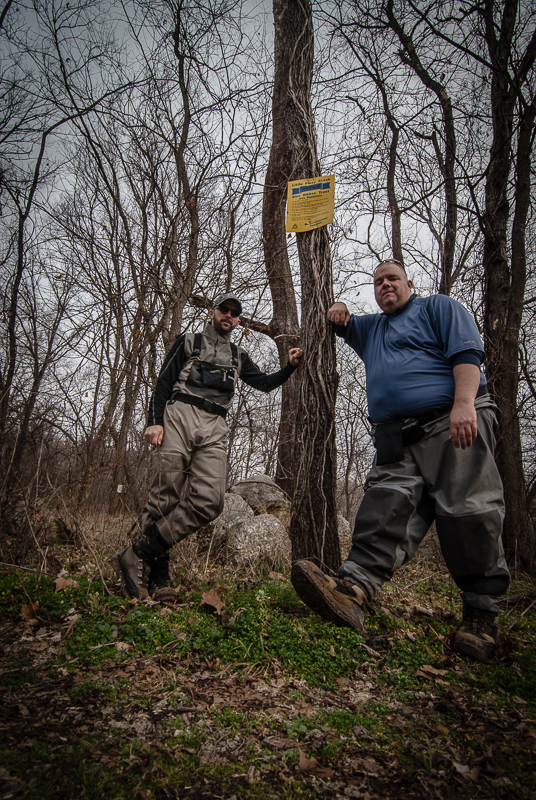 What has resulted is a helluva appreciation for all the trout water Missouri has to offer and a great time in the process, with lots of stories, pics, and videos along the way. 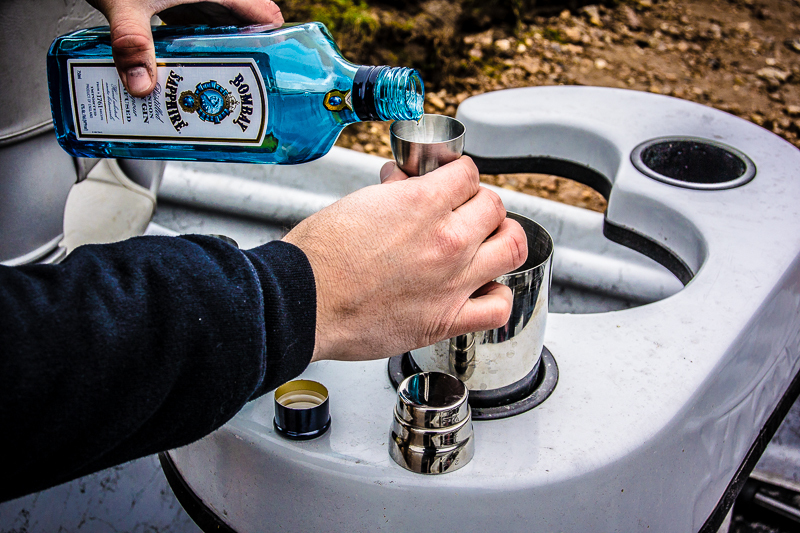 Each MTO is something that really can be explained in words — photos and video do it best. 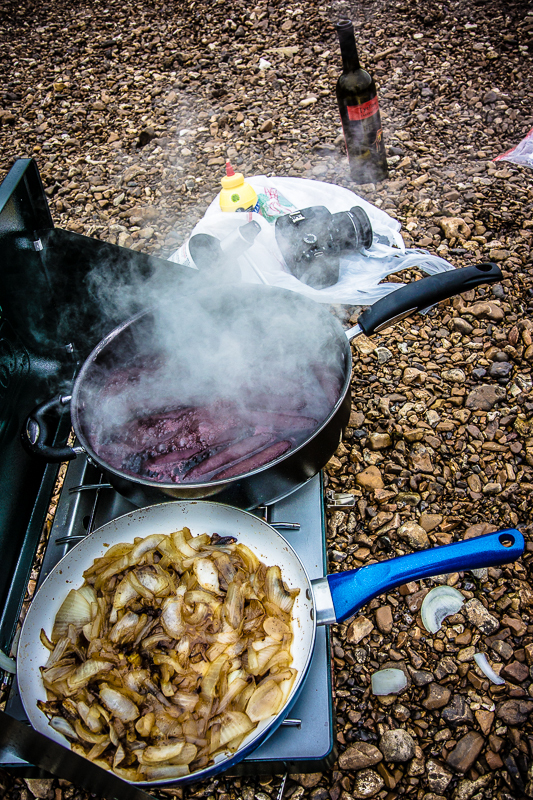 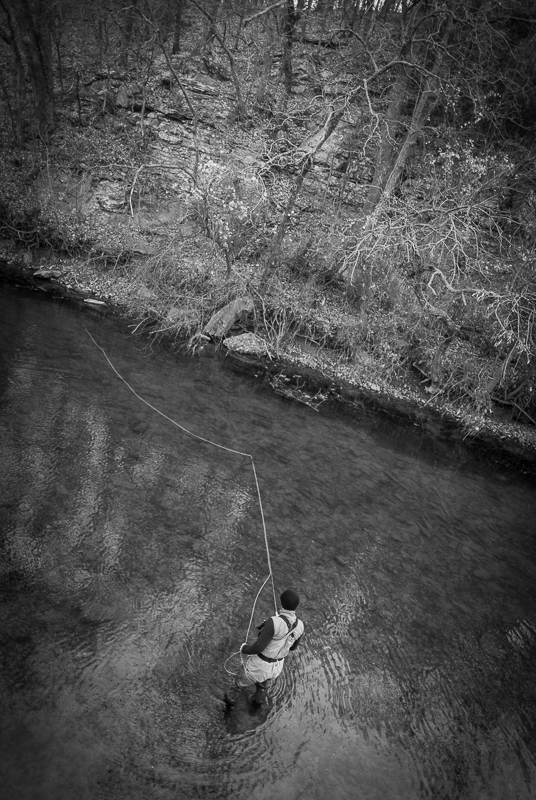 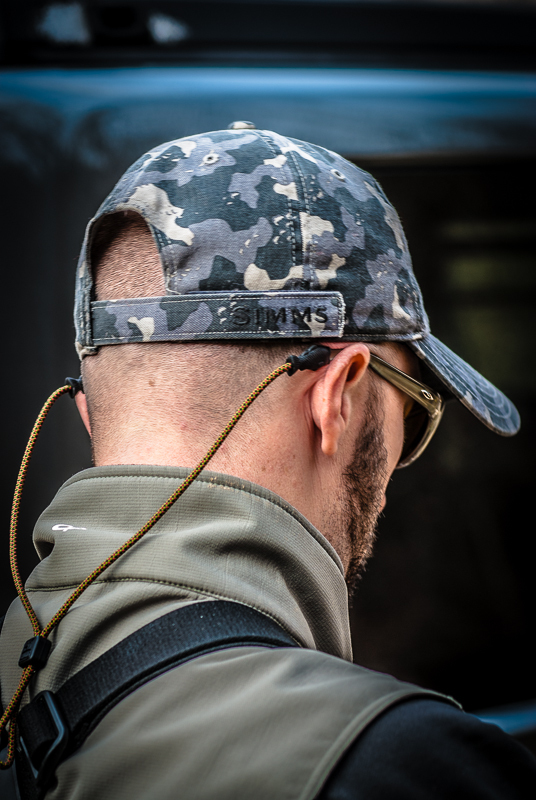 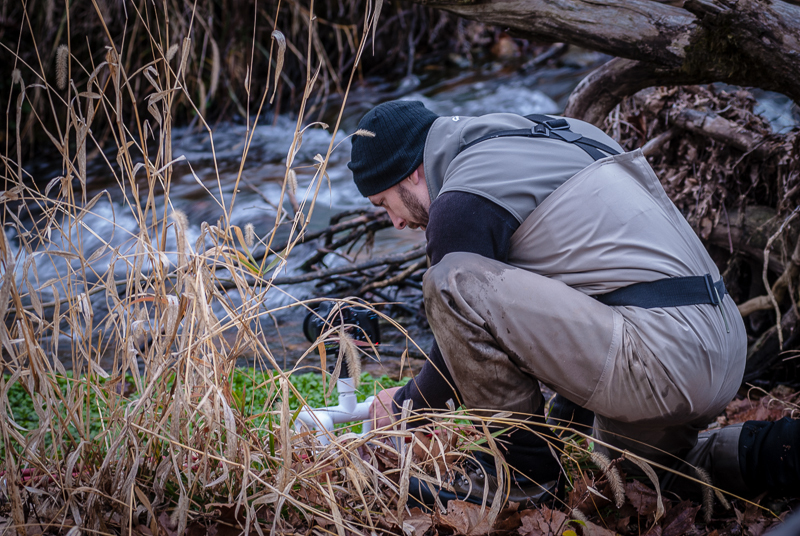 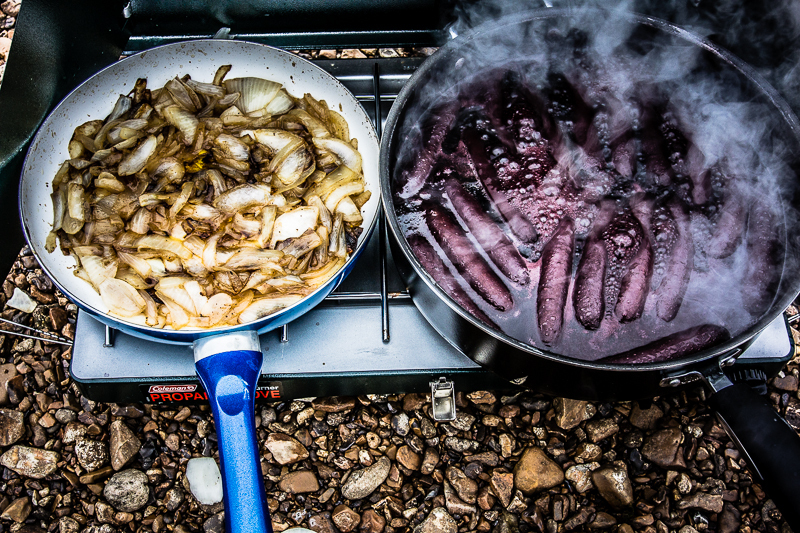 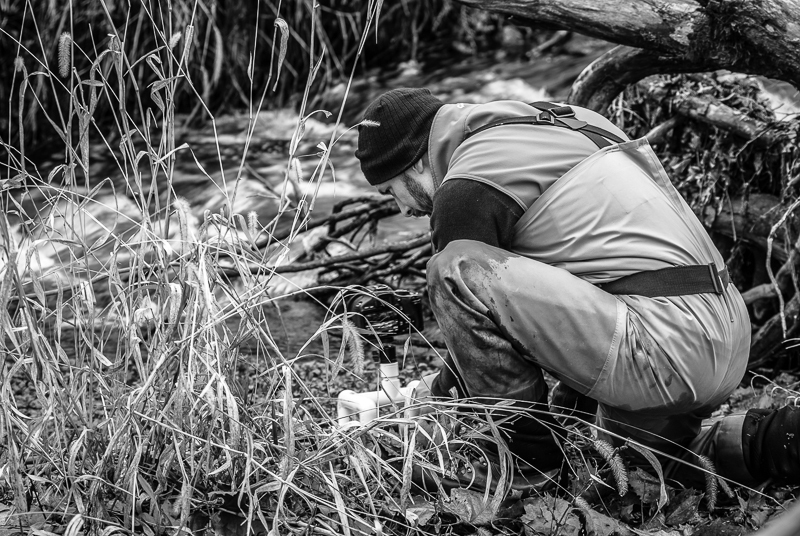 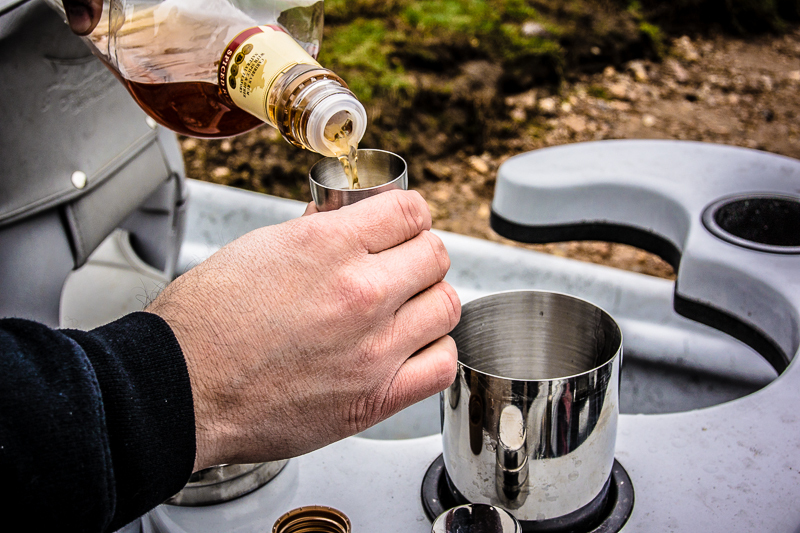 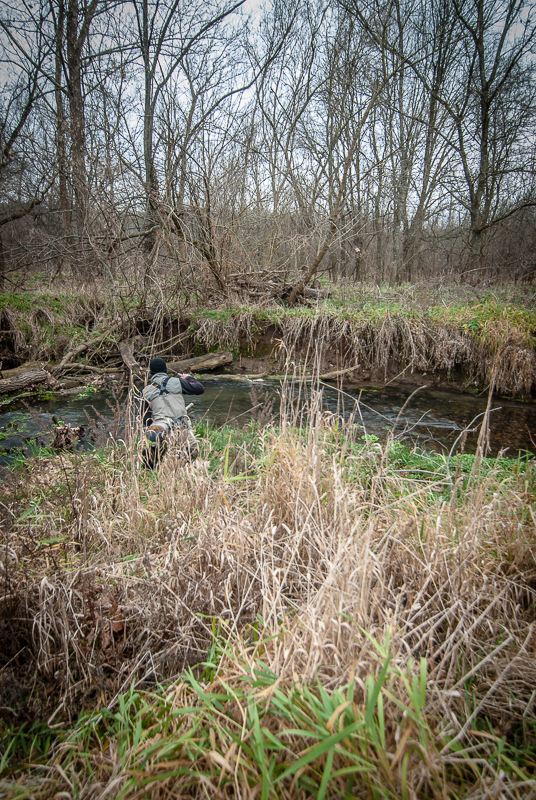 But the best way to experience it is to get out there and do it yourself…..besides it is only 1200+ miles and 21 trout streams over 4 days. 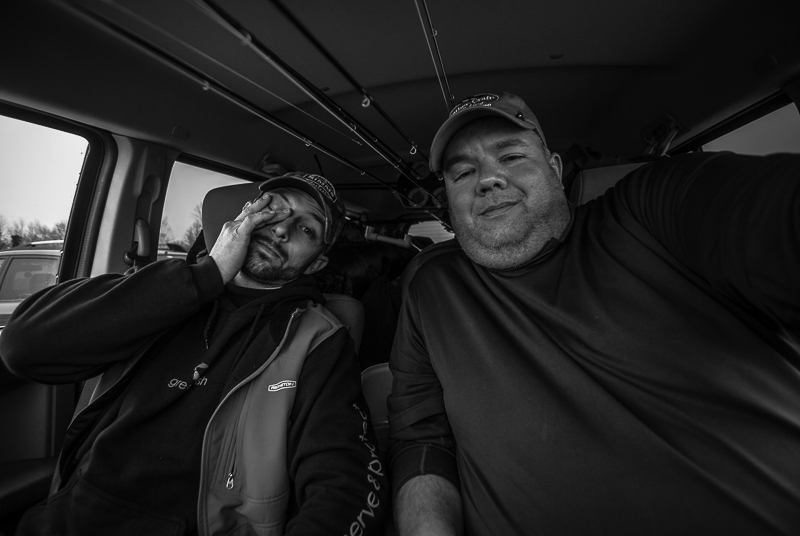 As the years go on, less and less planning go into this trip, but we finish every trip telling each other that this is the last year we do it…..only to come back a year or two later and do it again. 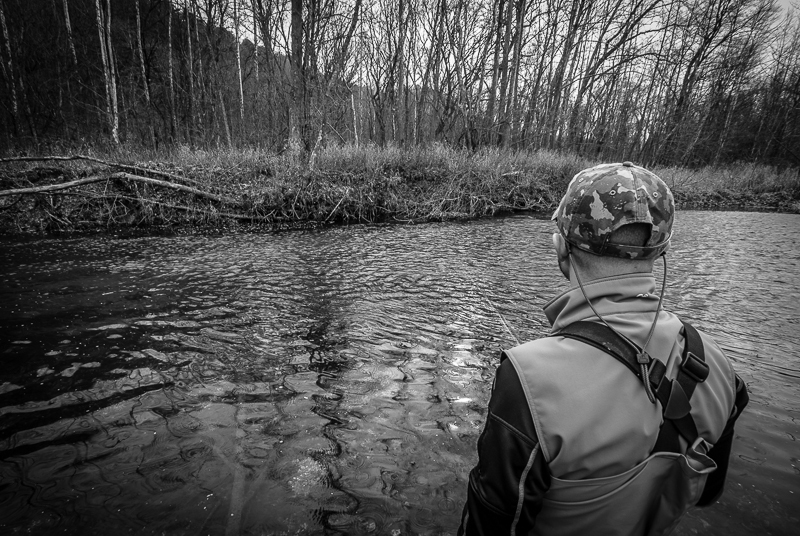 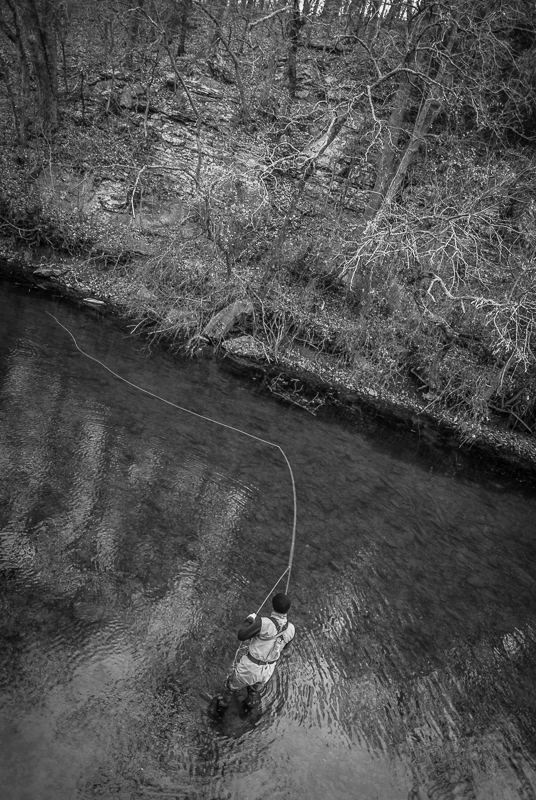 After 3 days of being on the road, we finally reached our final day, and the two streams we were looking most forward to fishing; the Eleven Point and the North Fork of the White. 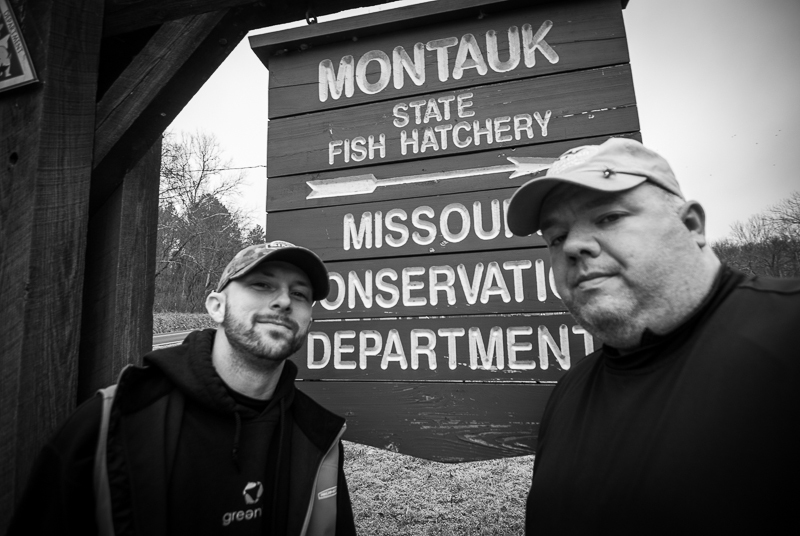 We also had to fish the Trout Park at Montauk State Park, due to some poor planning and not being able to fish the park on a thursday during the C&R season. 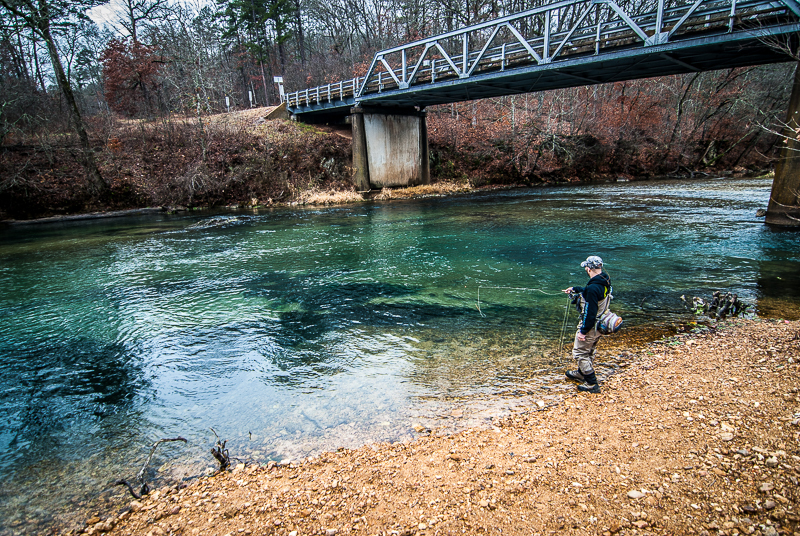 We left the confines of our Branson hotel early on Sunday morning and headed for our comfort stream….the NFOW. 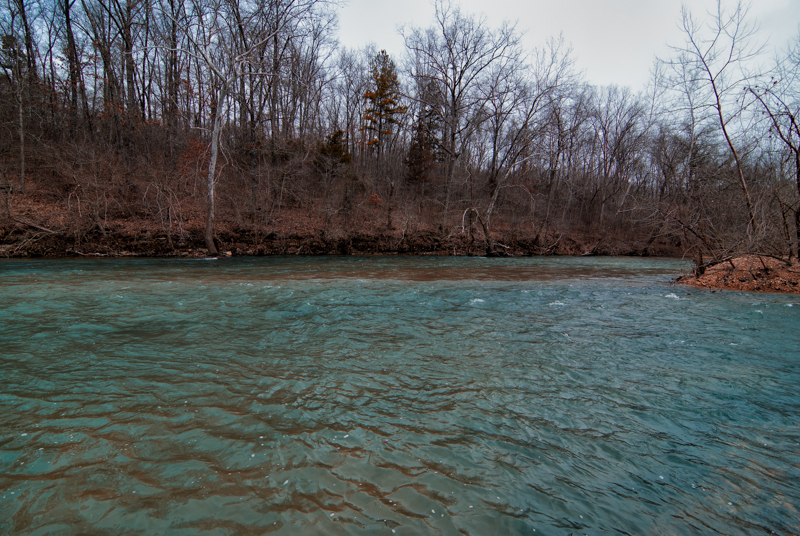 This is the river that Brian Wise guides on and it is the river that I try and fish every chance I get. 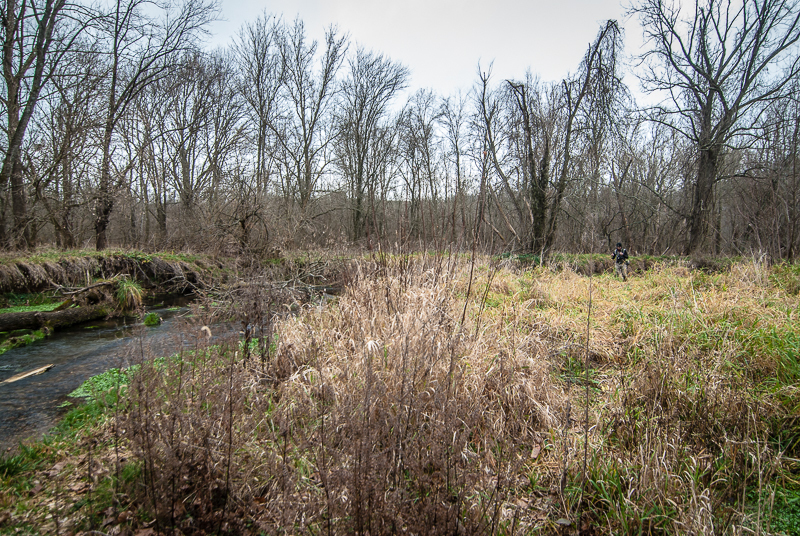 Pointing our car in the direction of the river was the easy part, getting there…..not so much…thanks to a massive storm that was settling over the area. 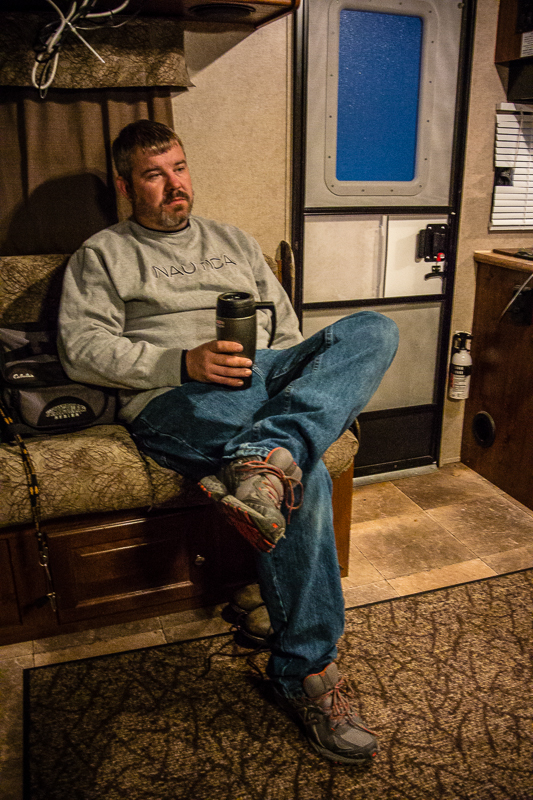 We drove through some torrential downpours and thunder and lightening, only to get to the NFOW just as there was a slight break in the storm. 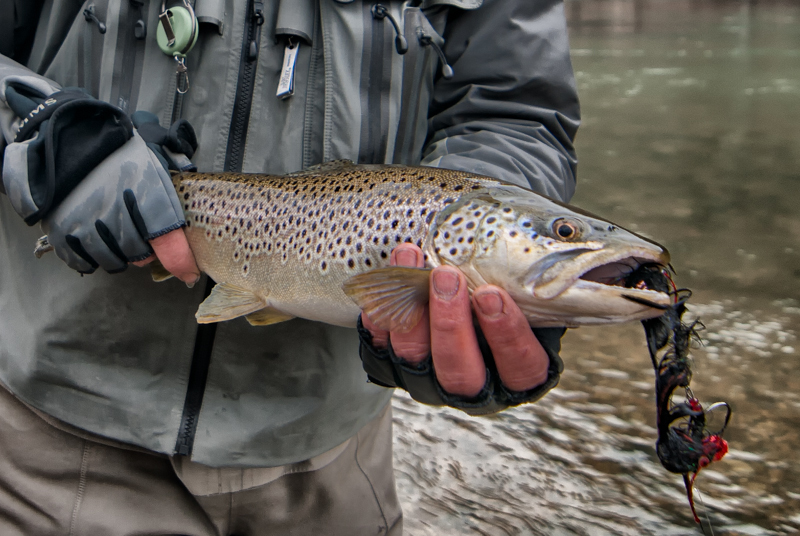 Like a good woman, the river didn’t disappoint, and provided us with our largest fish of the trip and probably the most photogenic as well. 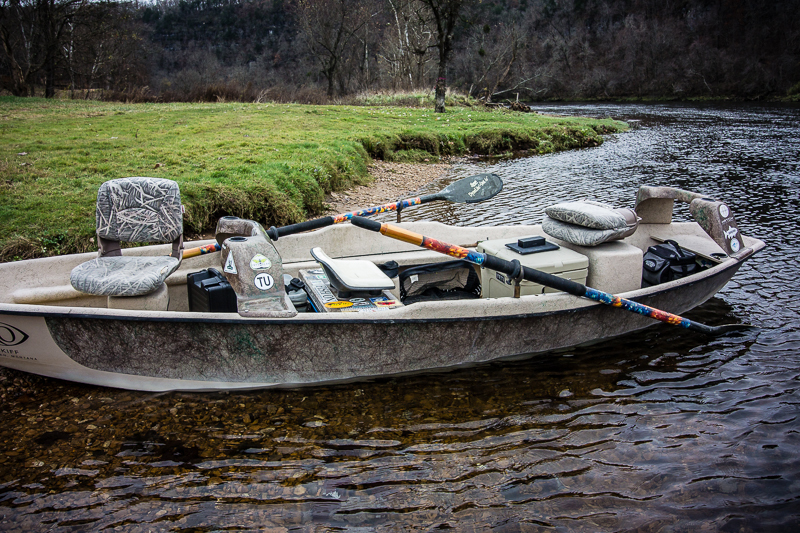 In a race to beat the rain, we quickly hit the car and headed towards the Eleven Point and met up with Brian Sloss of 11pt Canoe Rental, and like always the 11pt produces in both scenery and fish. 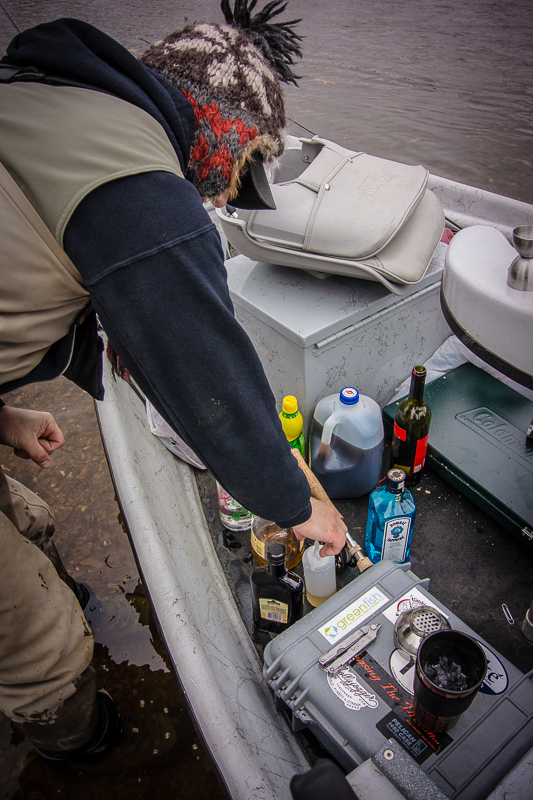 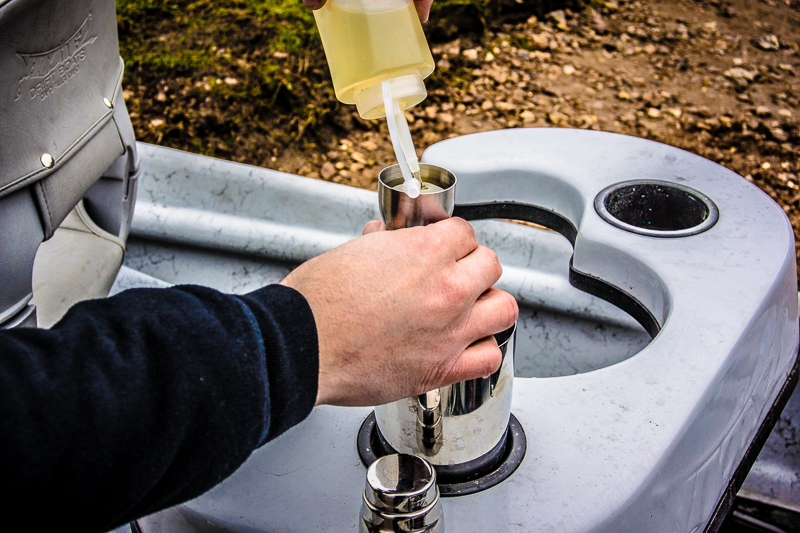 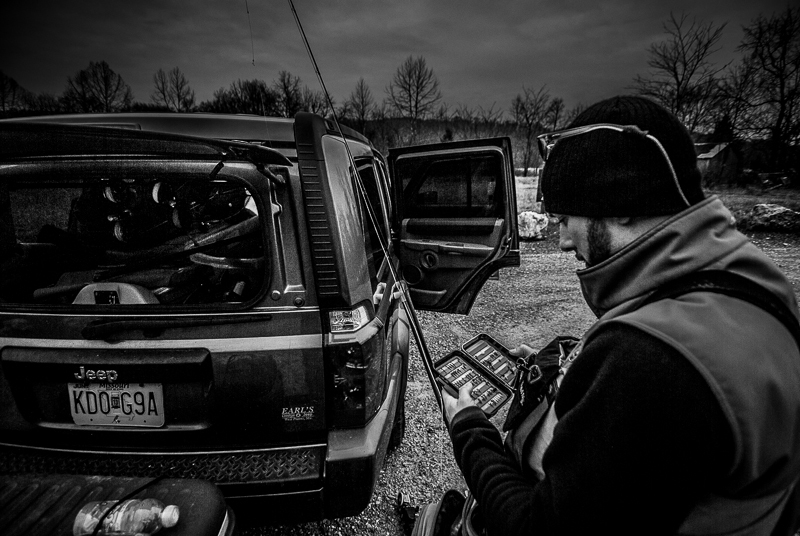 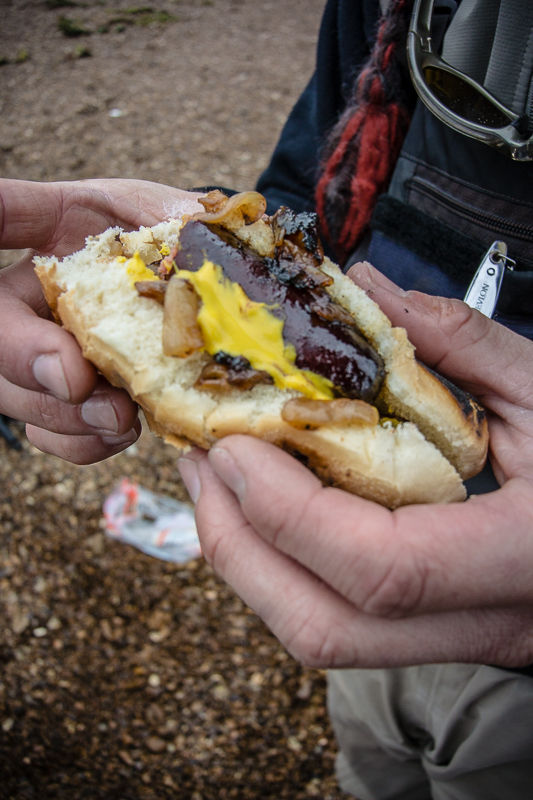 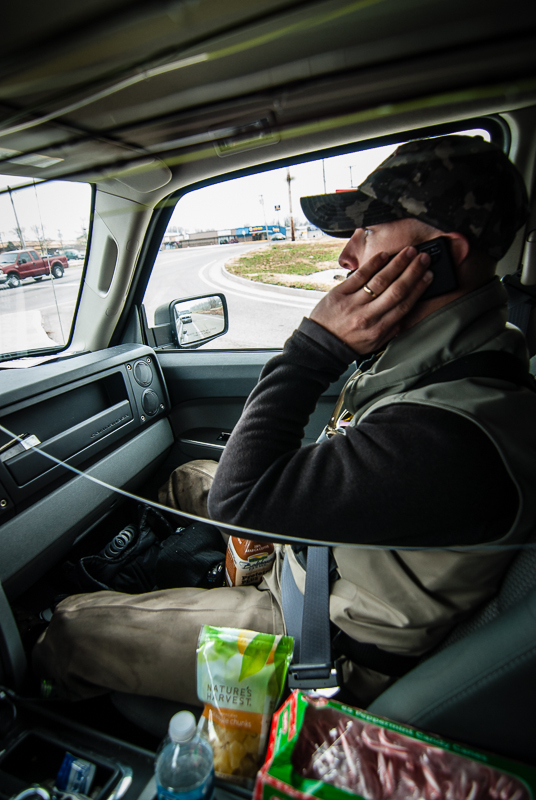 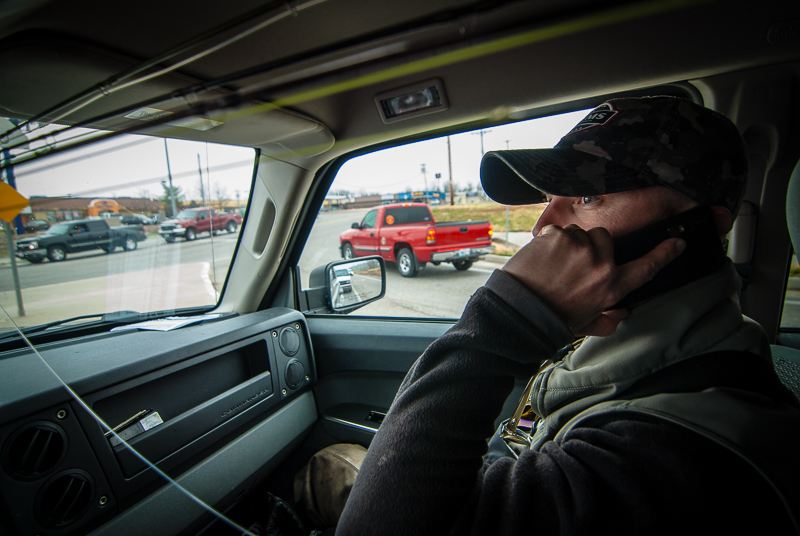 “Trust in Garmin,” were the words both Wise have uttered many times over the years while on an MTO trip. 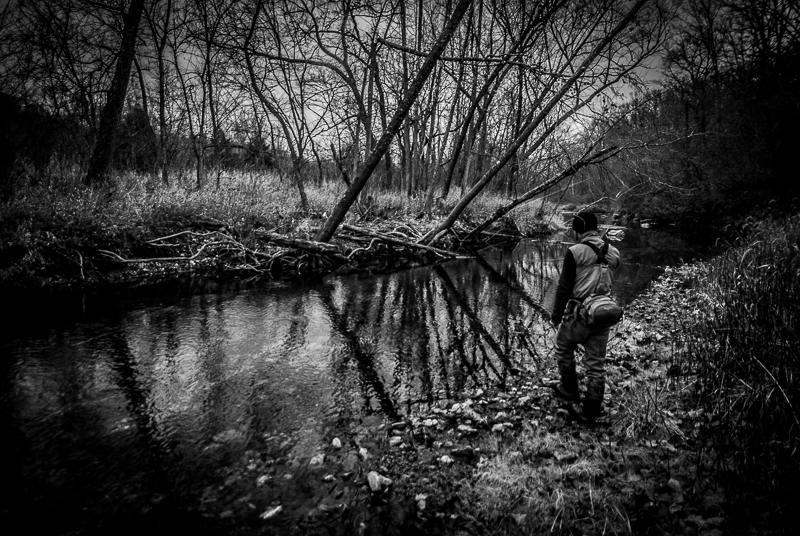 This last day was pretty special though, as Garmin took us what must have been the most direct route to Montauk State Park, but probably not the fastest, as we traversed various dirt, gravel, two track, highway, and a stream crossing or two on our way to our final destination — Montauk State Park. 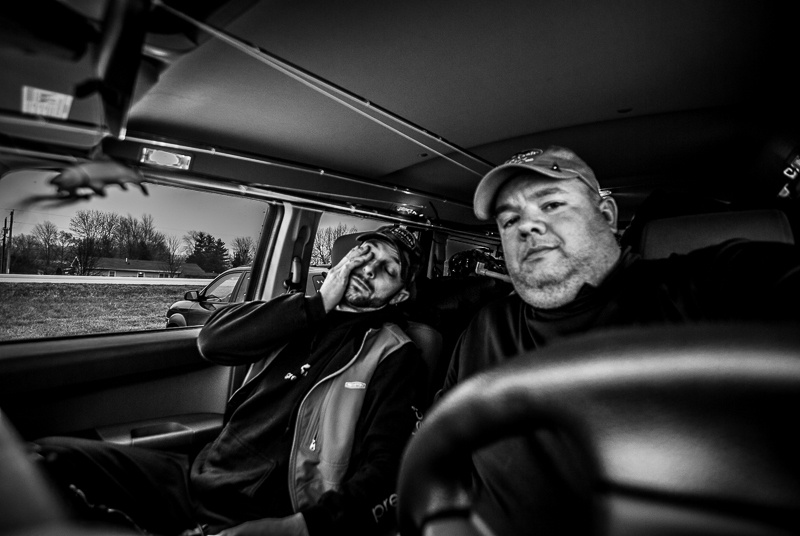 It was one of the more memorable and scenic drives of the trip; mainly because neither of us had any idea where we were or how to get out (much like the first night of this MTO, when we drove in circles in Mark Twain National Forest looking for a place to camp that wasn’t partied on by the locals). 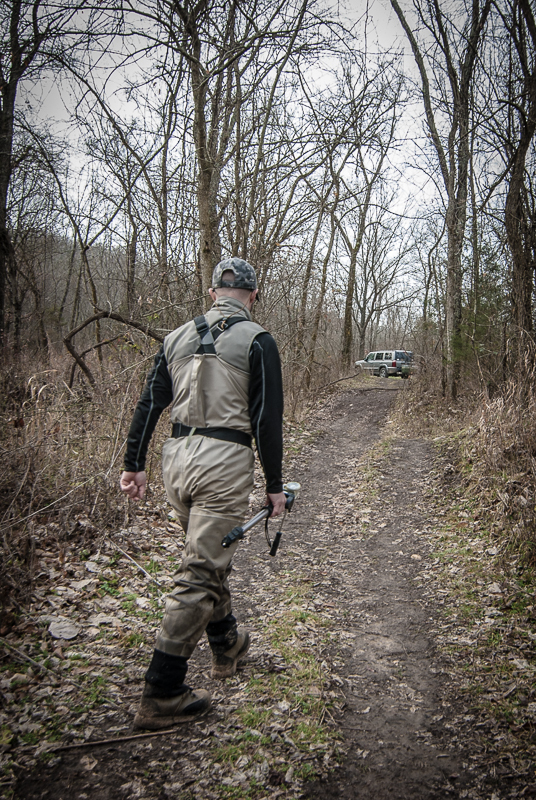 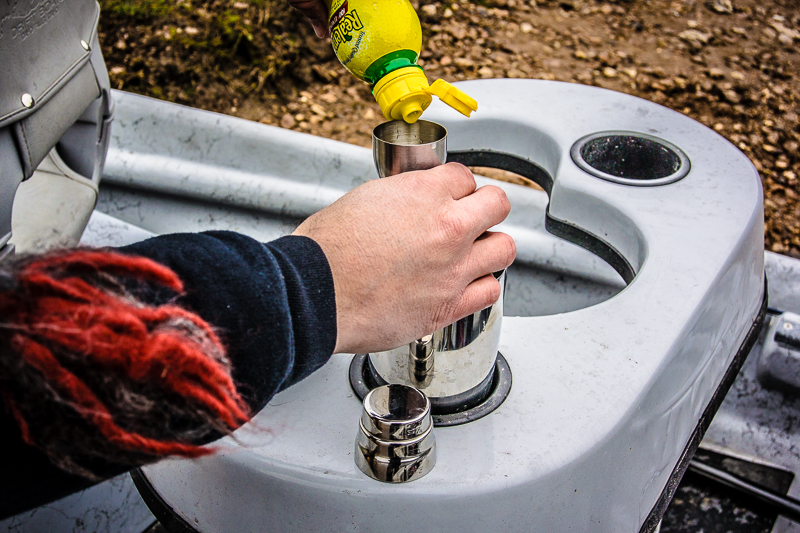 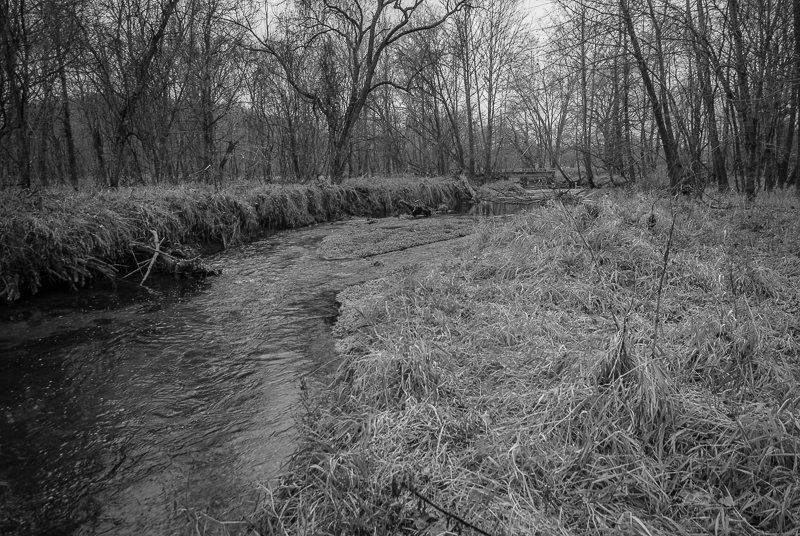 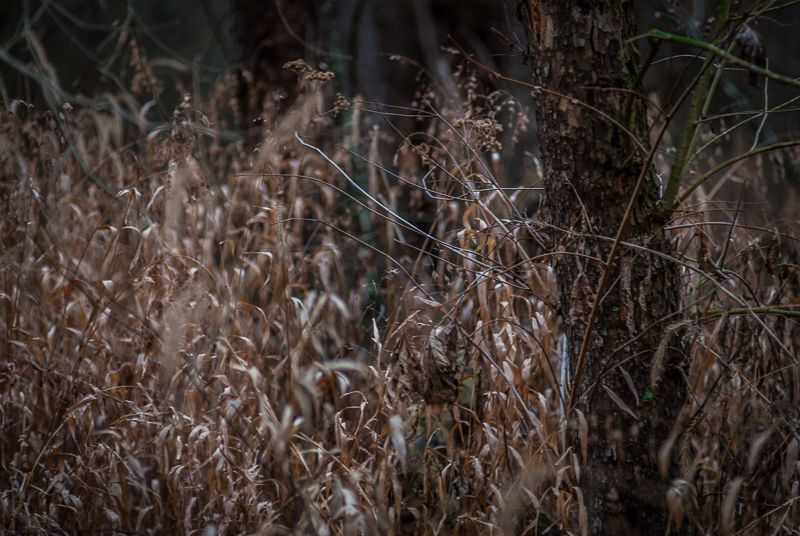 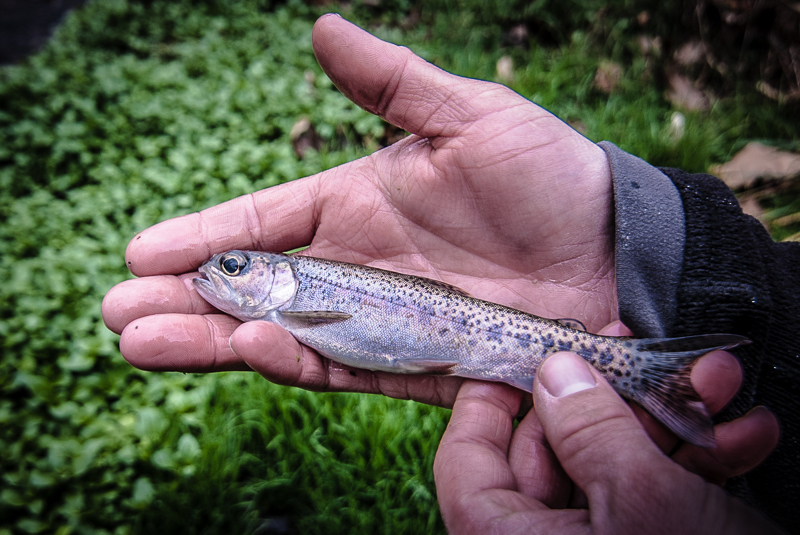 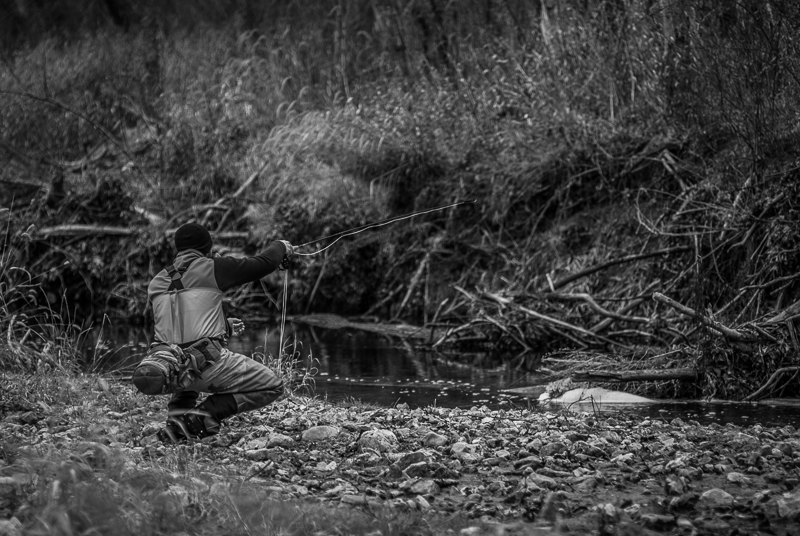 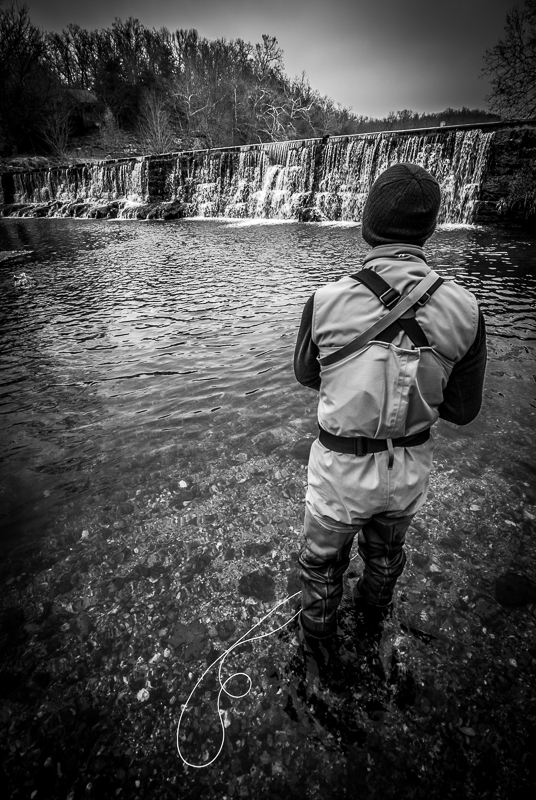 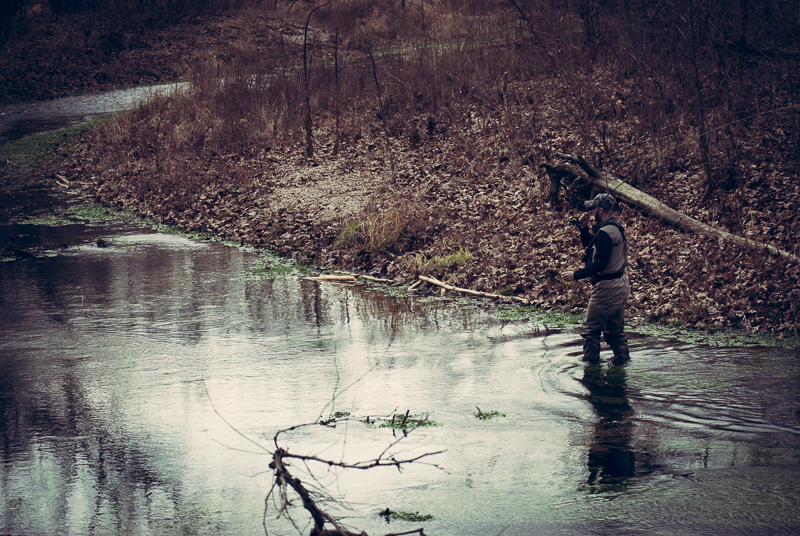 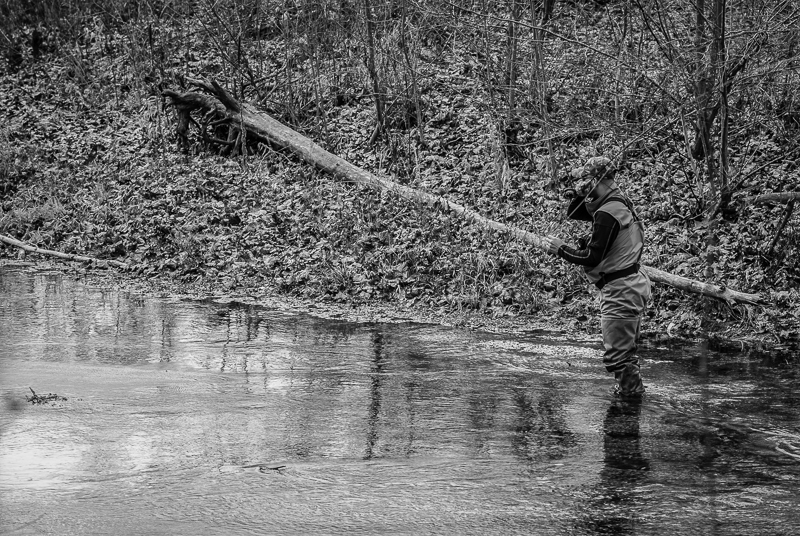 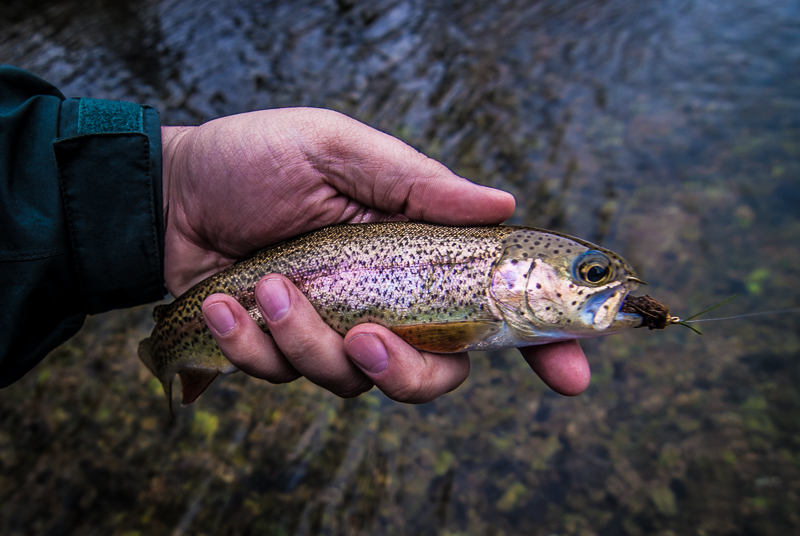 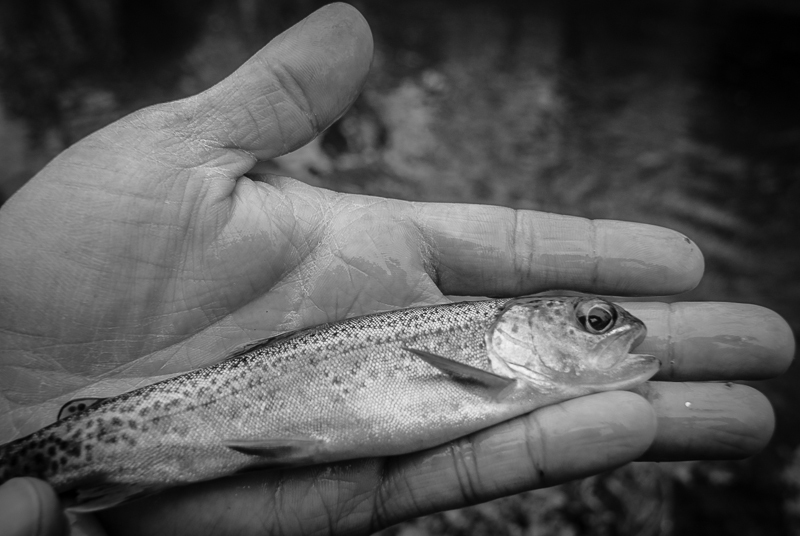 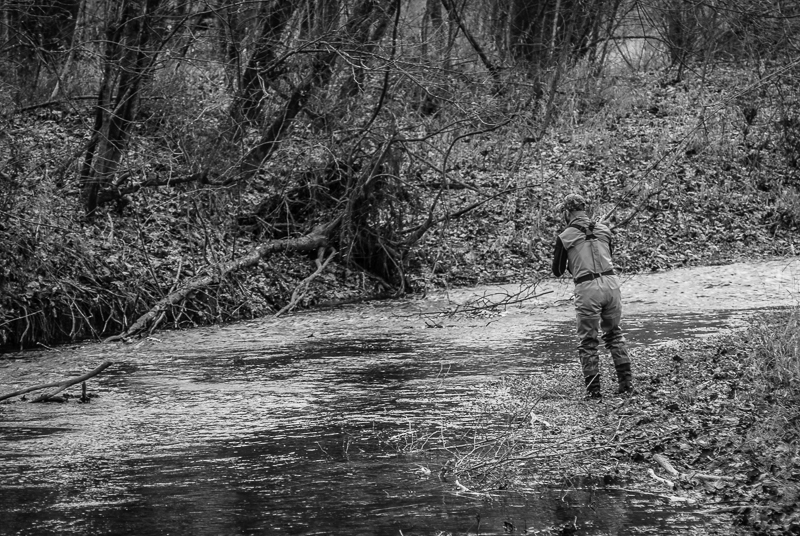 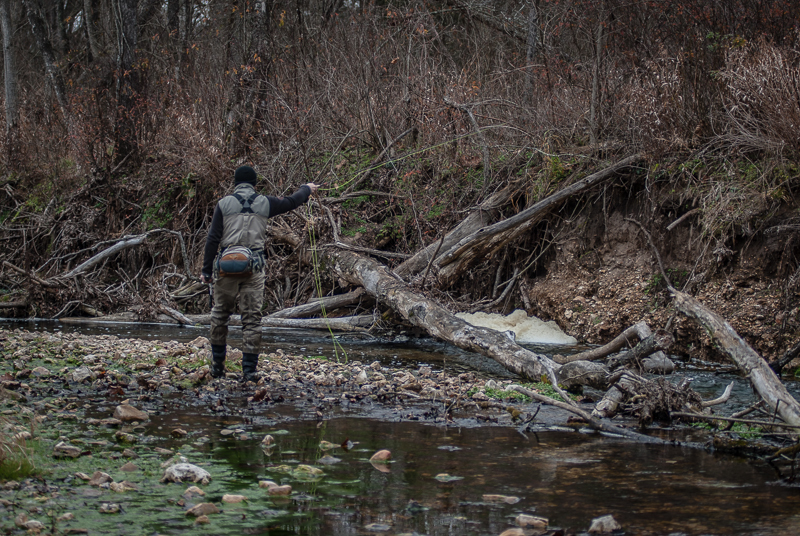 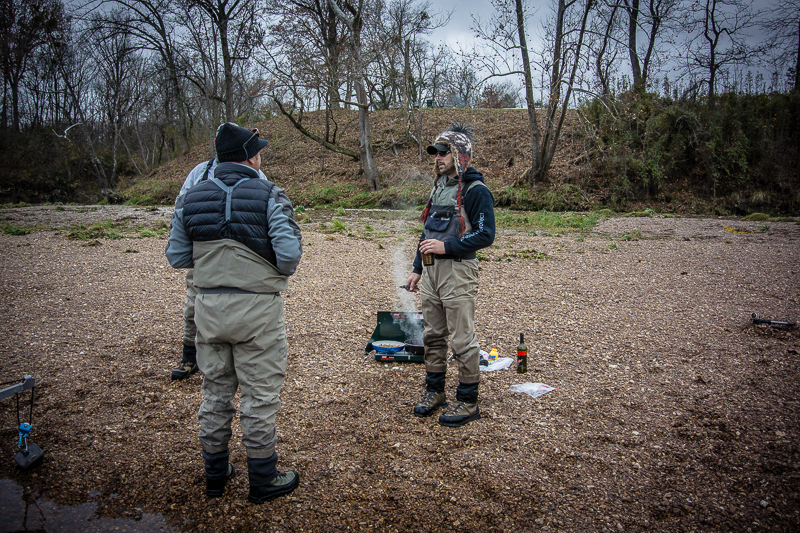 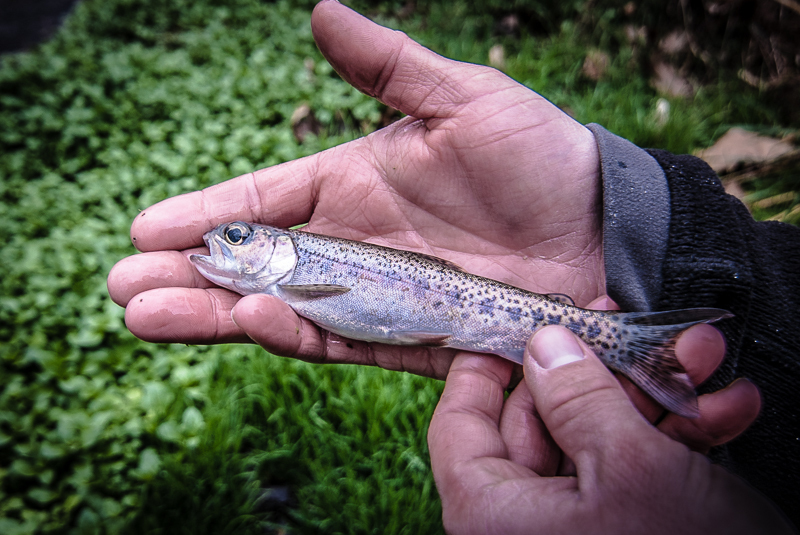 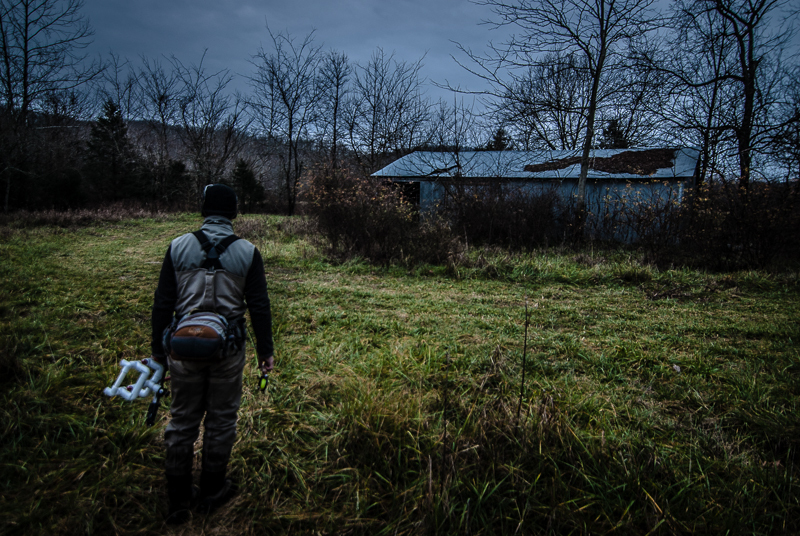 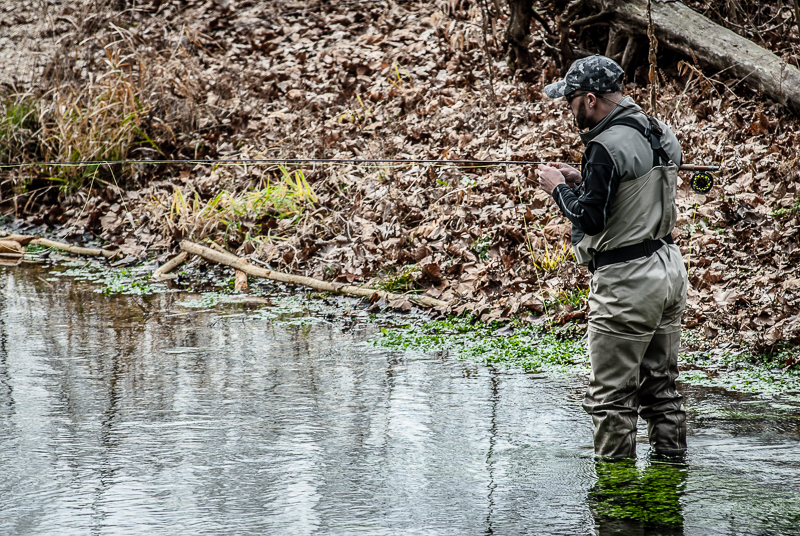 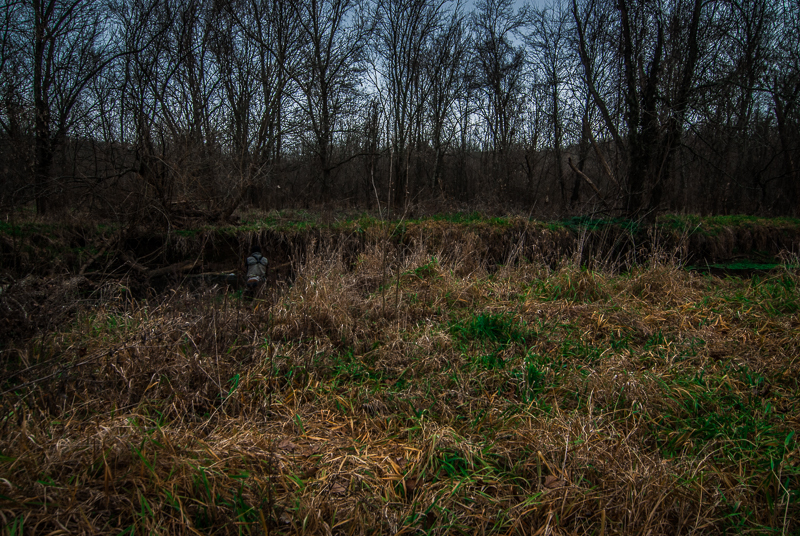 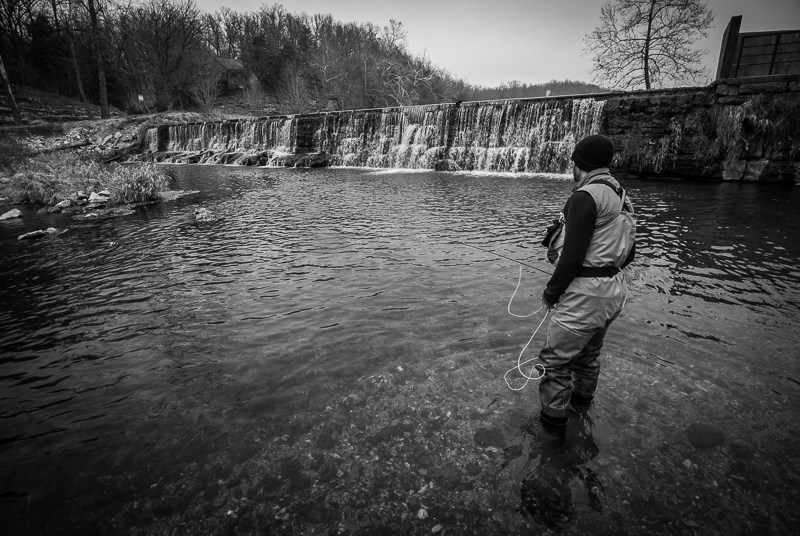 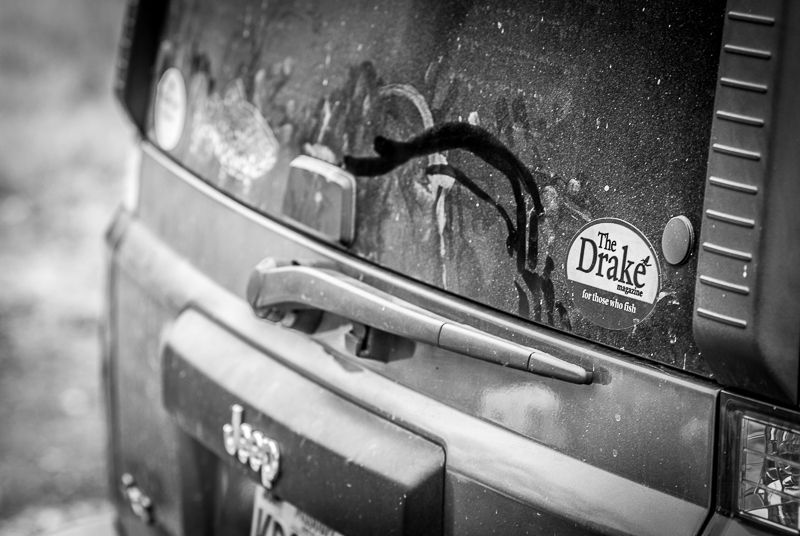 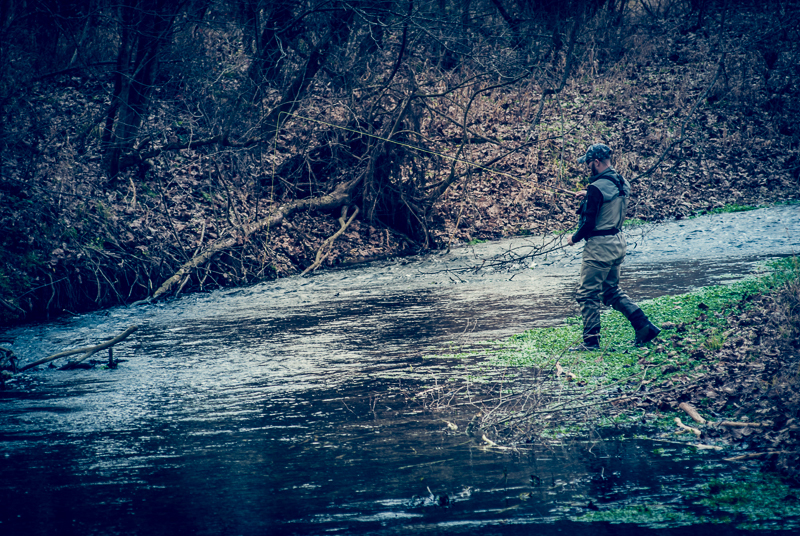 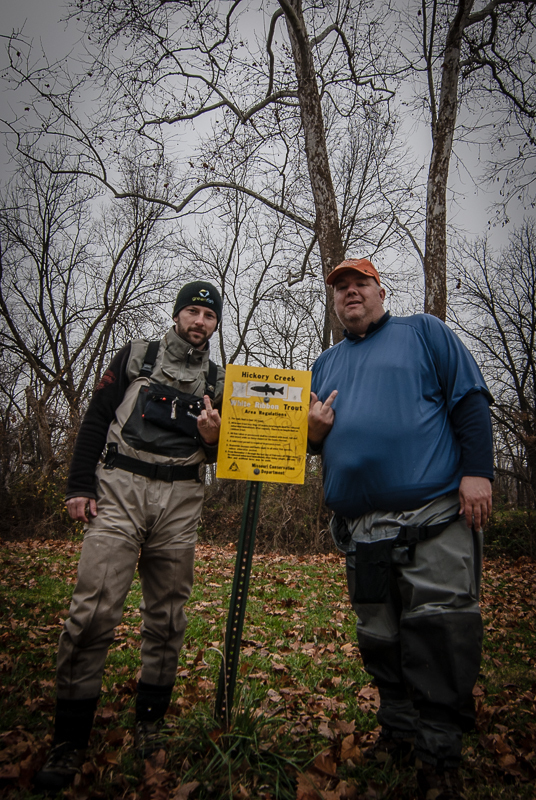 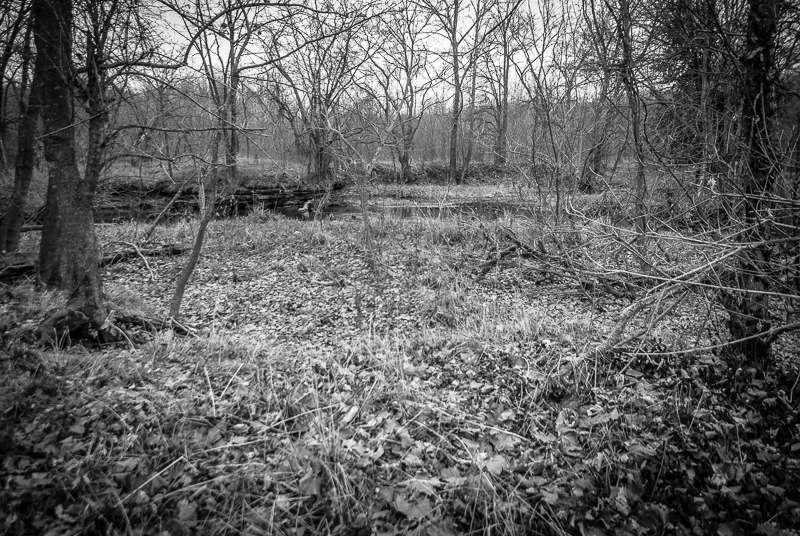 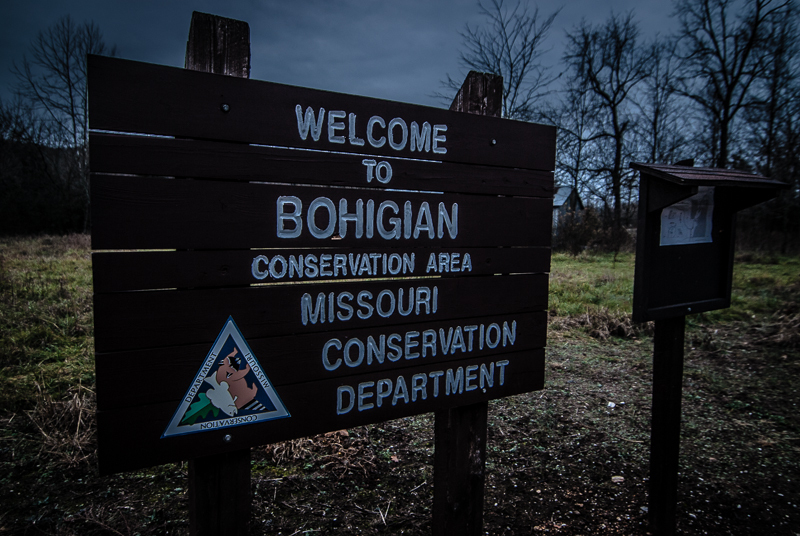 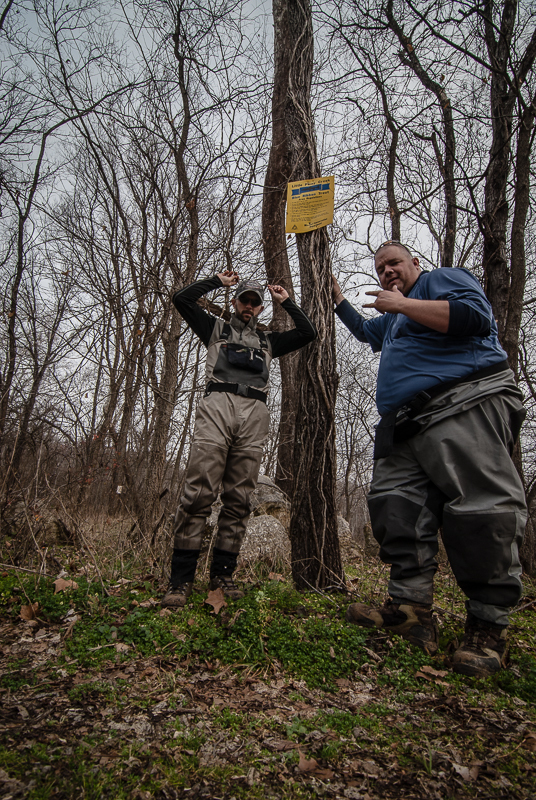 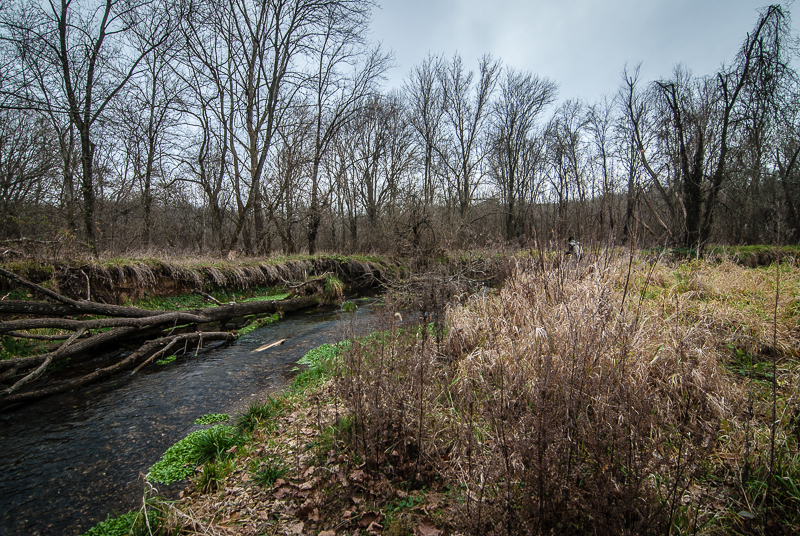 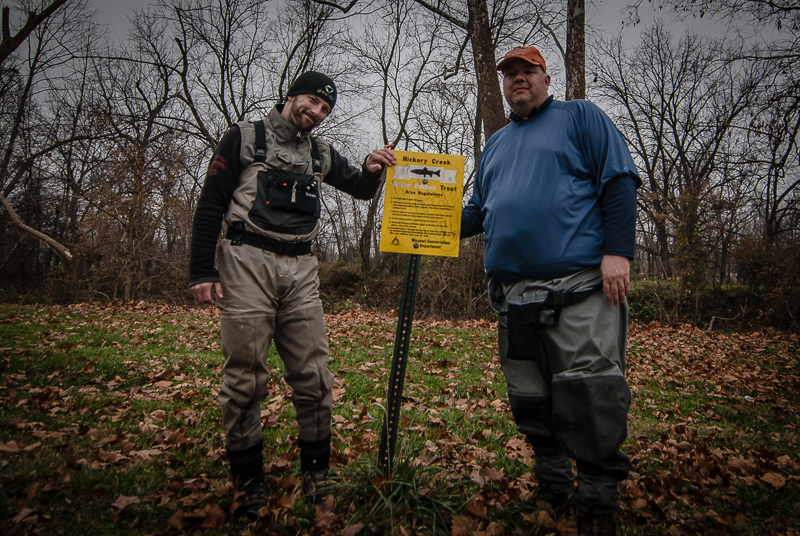 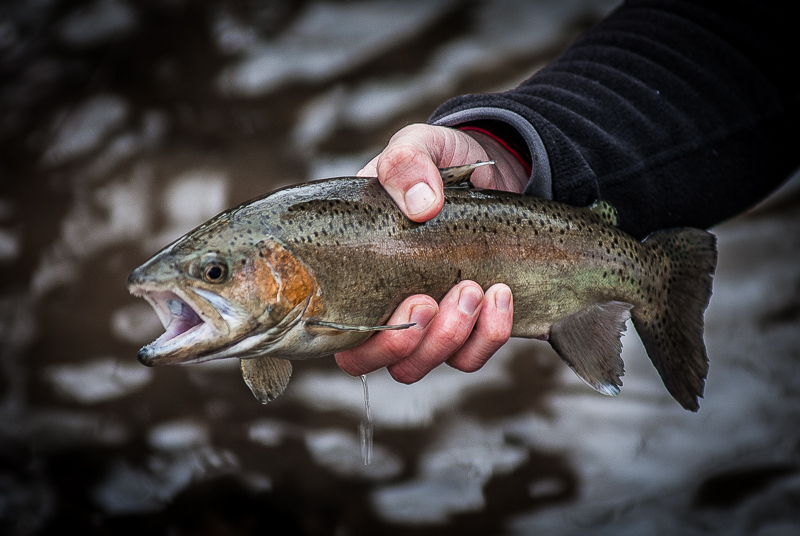 We hopped out of the Jeep just in front of the rain and ran down to the ditch to eek out a fish or two, then it was time to take off the waders and settle in for the quick drive back to Licking, Missouri to sort out the gear and hear our separate ways……another Missouri Trout Odyssey completed…….. 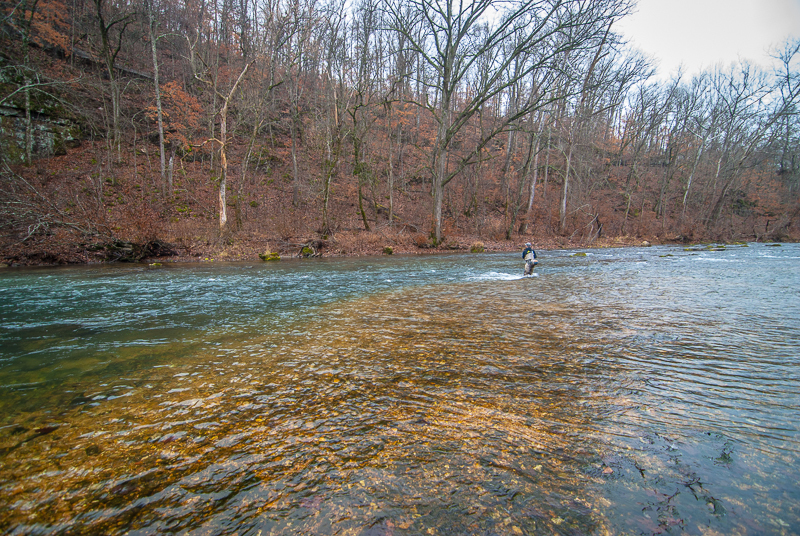 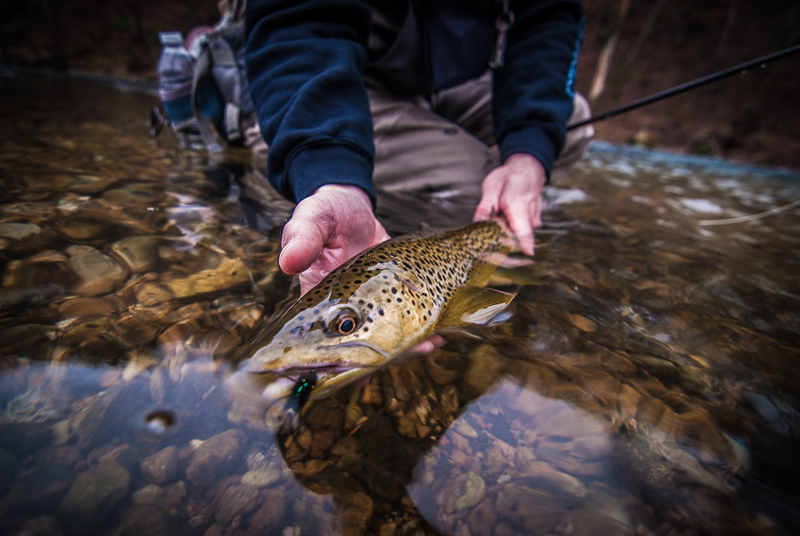 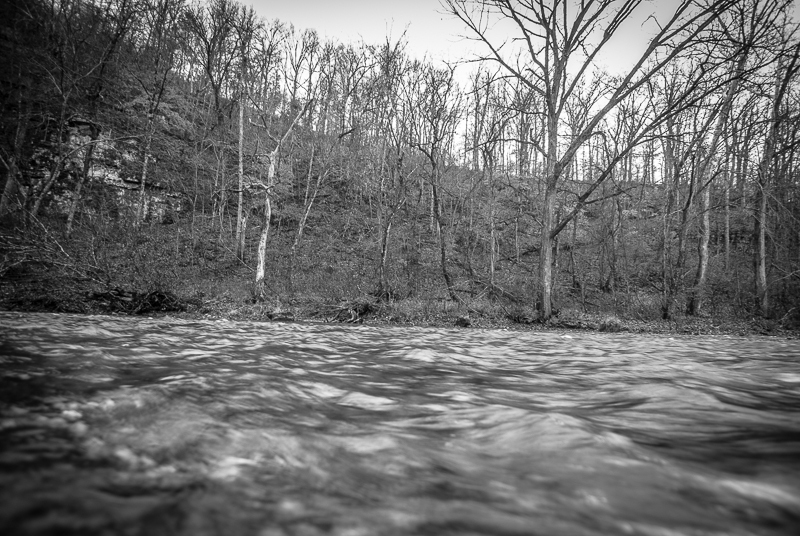 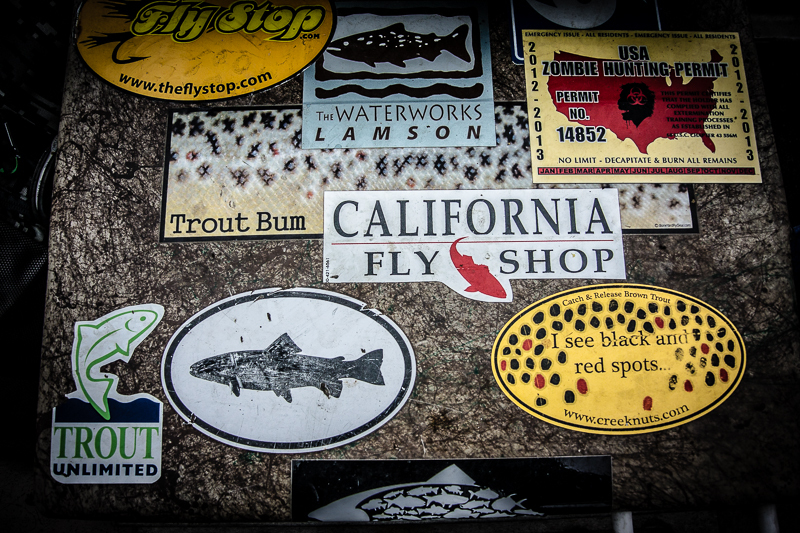 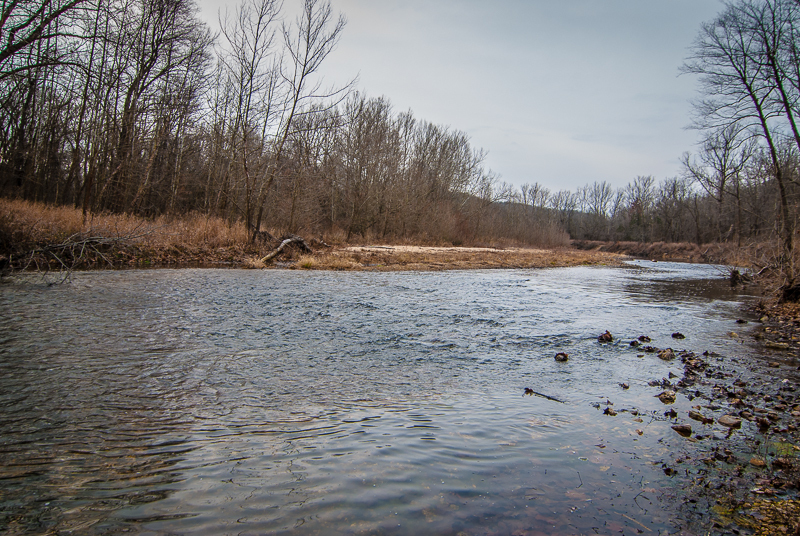 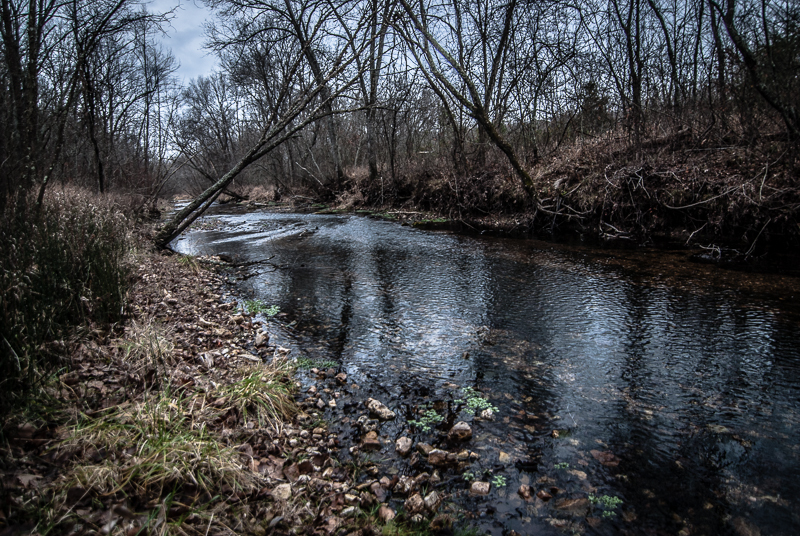 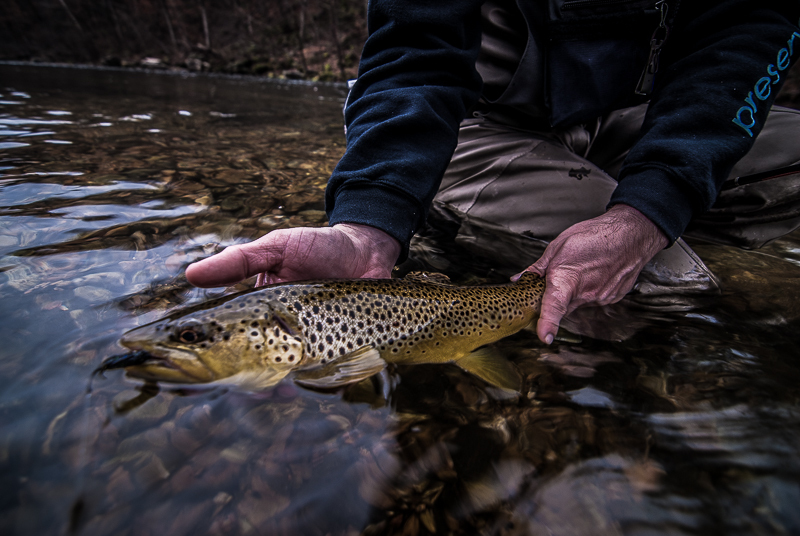 Plenty of memories, stories, photos, and videos, to keep us appreciating all the different trout water Missouri has to offer. 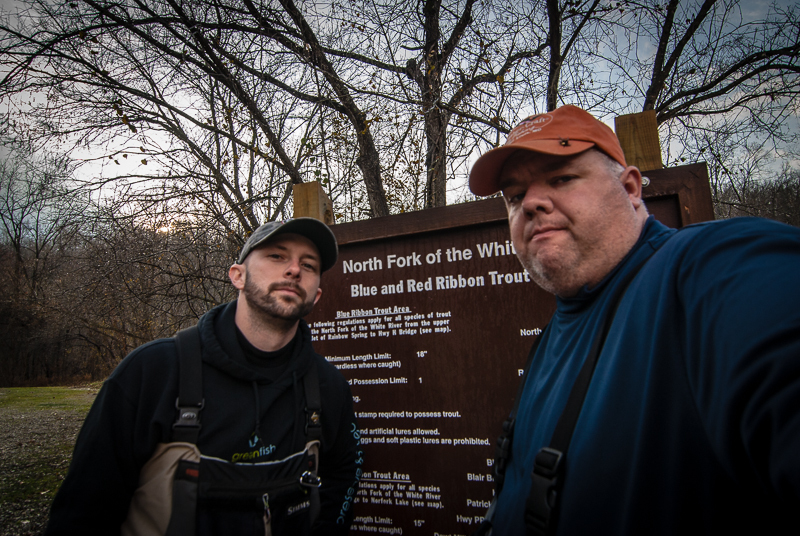 Day 4 included a ton of miles and the North Fork of the White River, the Eleven Point River, and Montauk State Park Trout Park. 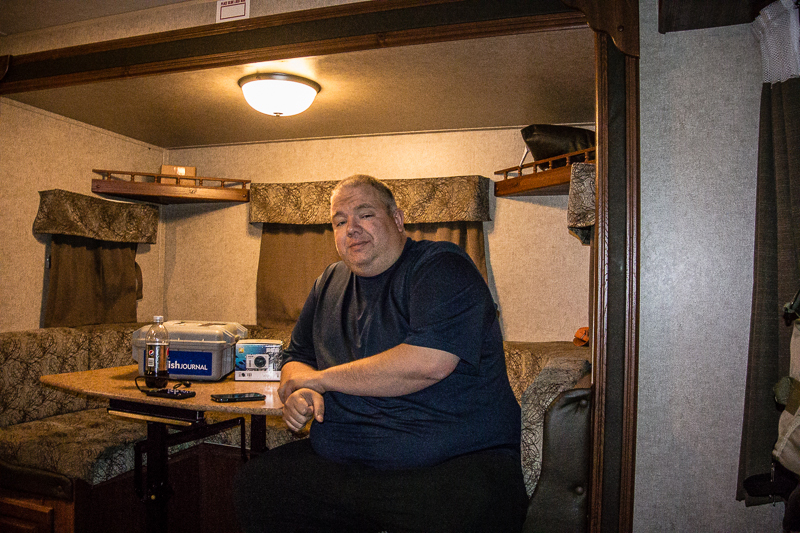 Here are the photos from Day 4. 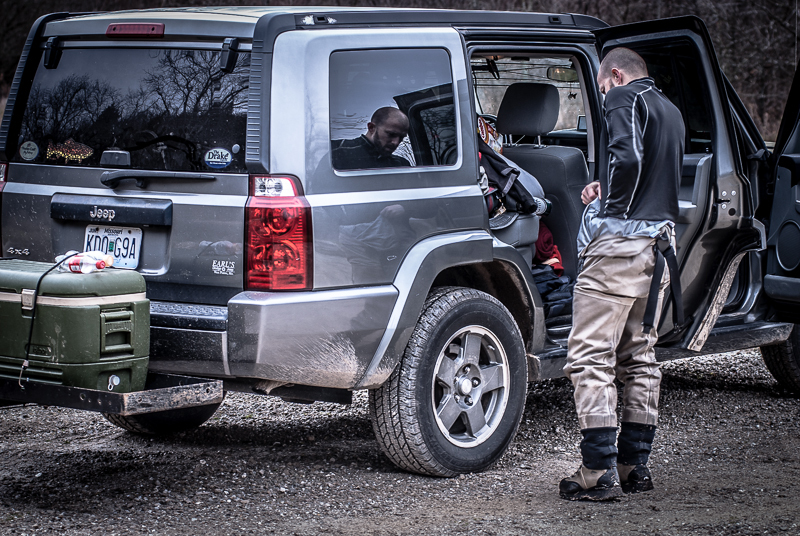 Day 3 was our biggest drive day. 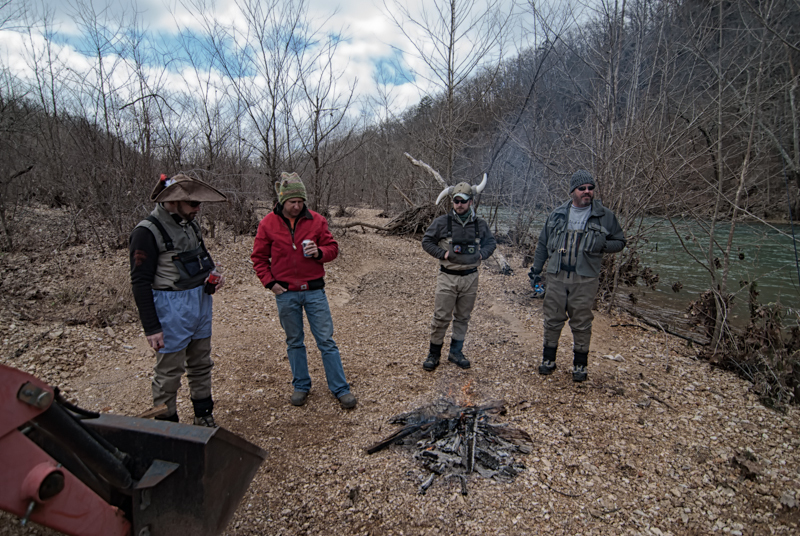 After breaking camp early on Saturday morning (much to the surprise of the 2 other groups camping in the campground), we headed south on a 130 mile journey to our next destination, Hickory Creek. 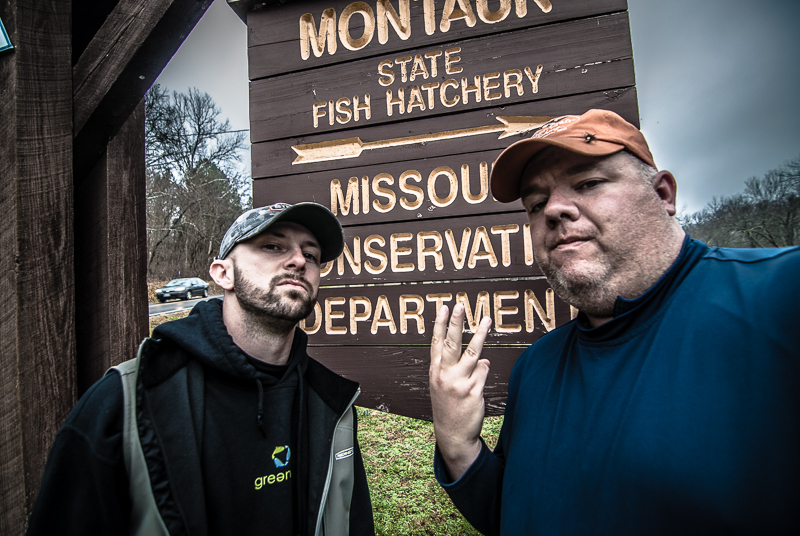 This little creek hasn’t really treated us well over the years of doing MTO, earning such nicknames as “the shithole”, but this year a new leaf was turned over. 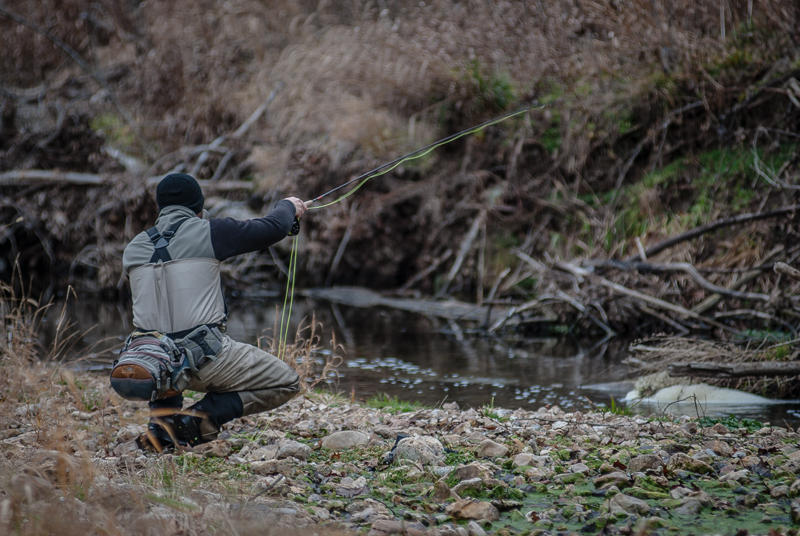 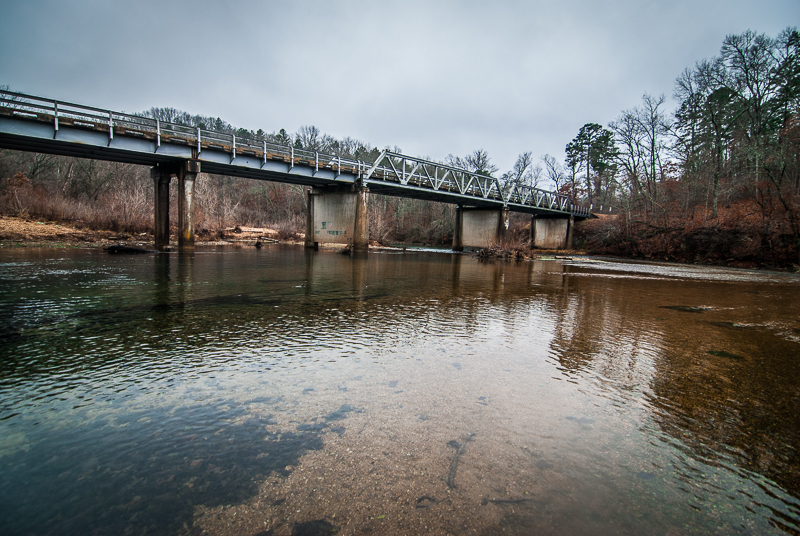 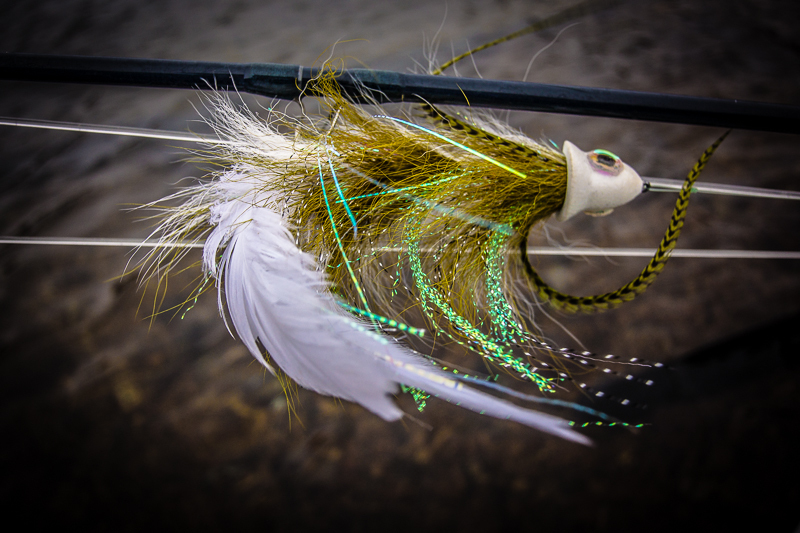 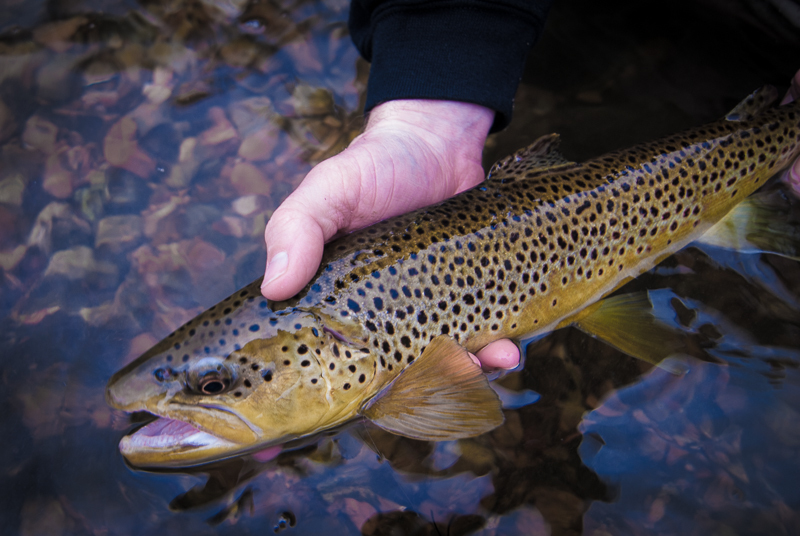 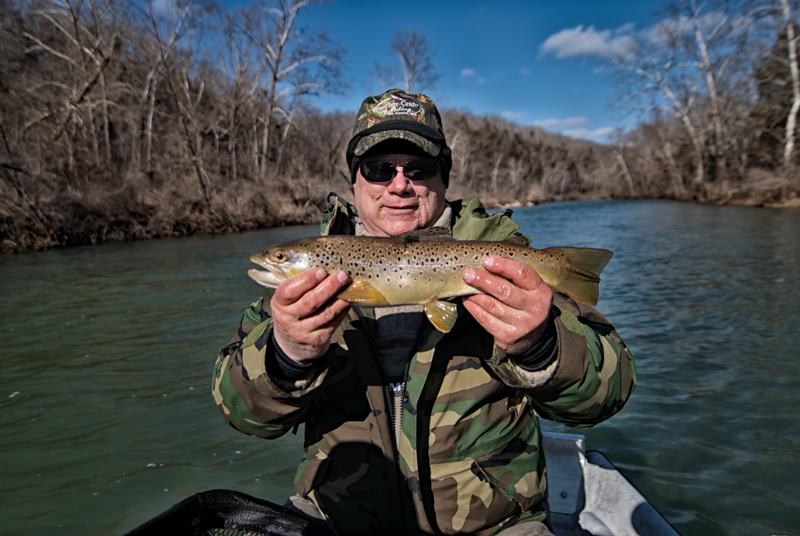 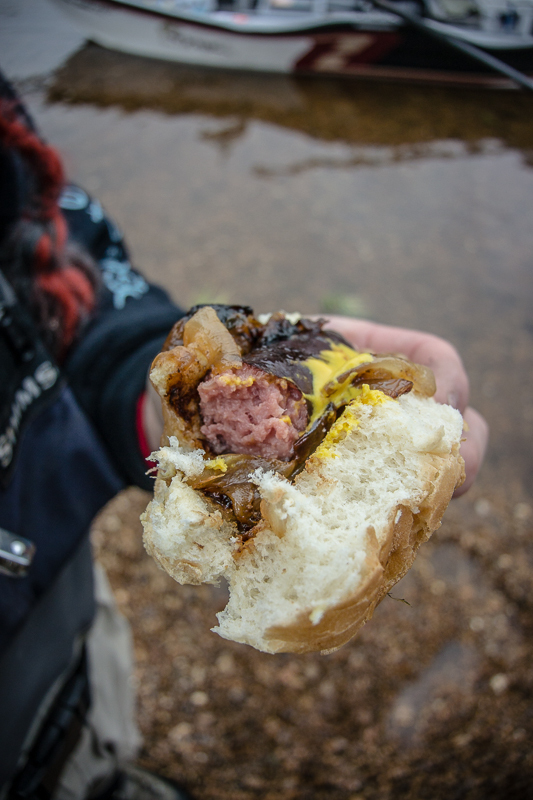 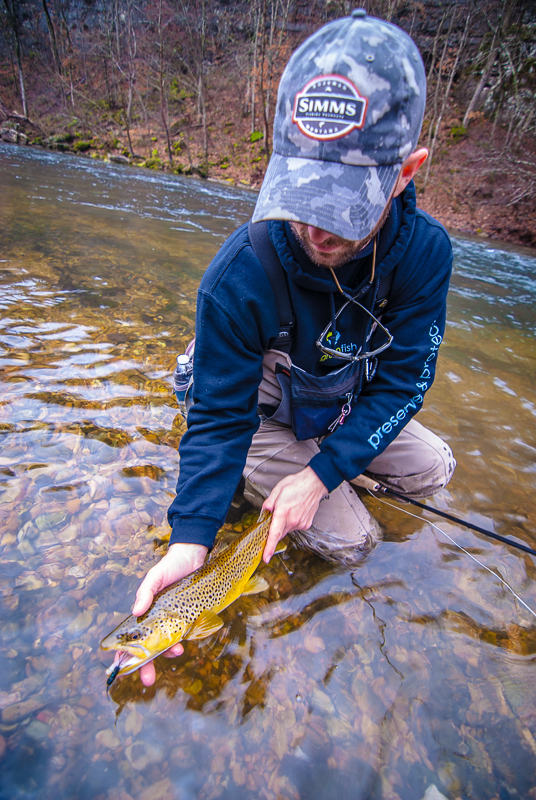 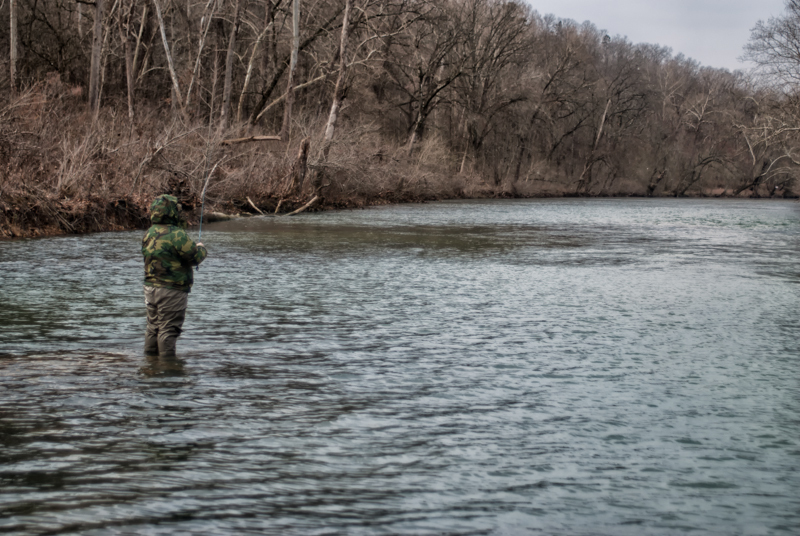 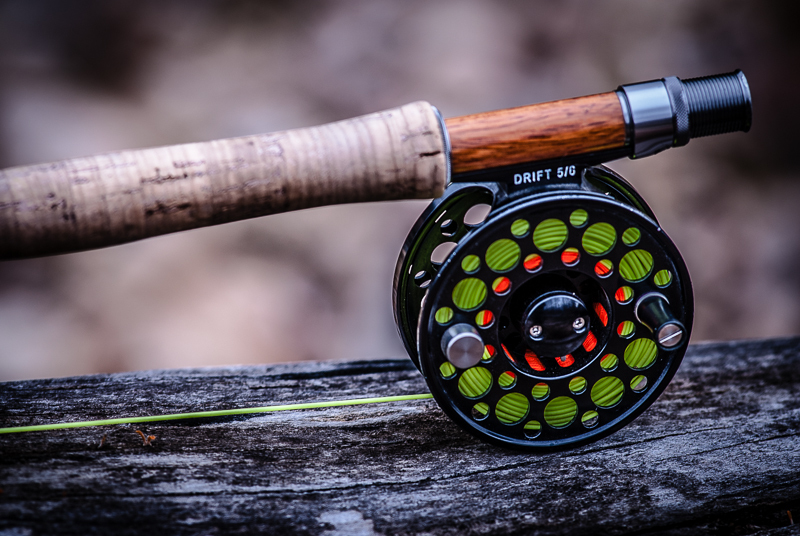 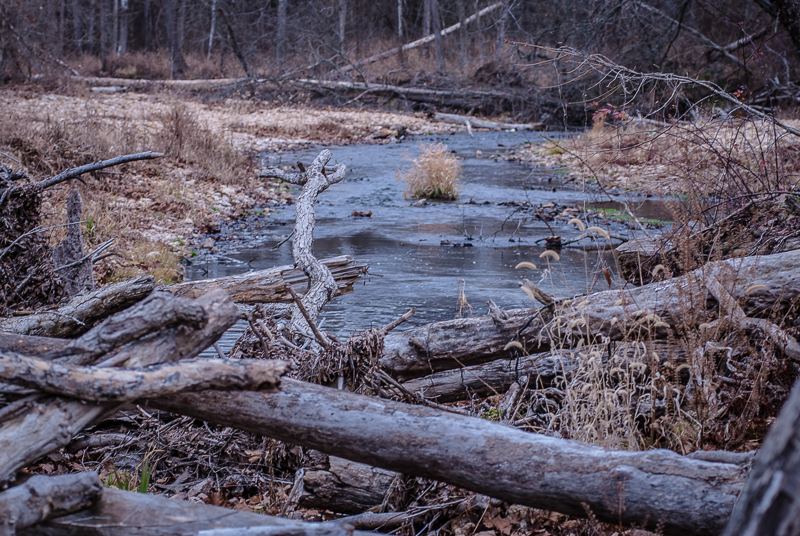 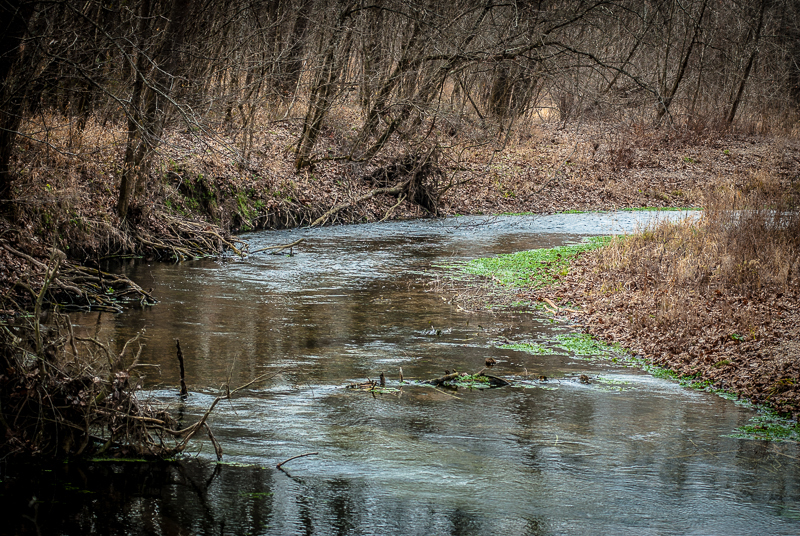 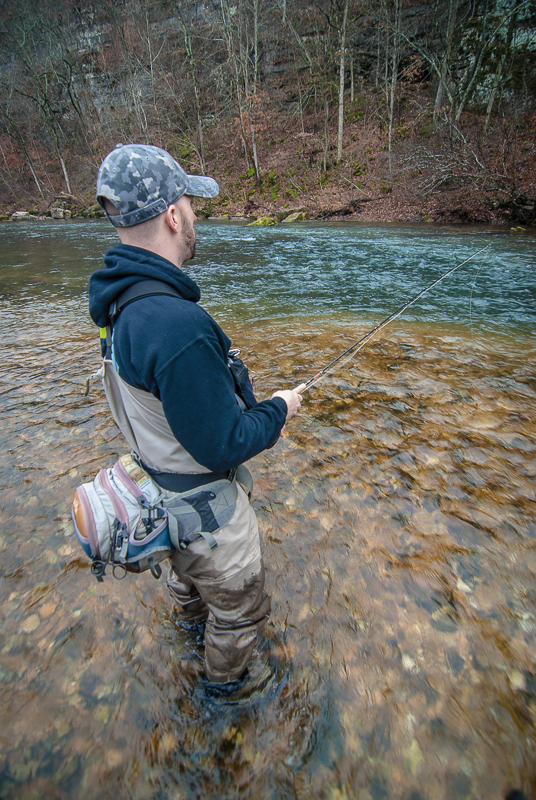 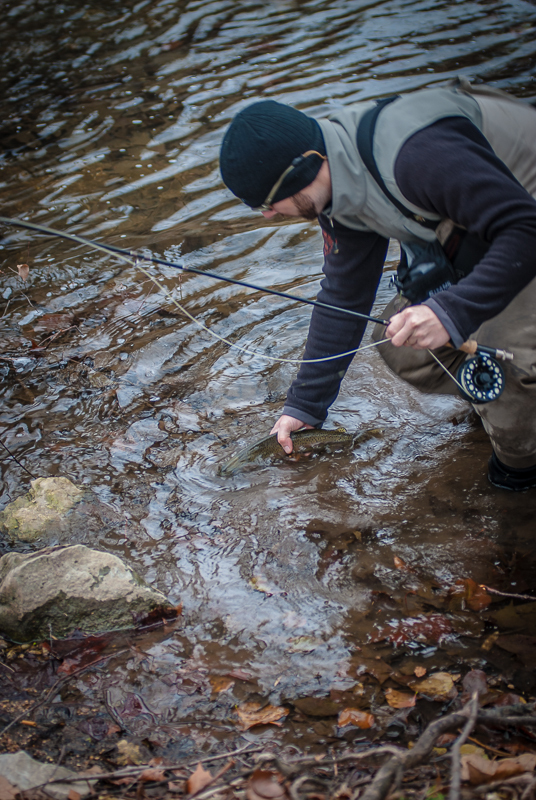 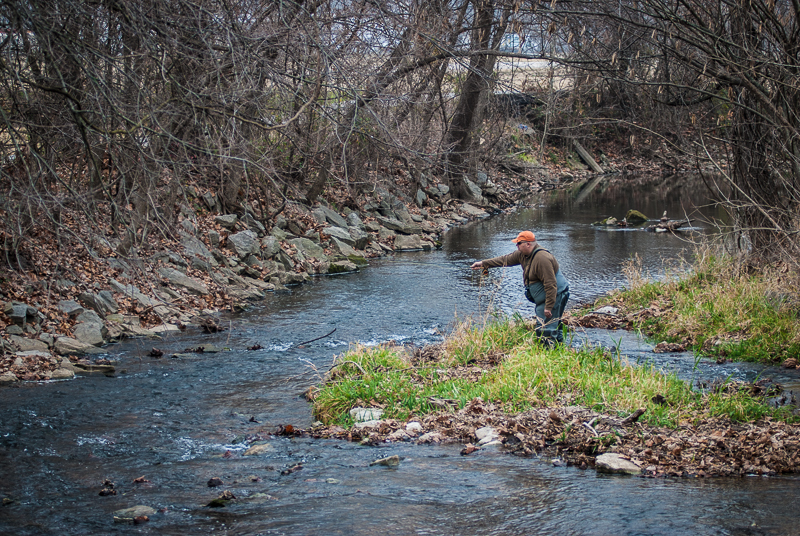 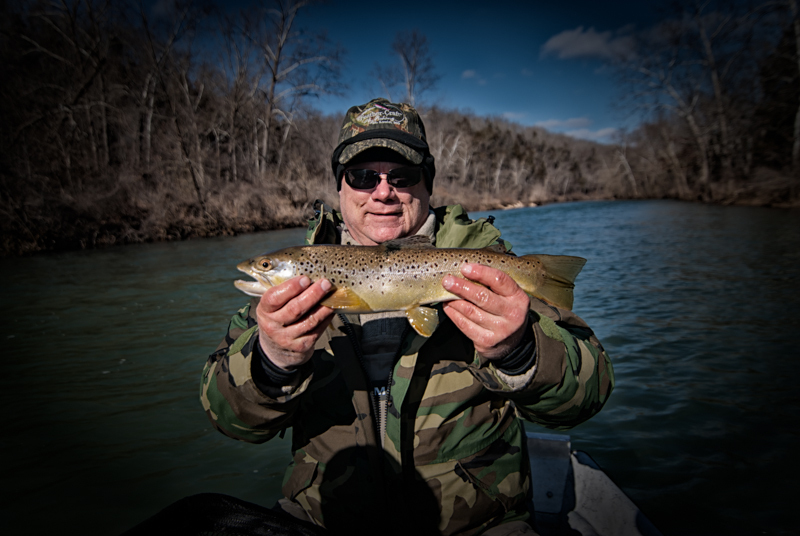 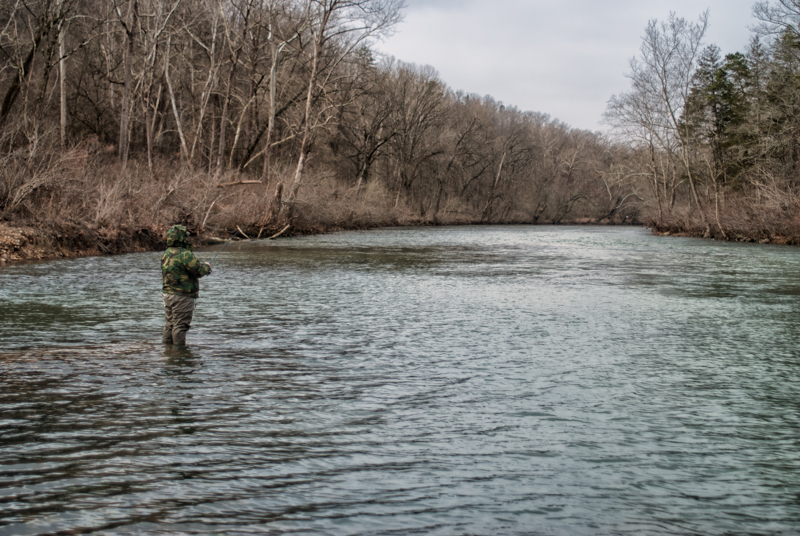 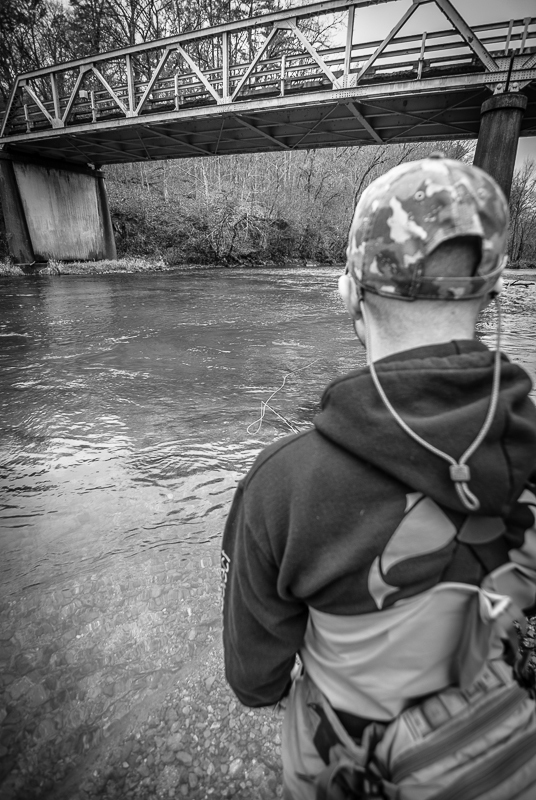 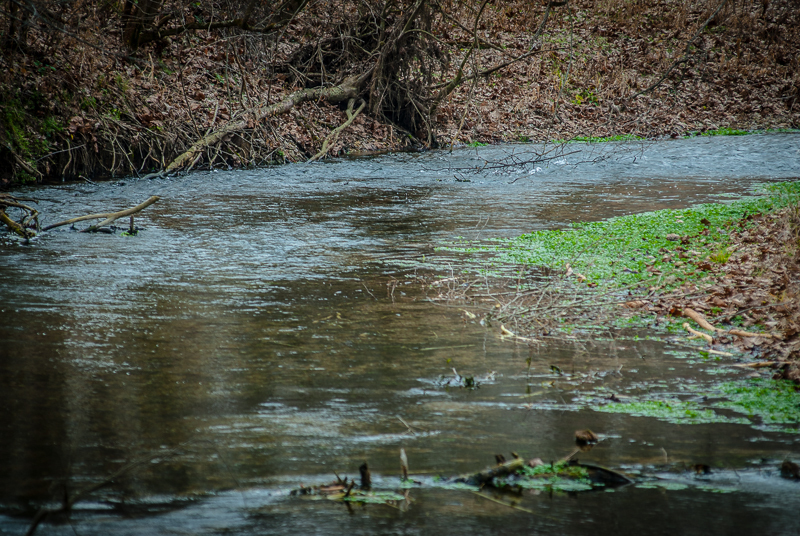 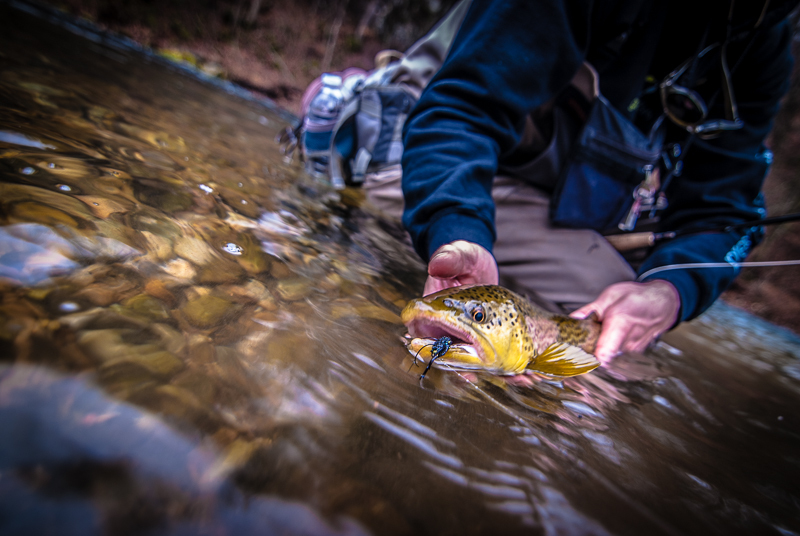 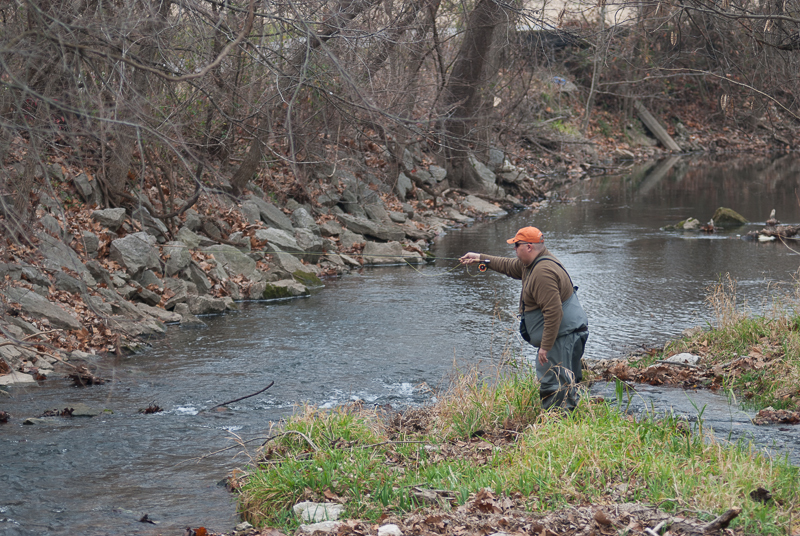 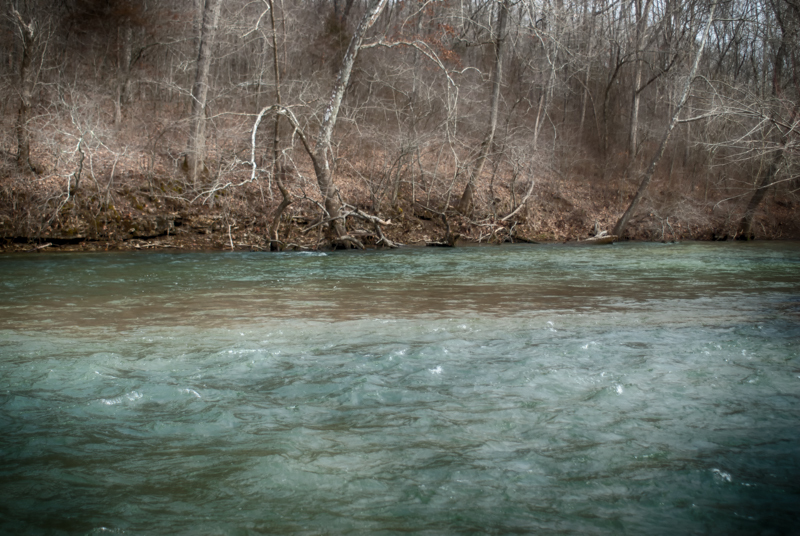 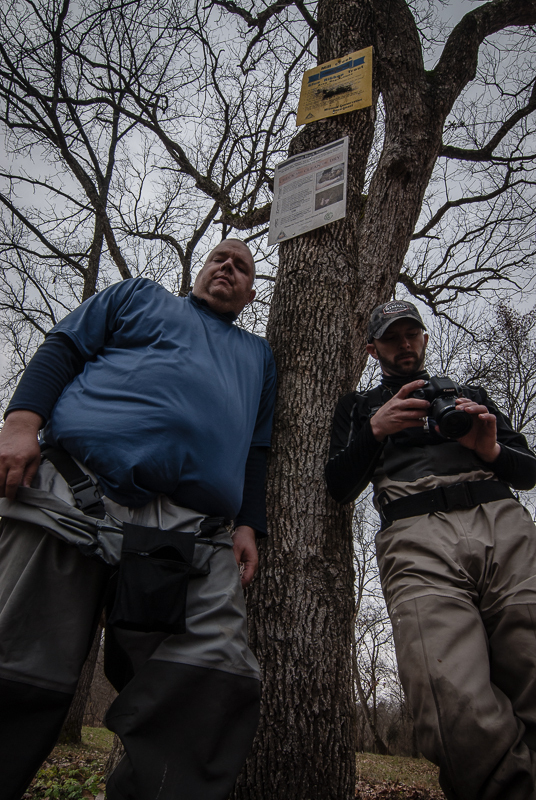 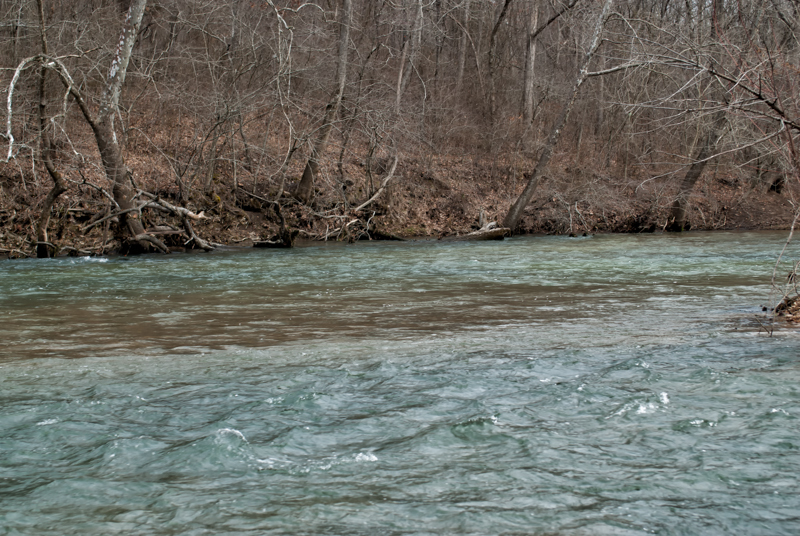 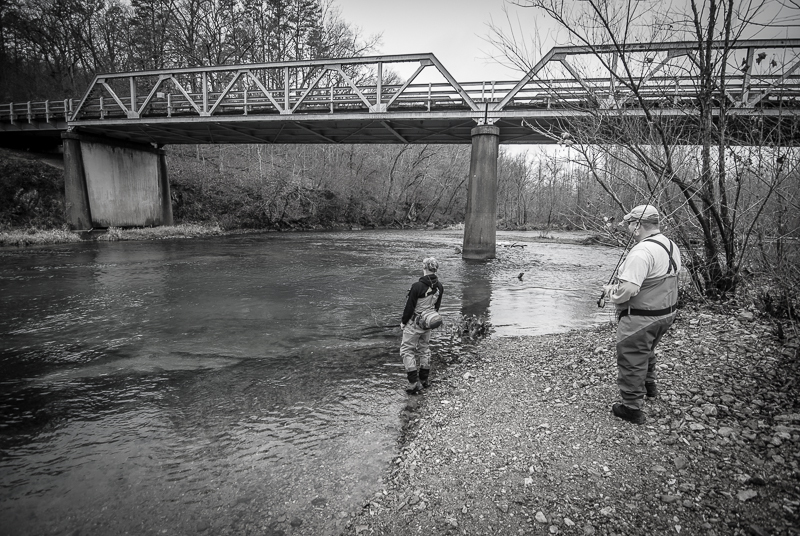 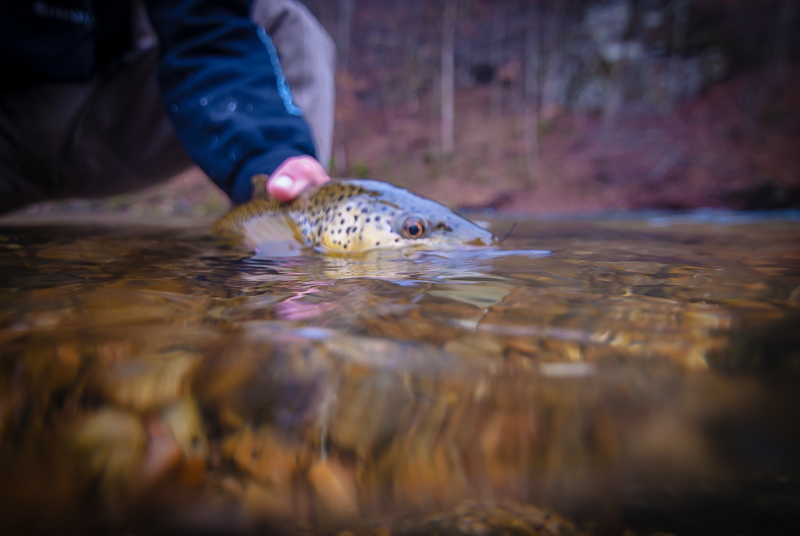 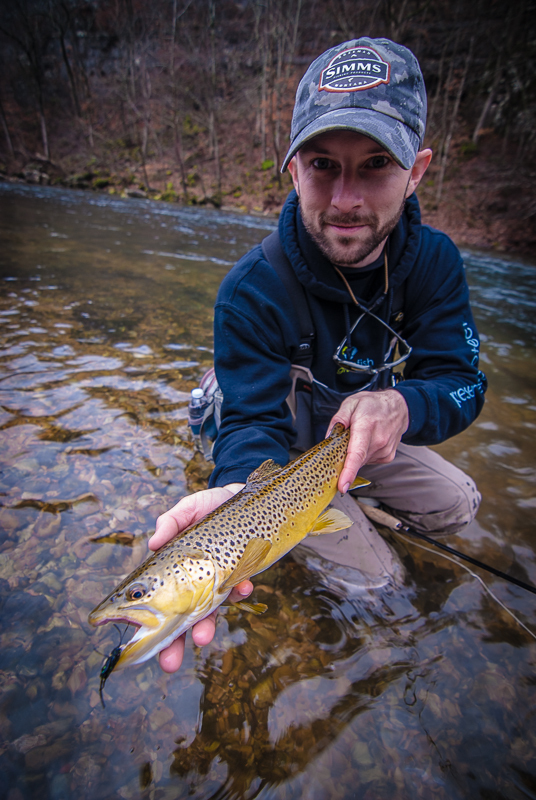 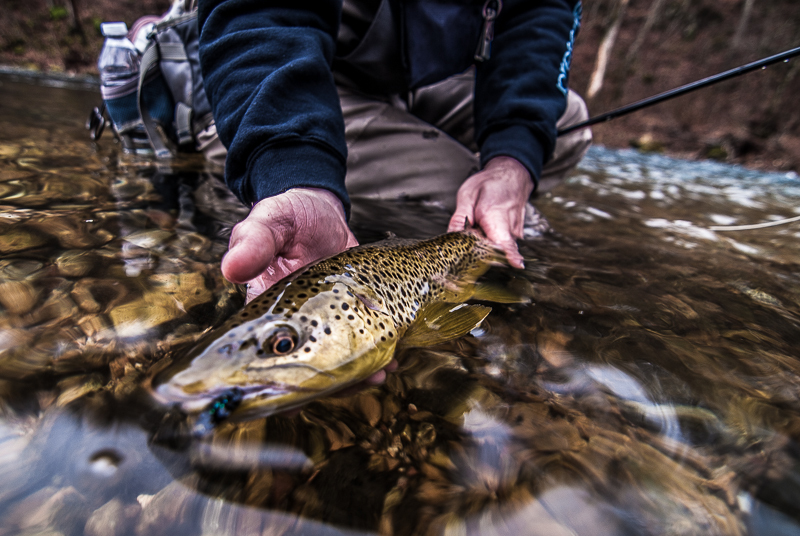 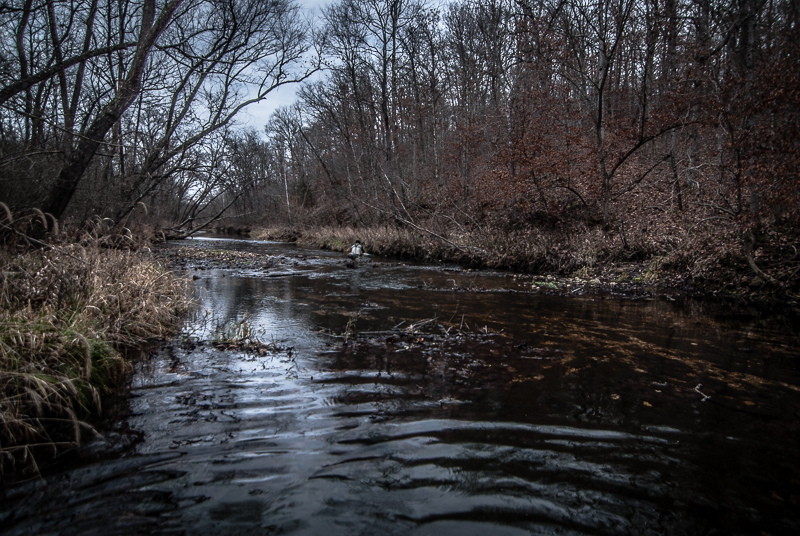 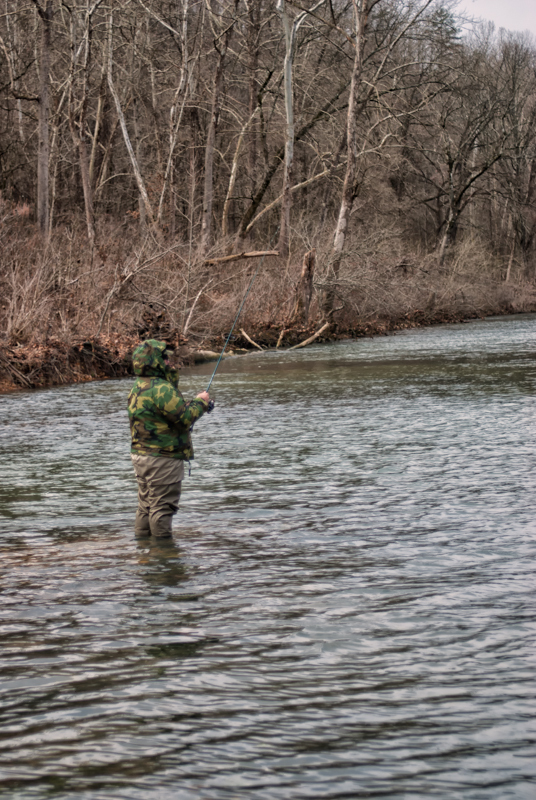 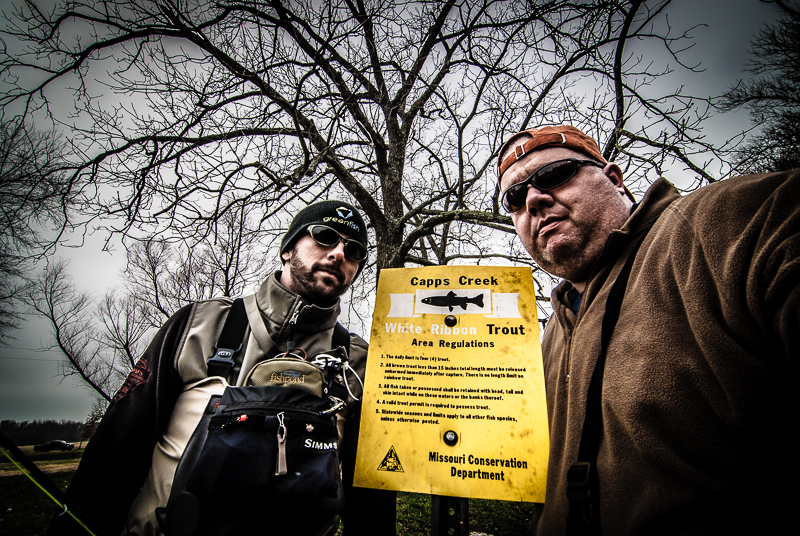 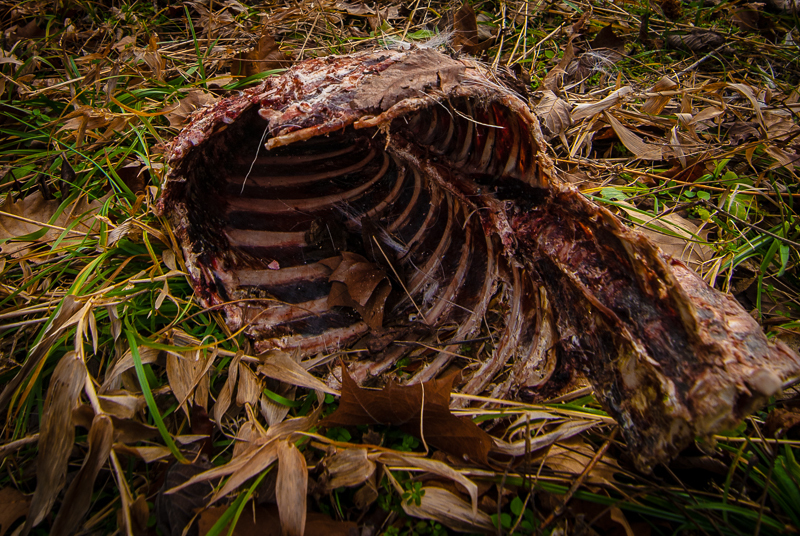 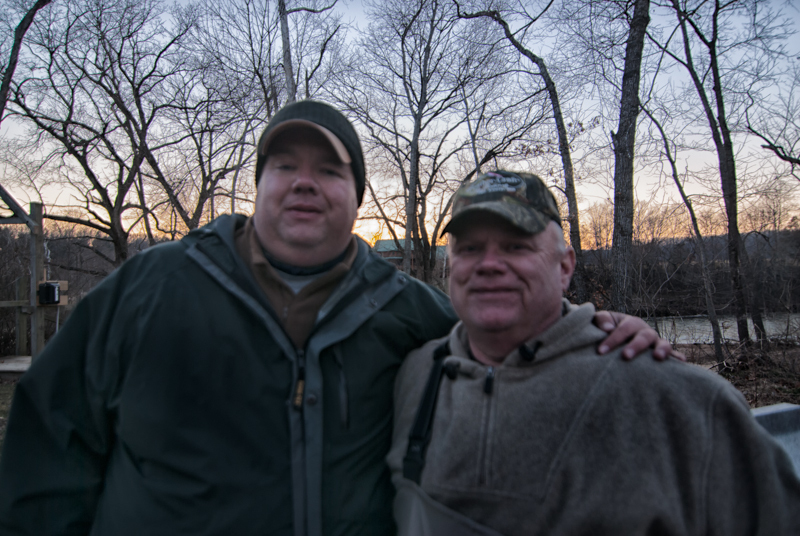 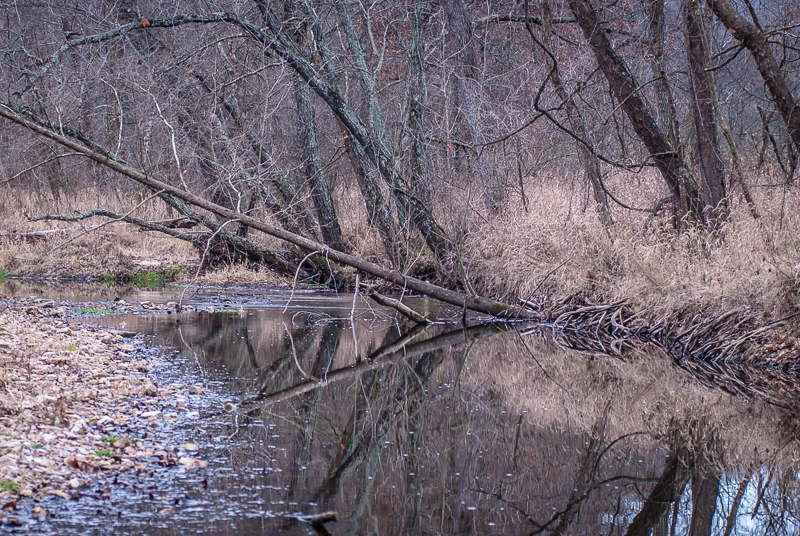 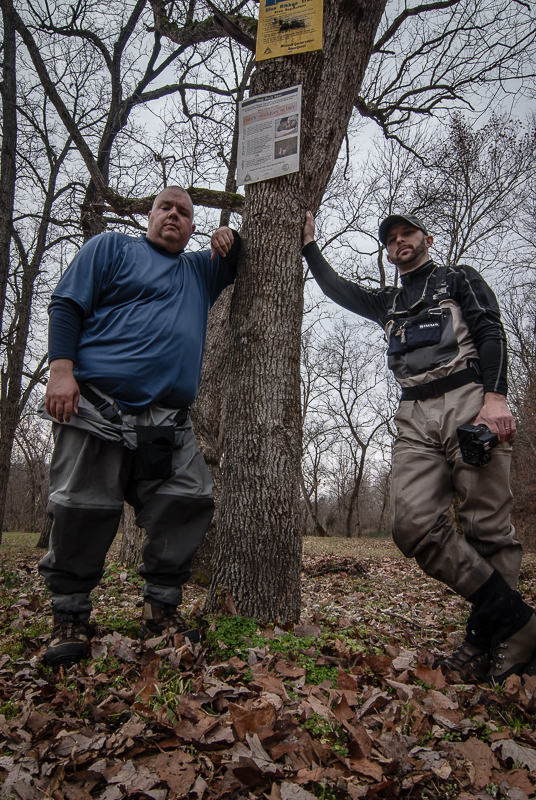 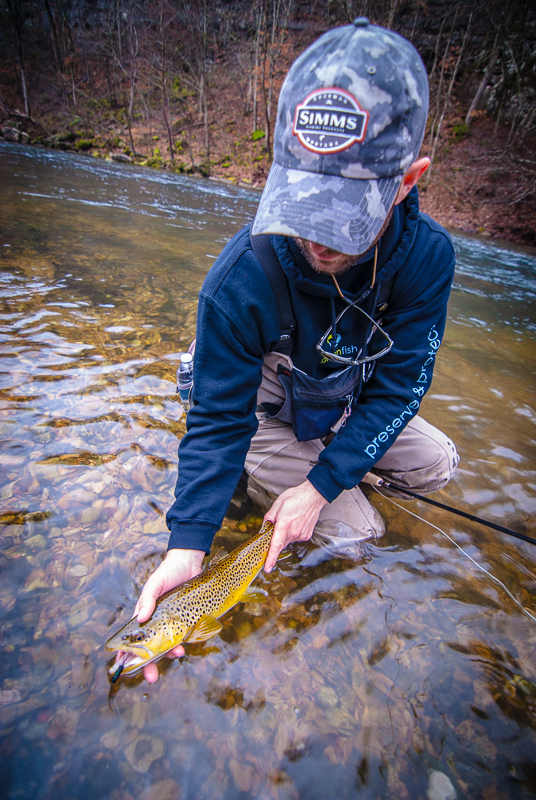 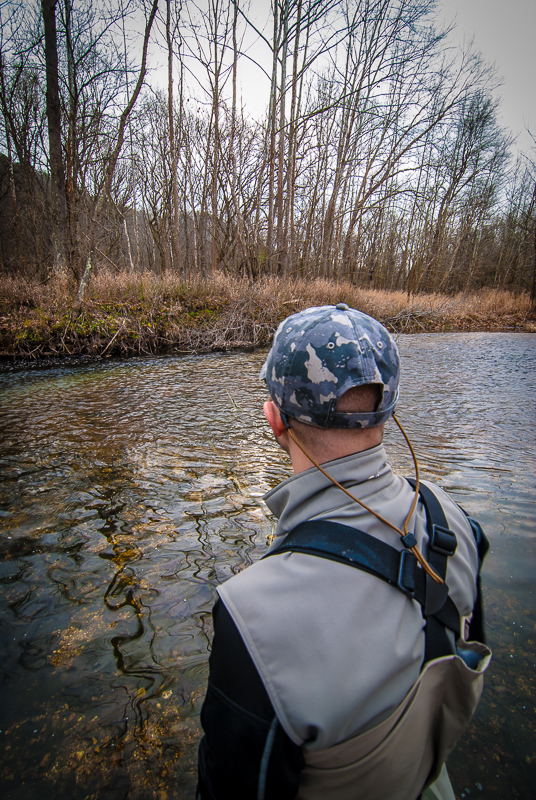 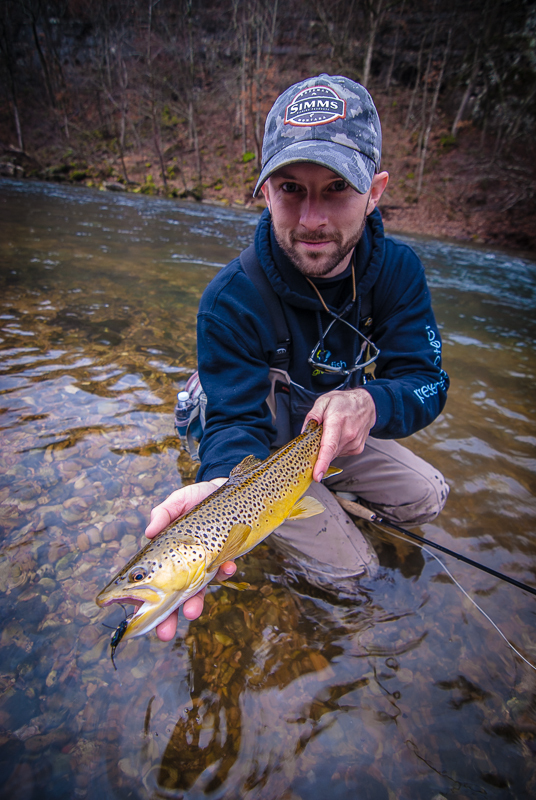 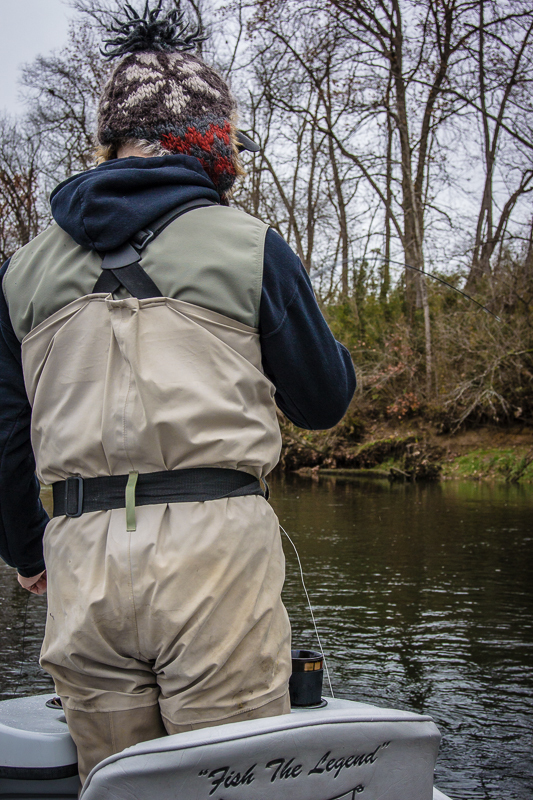 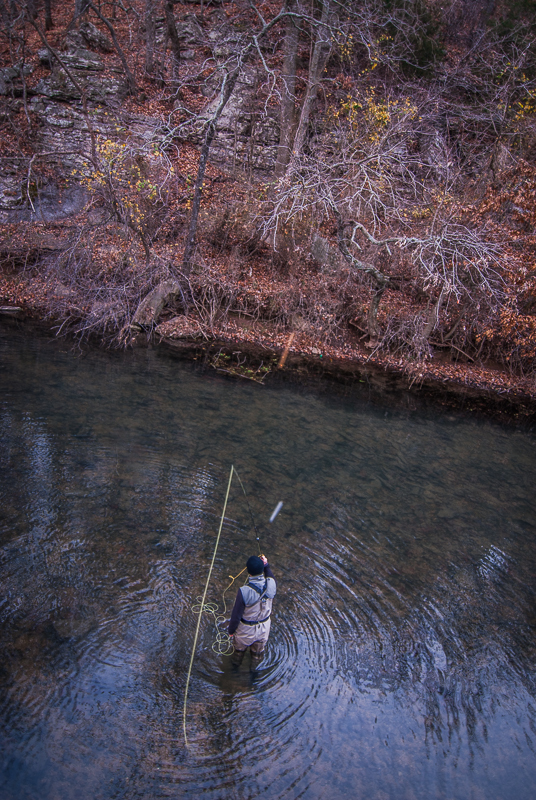 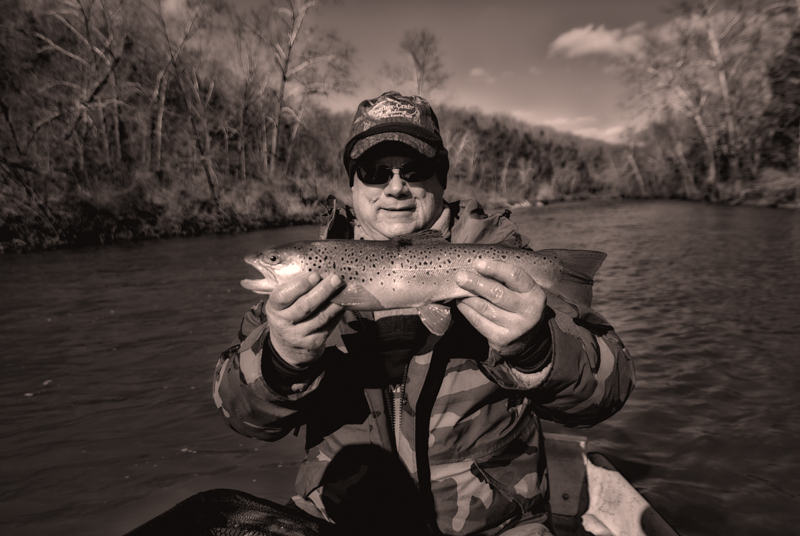 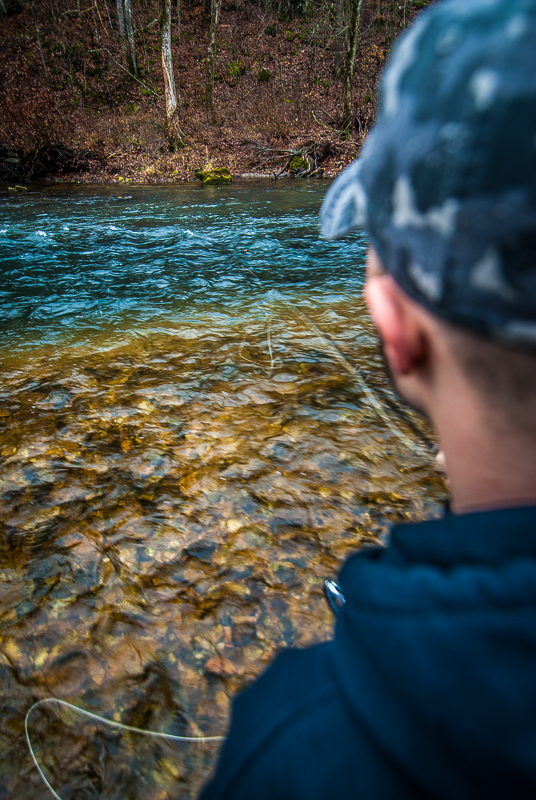 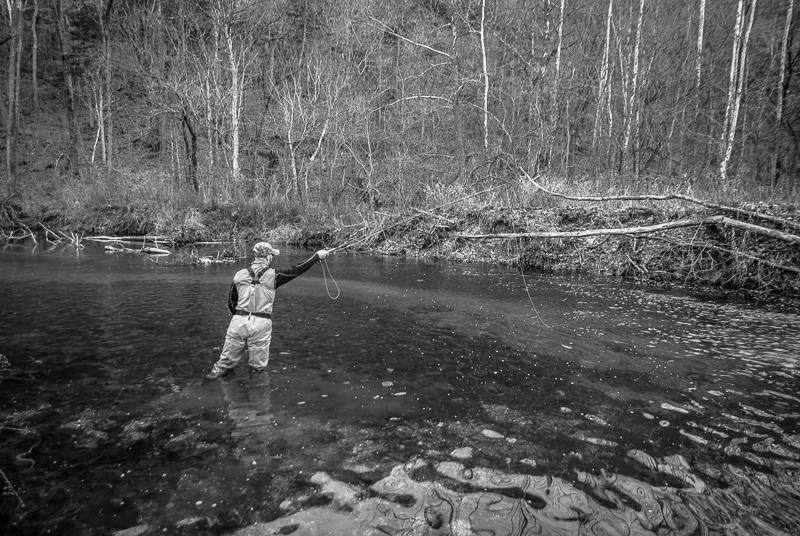 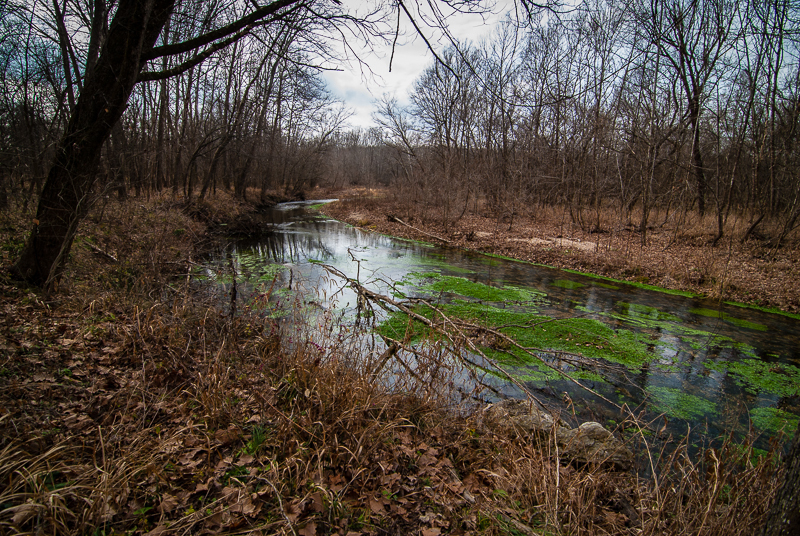 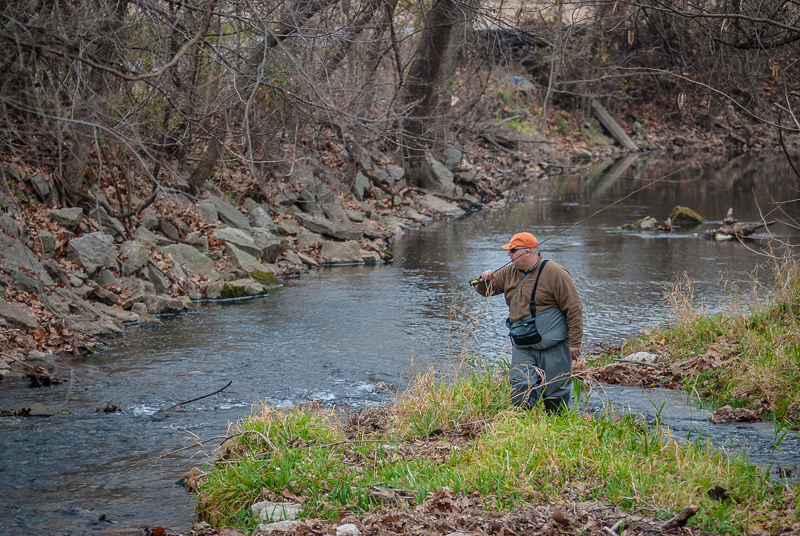 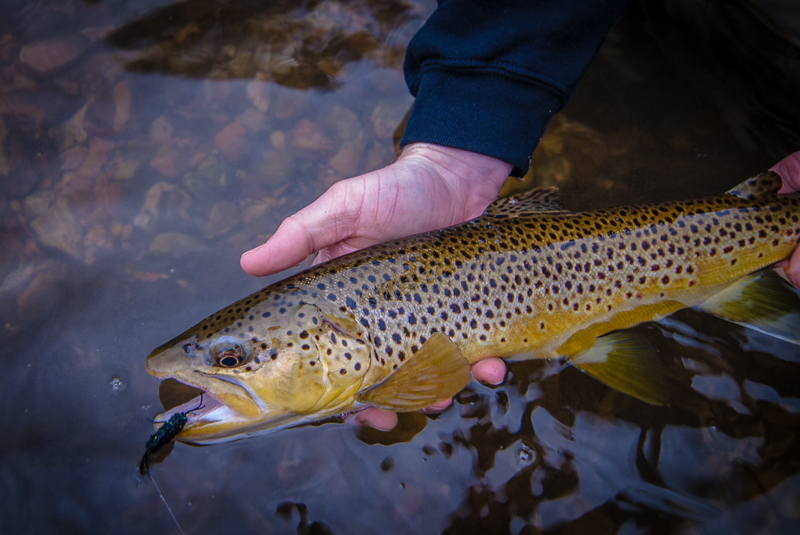 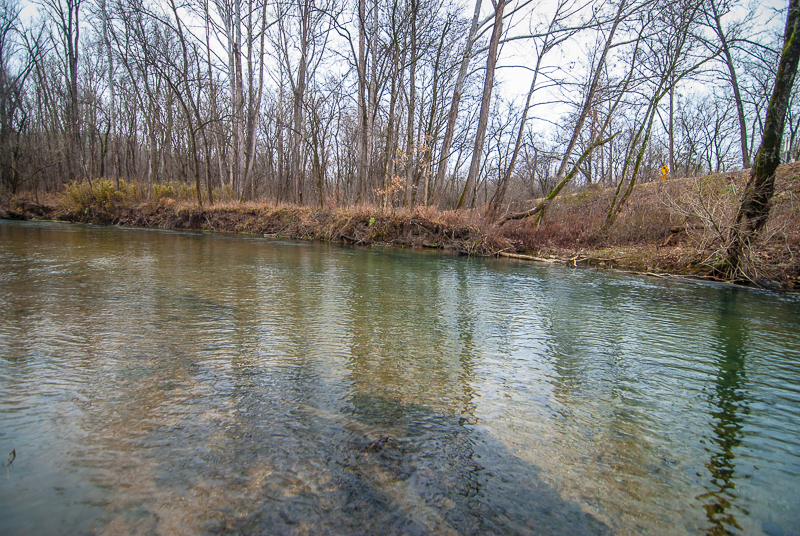 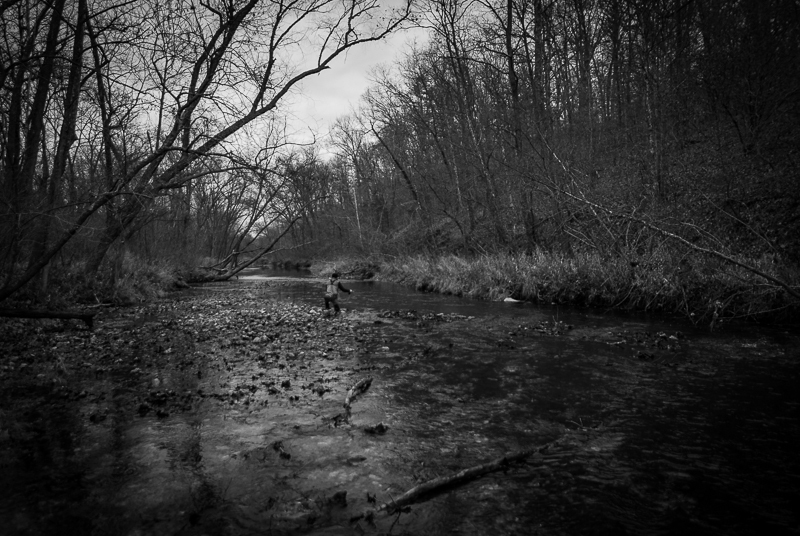 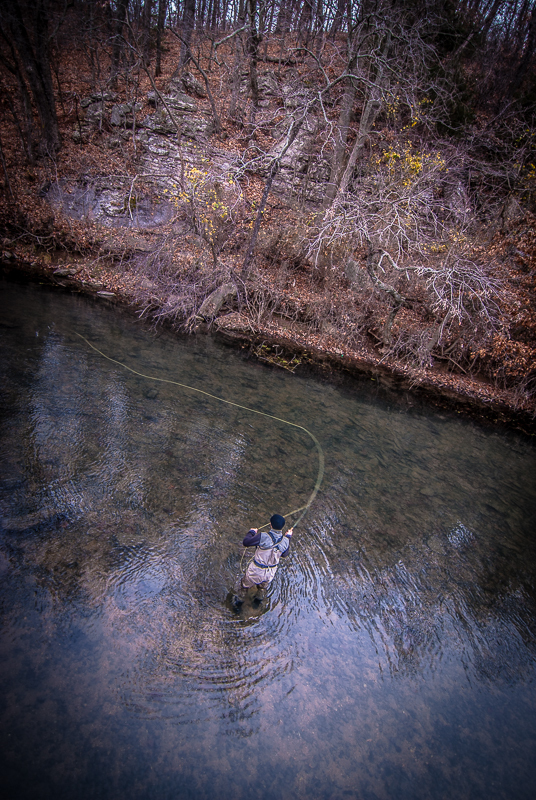 Hickory Creek was the most surprising creek of this year’s MTO with several big fish presenting opportunities to both Wise and I (with no love, other than a hookup or two). 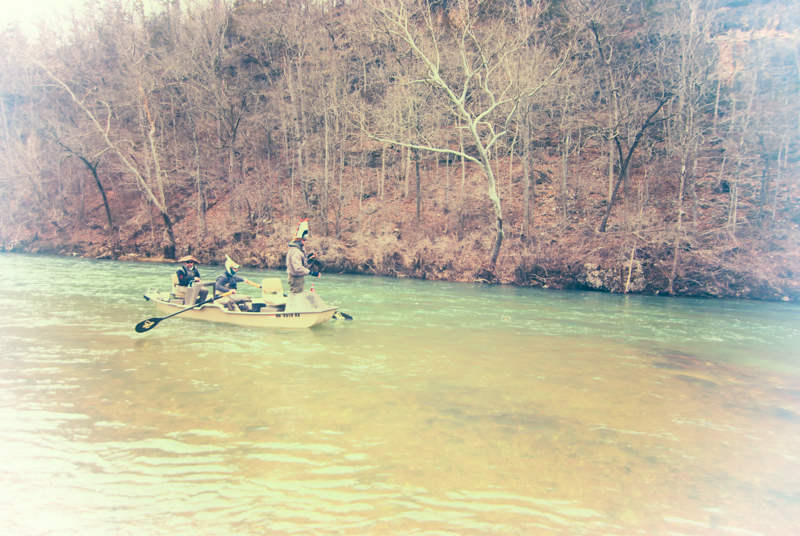 This was our longer driving day, and had us after finishing up at Roaring River, heading over to Taneycomo for some quick night fishing. 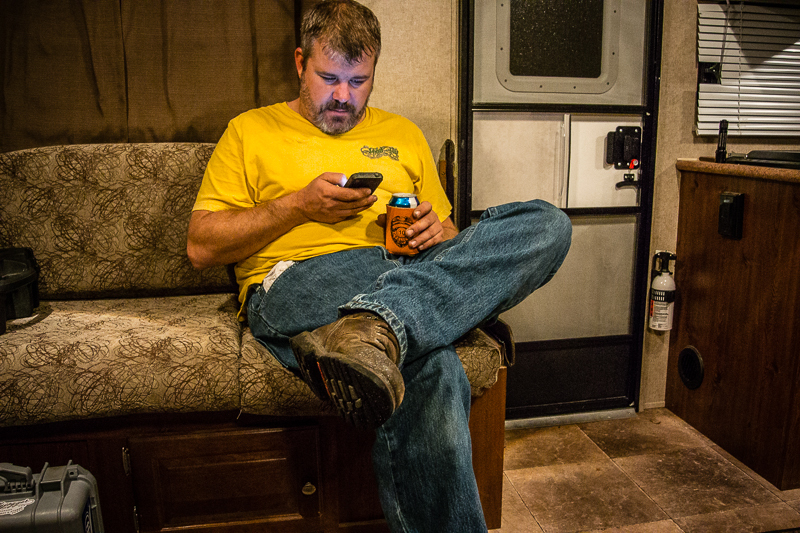 It was a long day, with more mexican food and lots of windshield time. 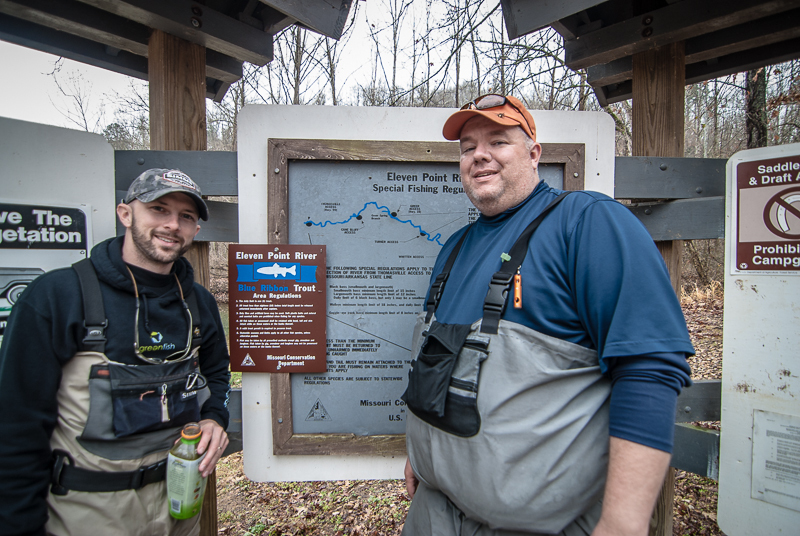 On Day 3 we covered Hickory Creek, Capps Creek, Crane Creek, Roaring River, and Roaring River Trout Park, and Lake Taneycomo. 6 more streams covered, for 17 total fished in 3 days. 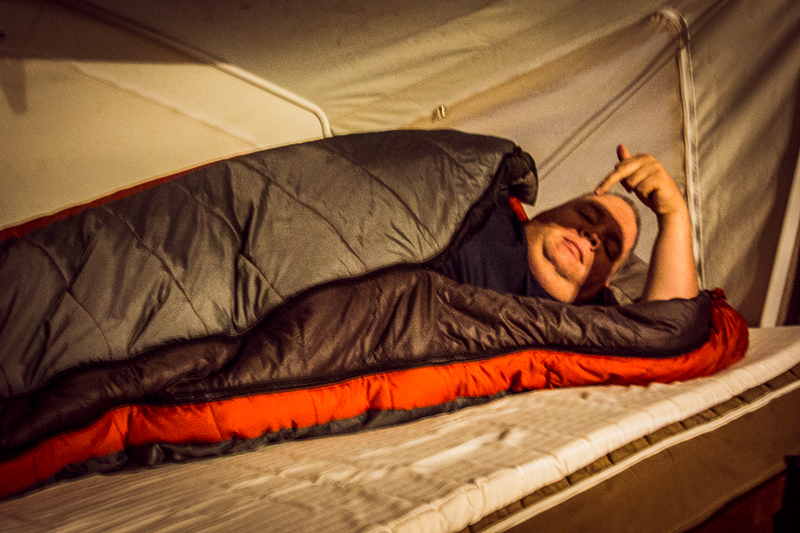 Here are the photos from Day 3.